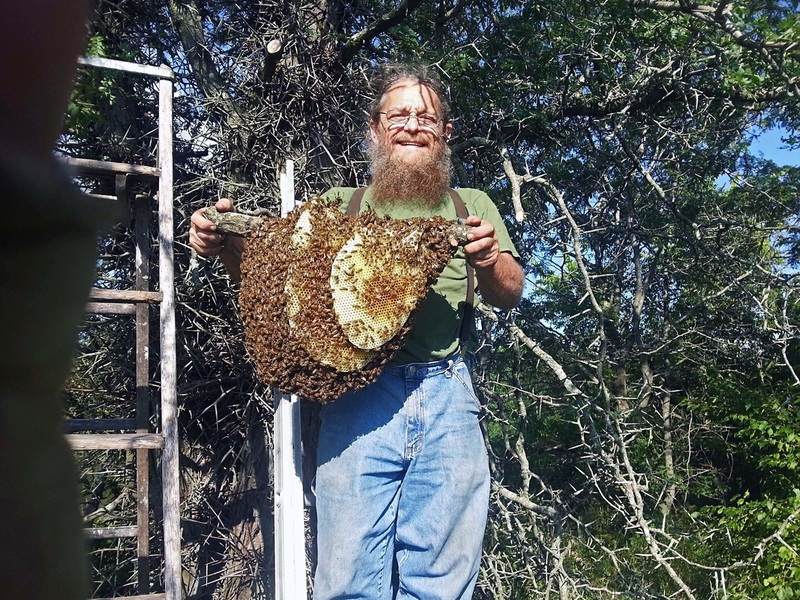 The first words I usually hear when someone talks to me about unwanted bees are, "I've got a swarm of bees and I really don't want to kill them." 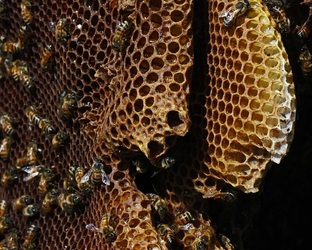 I just love to hear that, especially the second part! 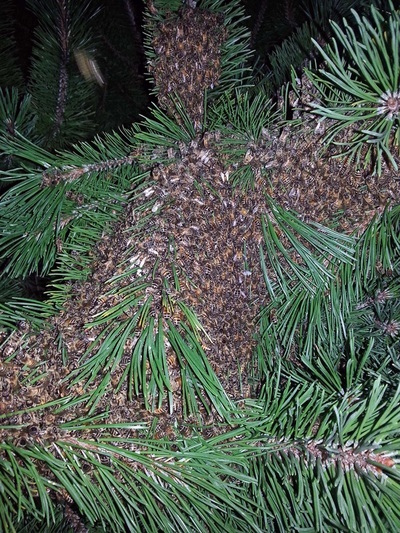 This can turn out to be real swarm that came from an established colony, usually nearby, that has landed somewhere waiting for their scouts to return with information on a new spot for them to start a new colony, or it can be an established colony living in tree or building or somewhere the people don't want them. I've divided these photos up into two main categories of Swarm Capture and Colony Removal to hopefully help folks understand the difference. 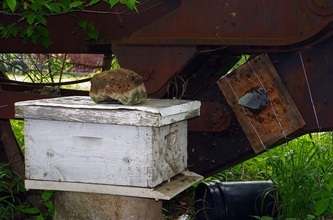 I needed to divide the second category up into the two sub-categories, Cut Outs and Trap Outs, because depending on where the established colony is located, it can be handled a couple of different ways. If the bees need to be cut out I make sure folks understand I'm a beekeeper not a carpenter. 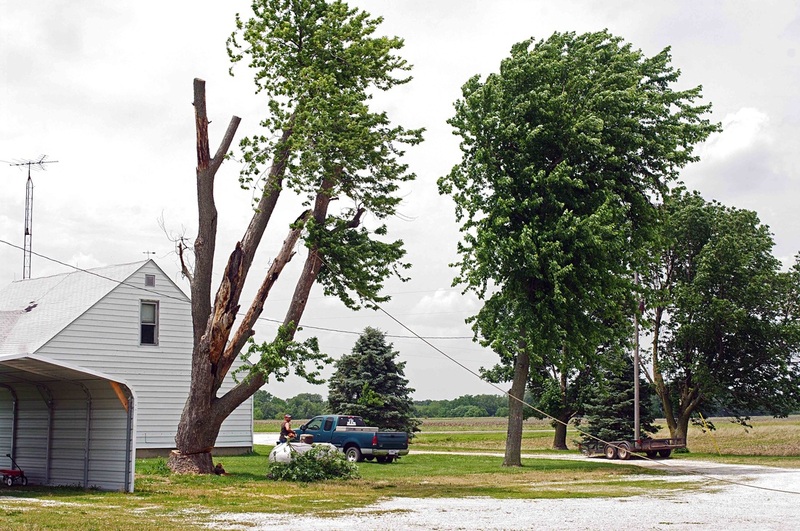 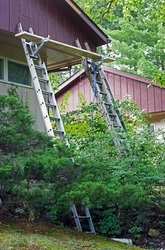 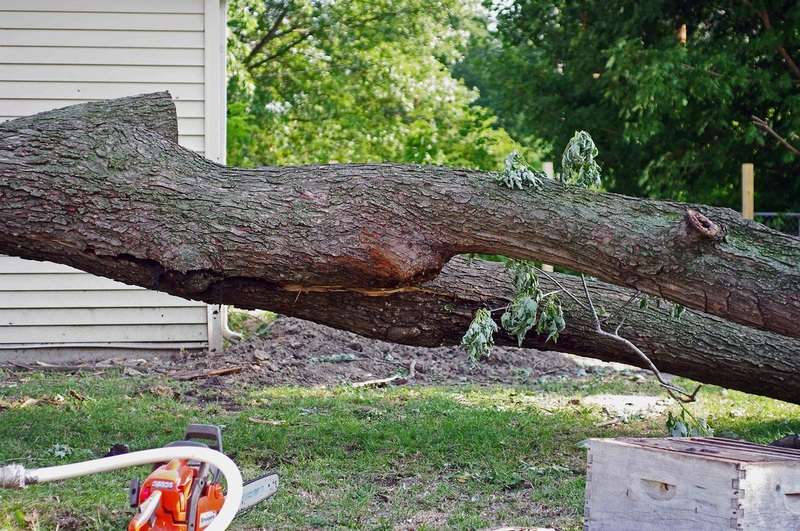 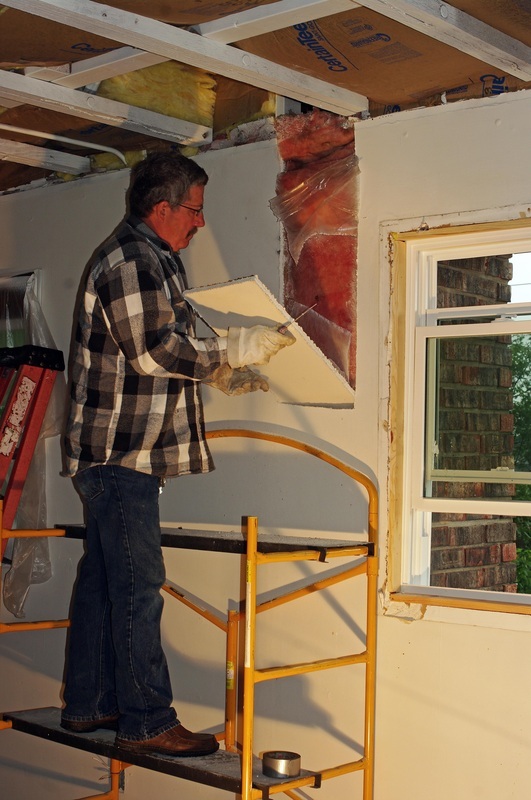 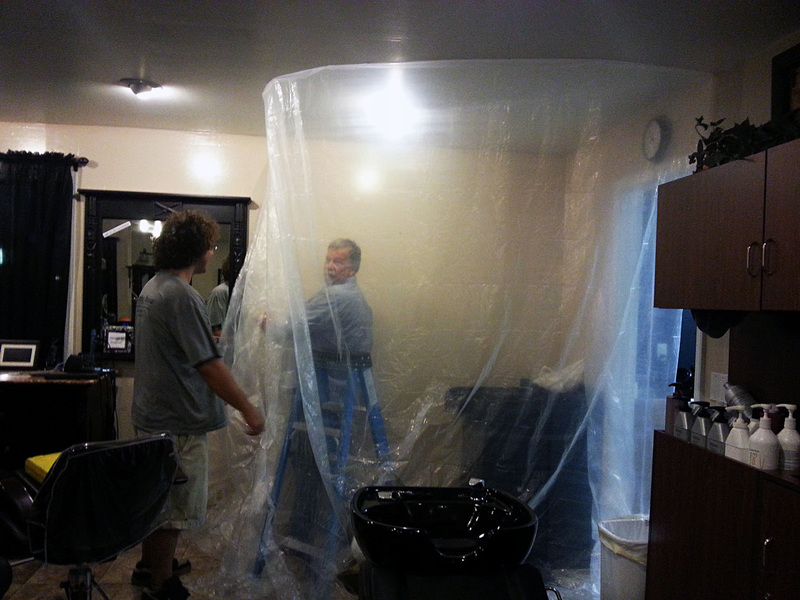 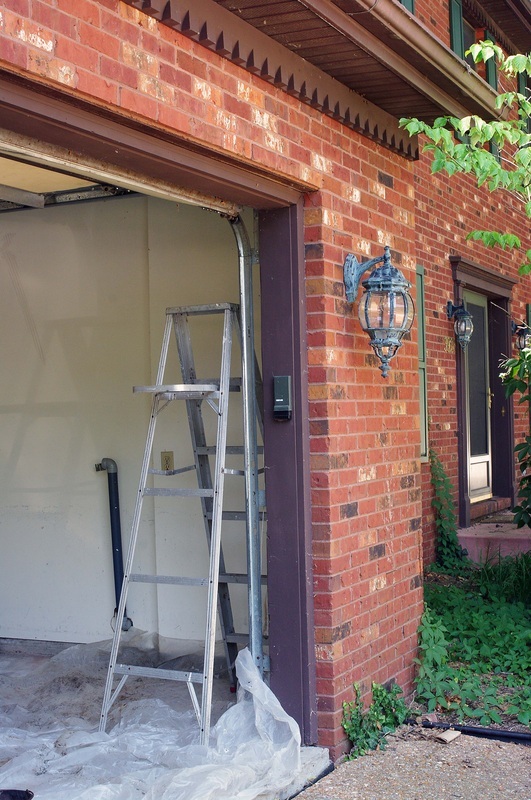 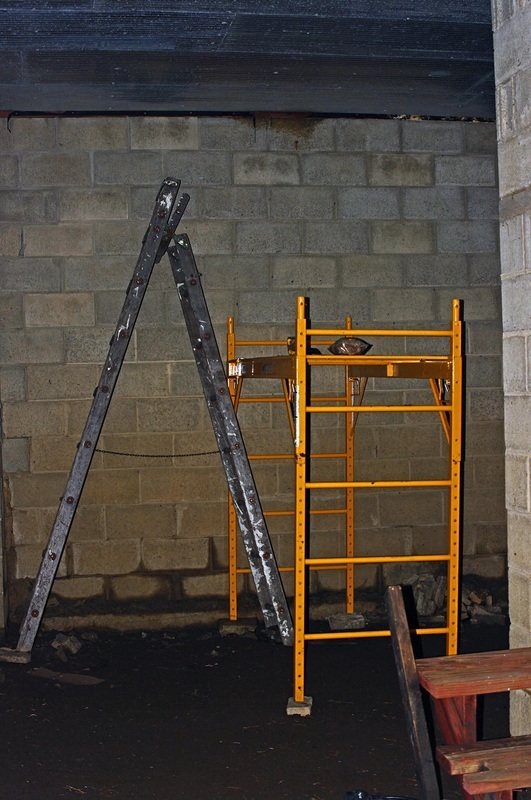 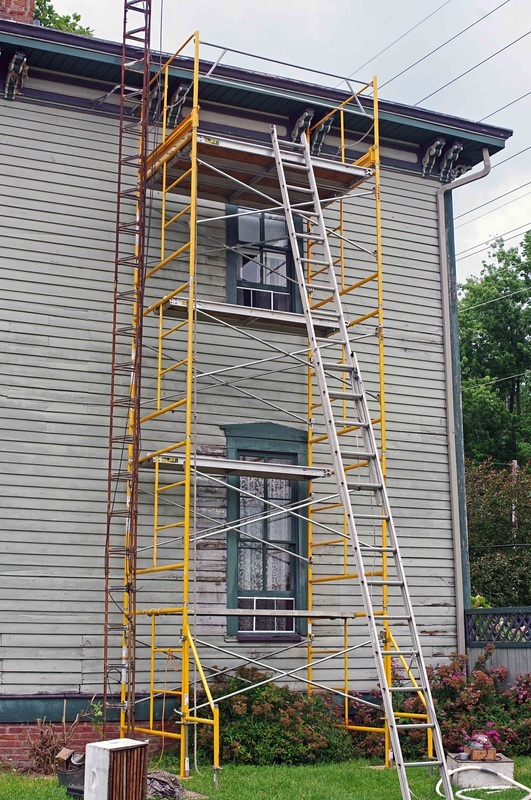 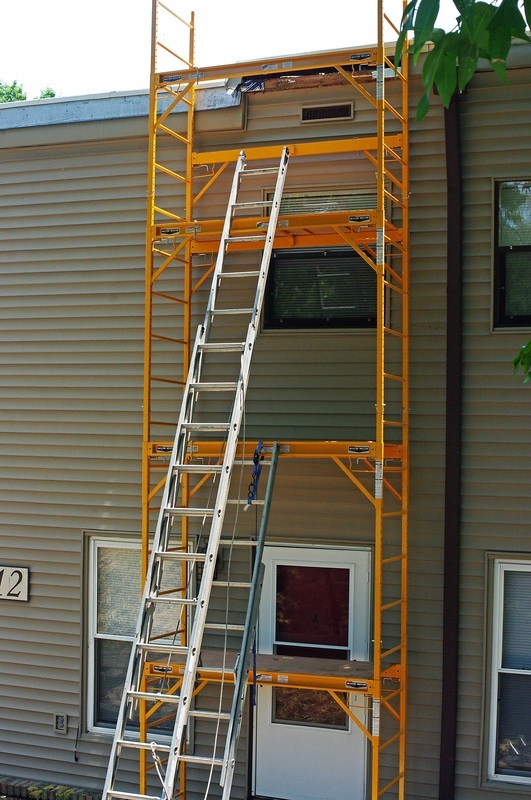 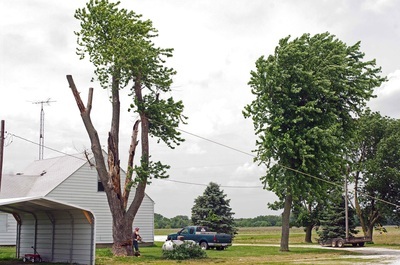 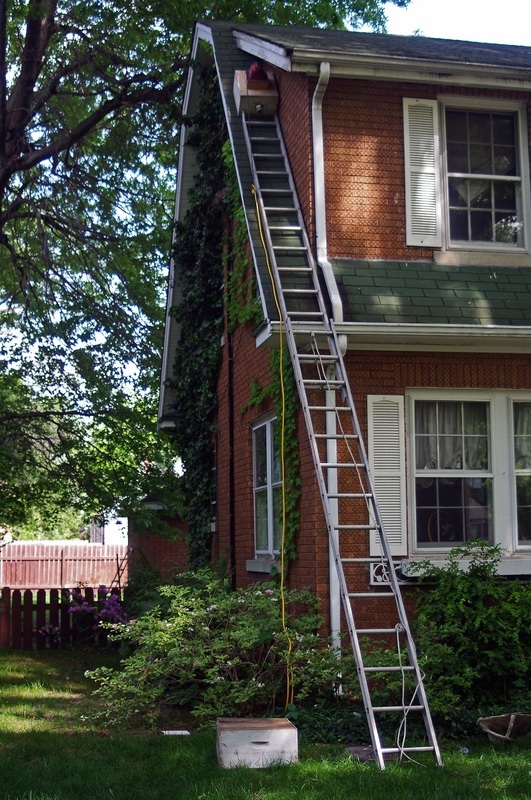 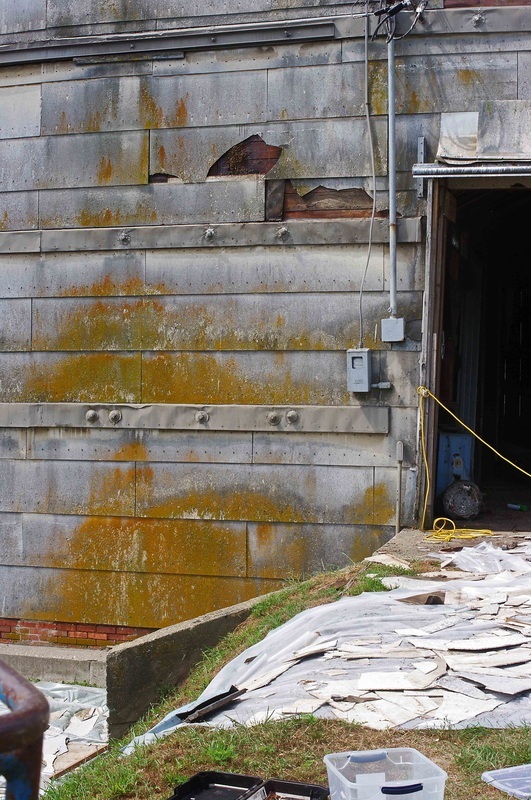 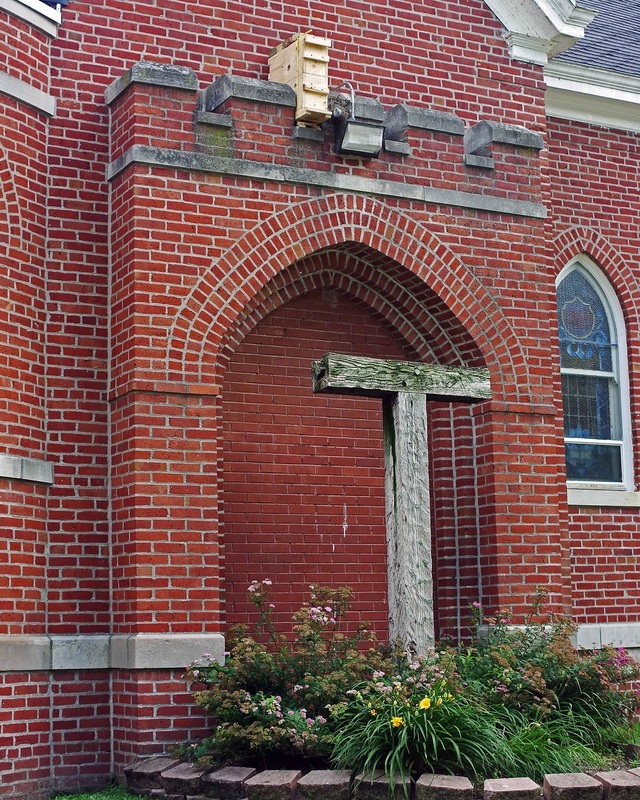 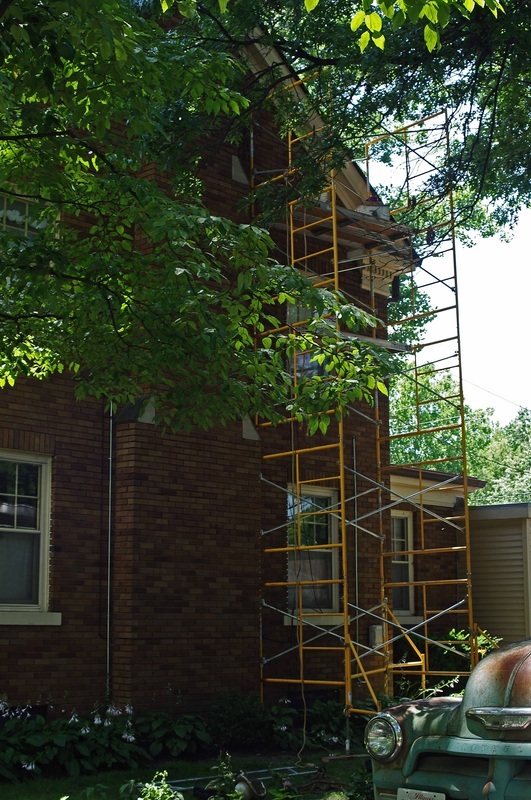 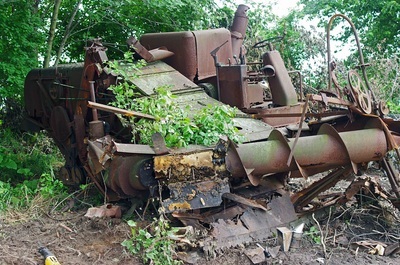 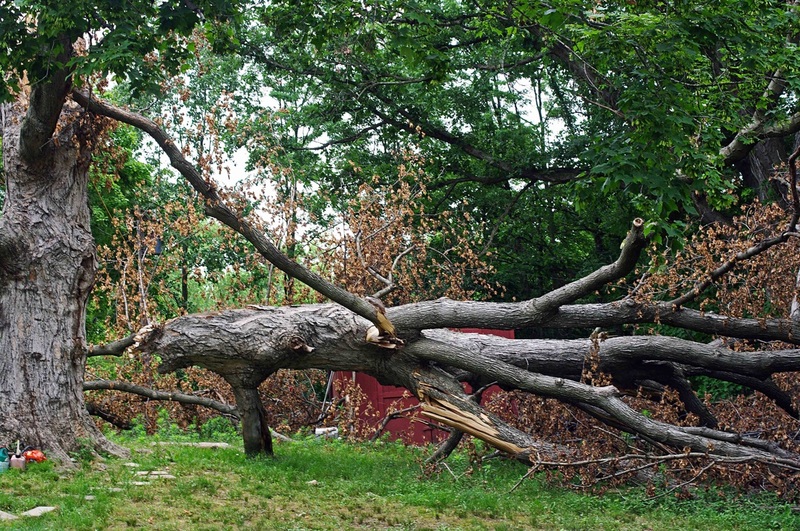 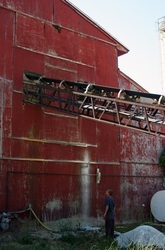 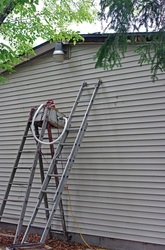 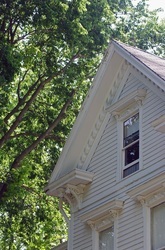 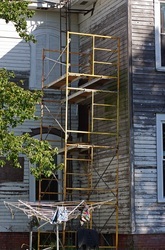 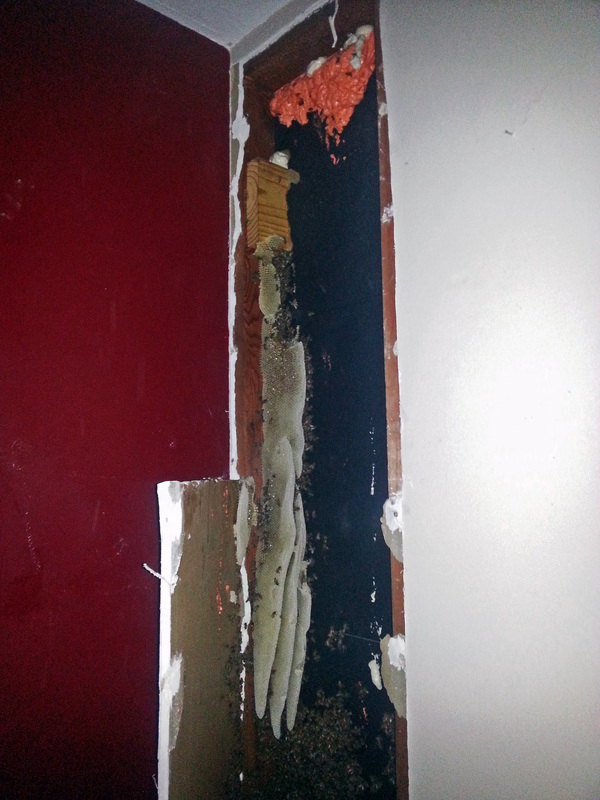 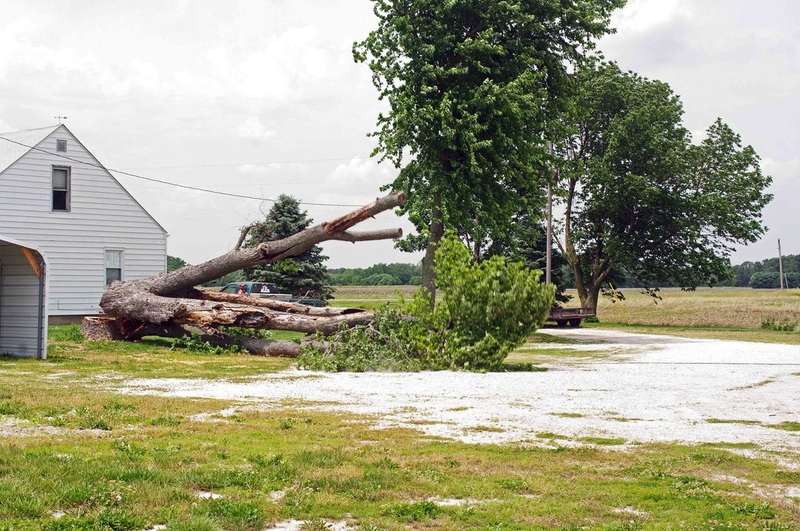 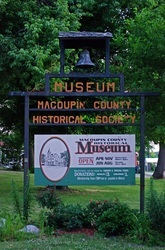 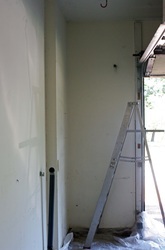 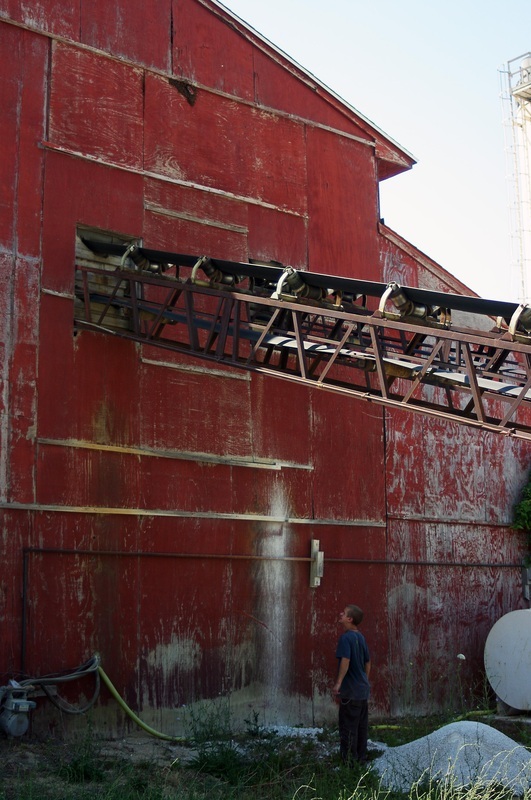 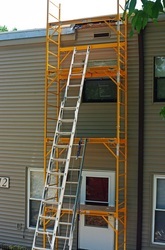 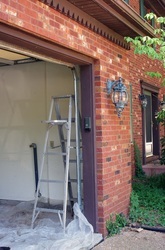 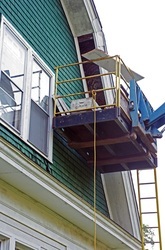 Every possible effort is taken to minimize damage to the structure. 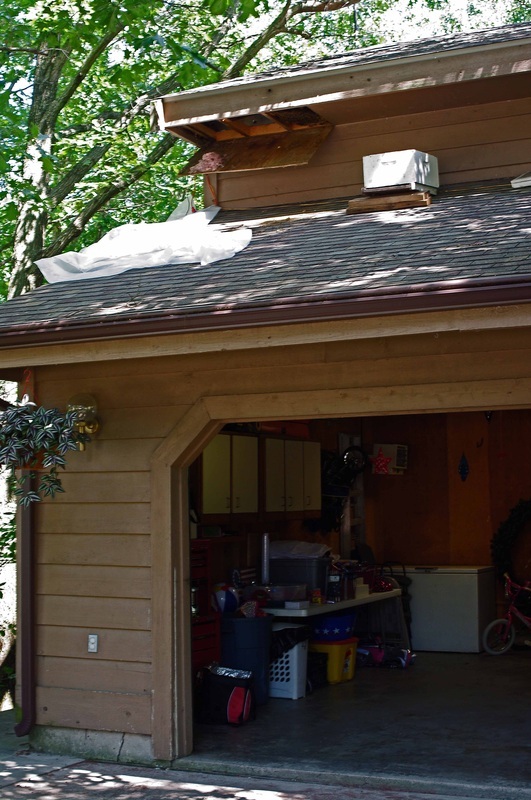 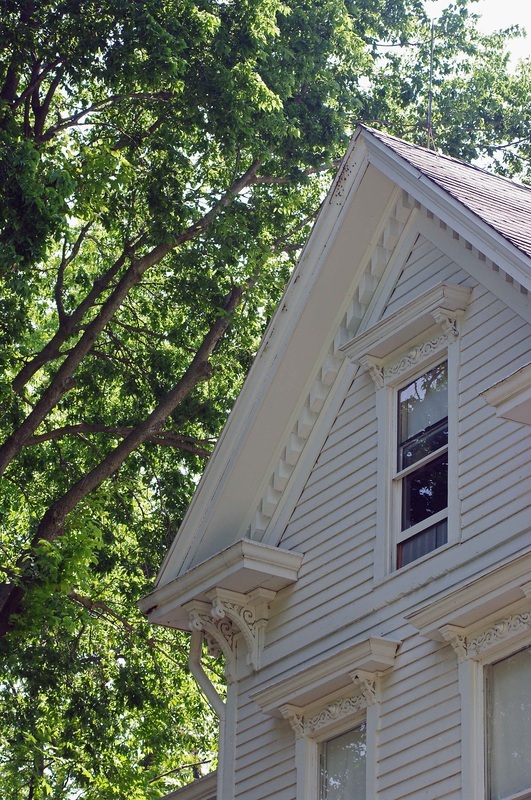 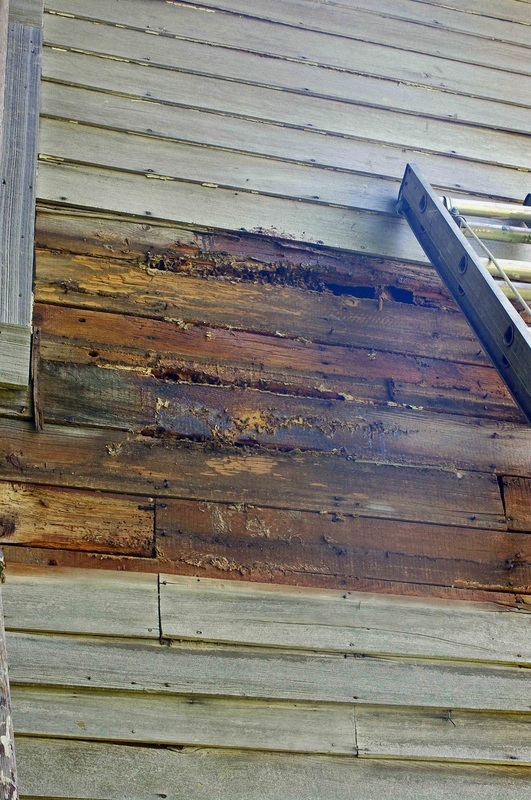 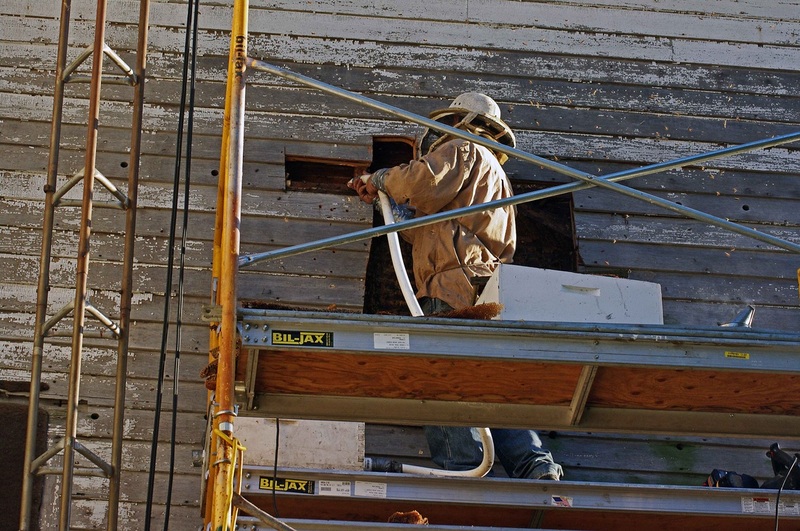 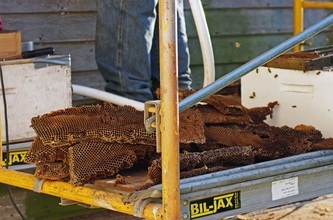 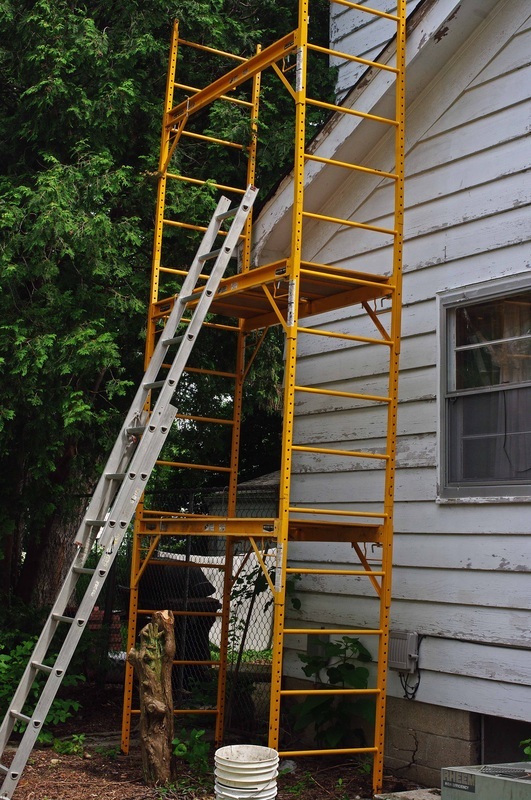 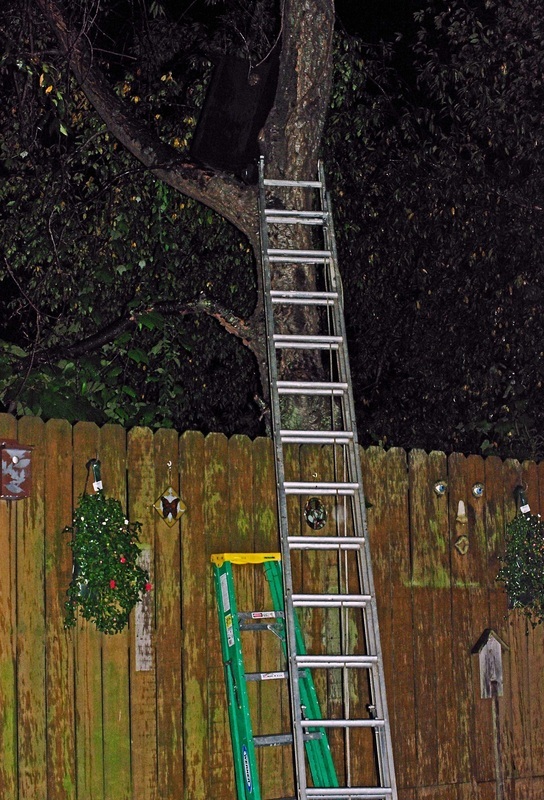 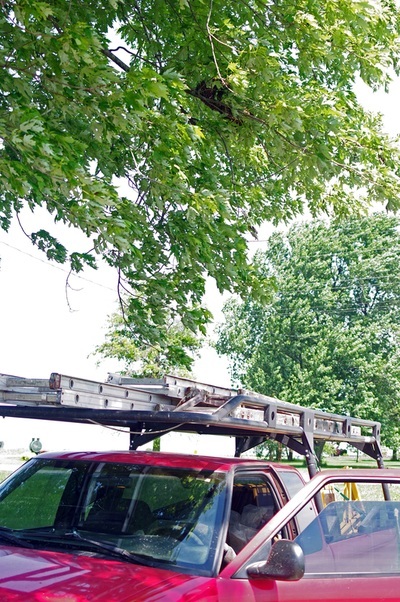 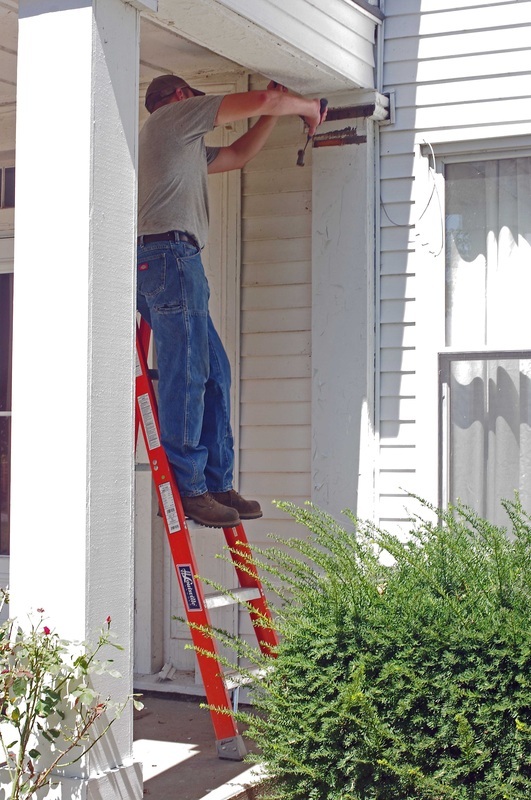 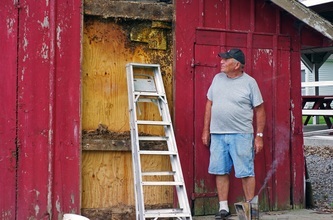 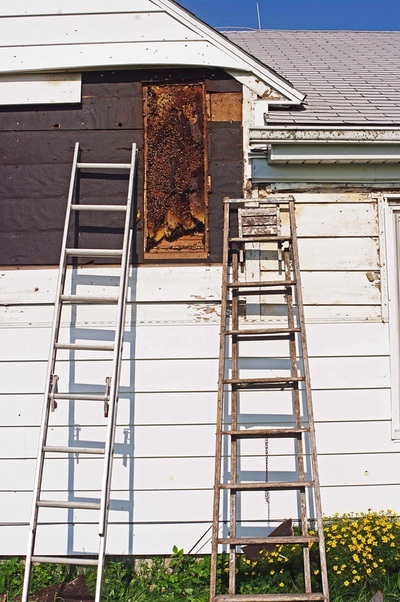 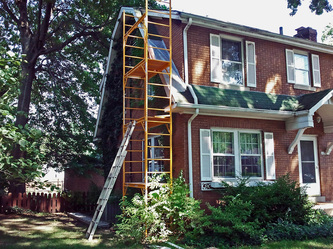 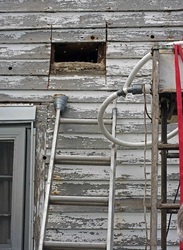 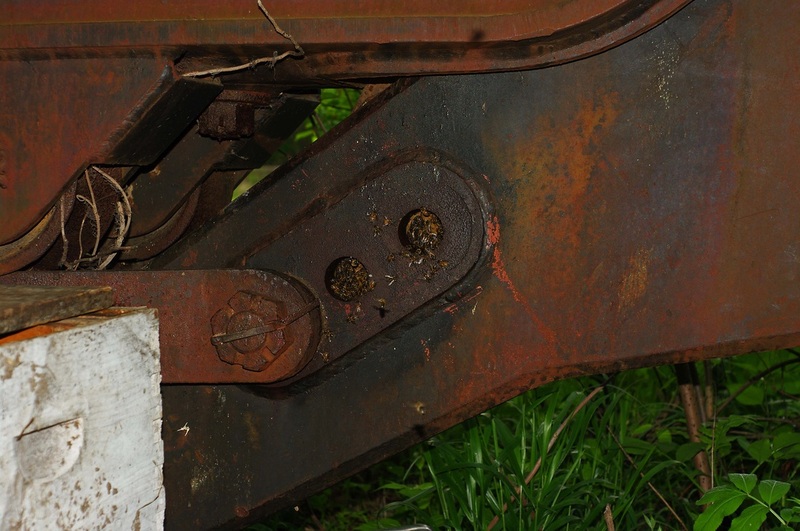 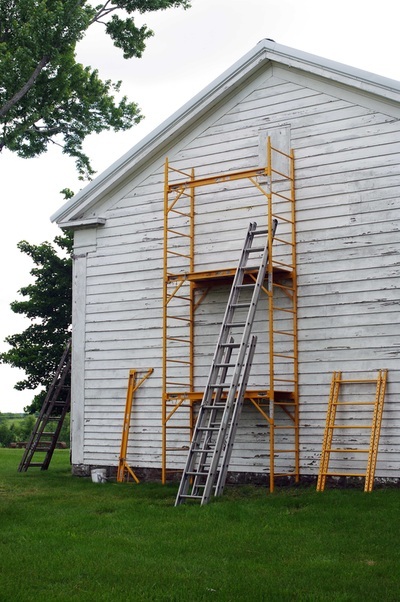 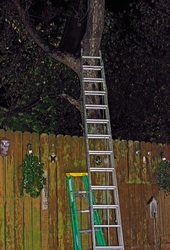 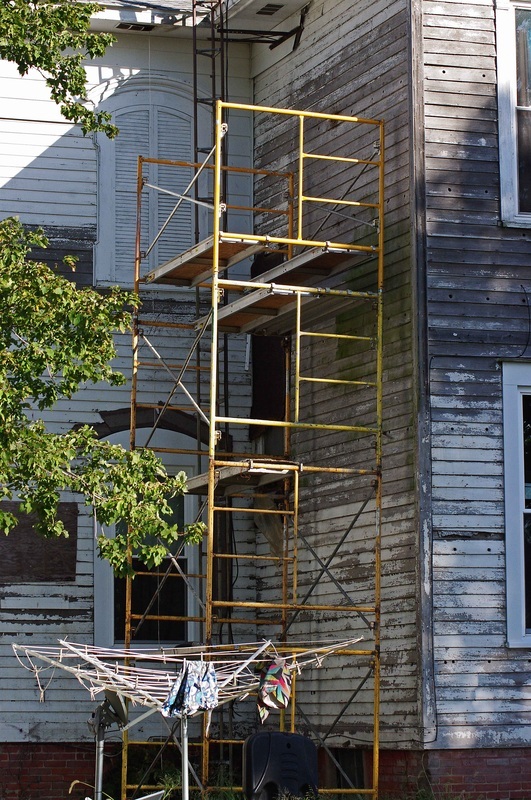 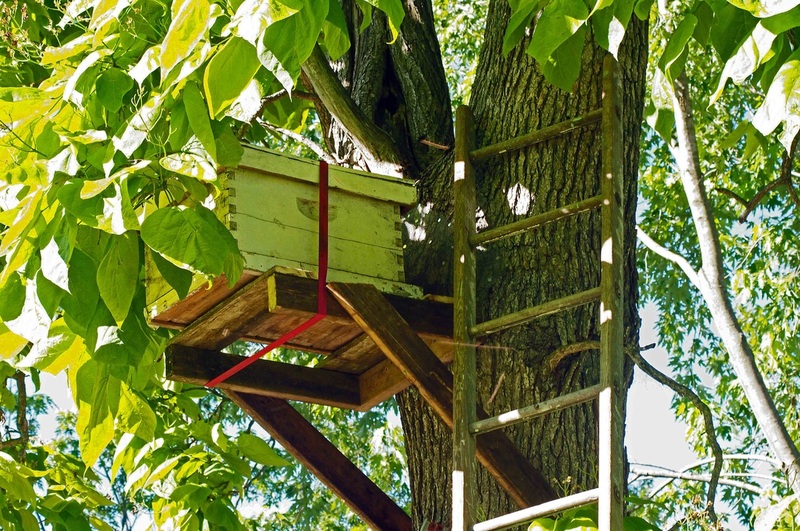 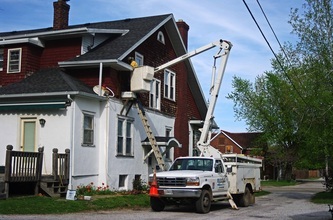 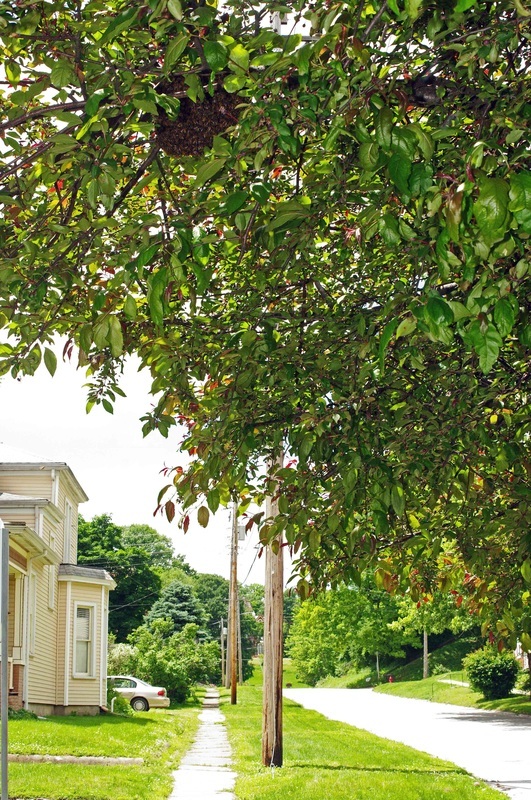 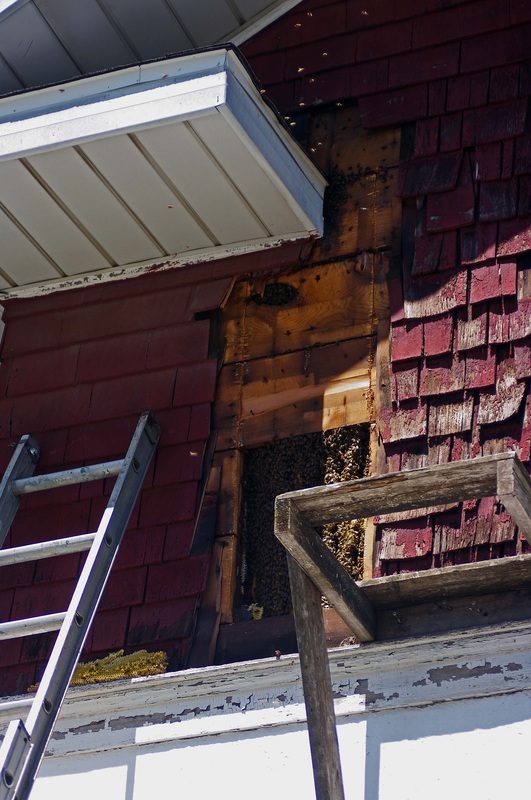 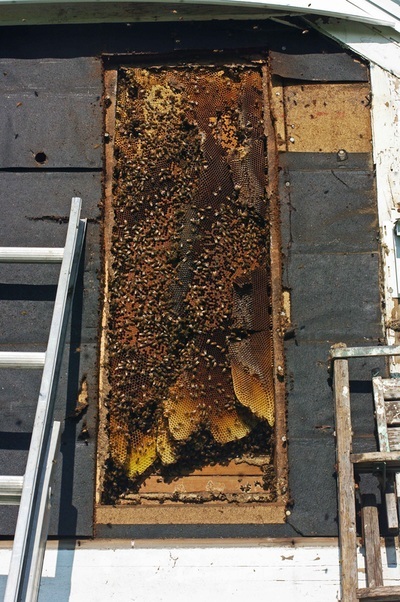 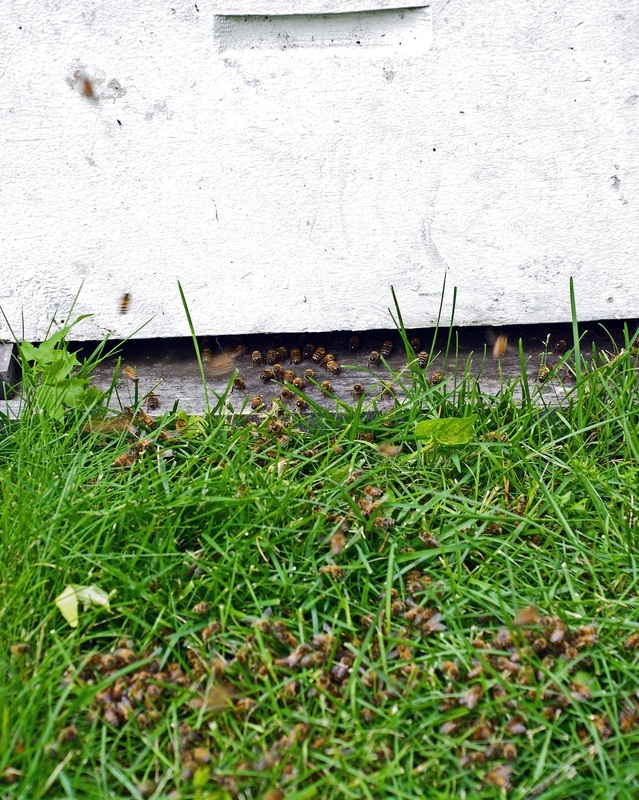 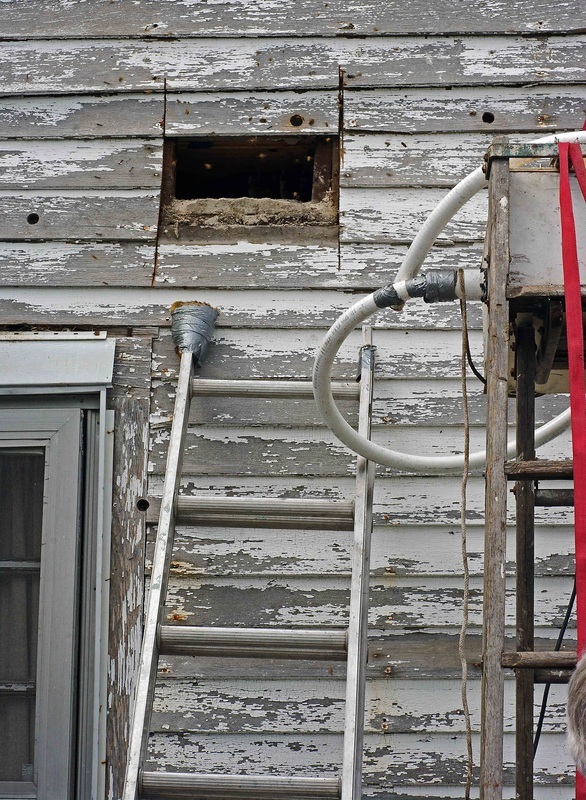 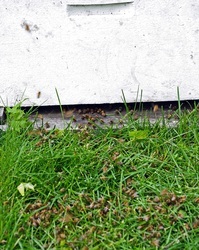 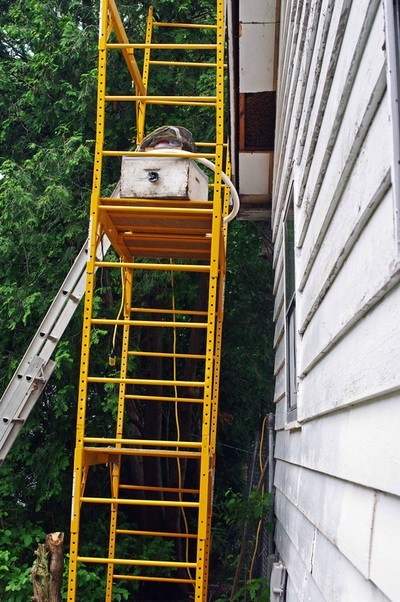 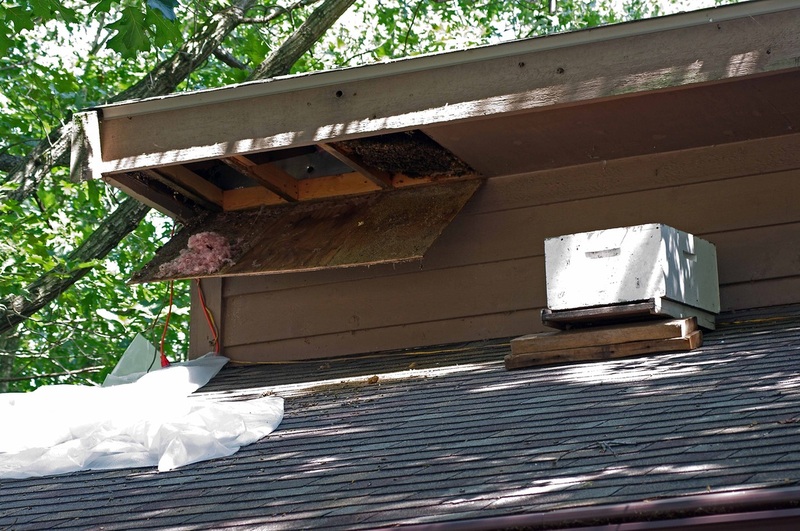 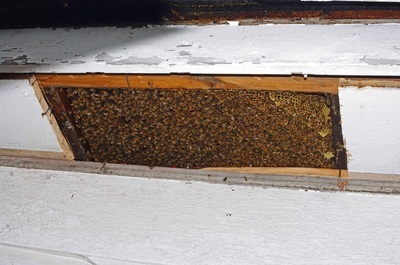 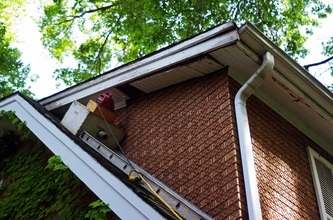 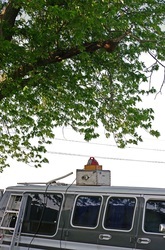 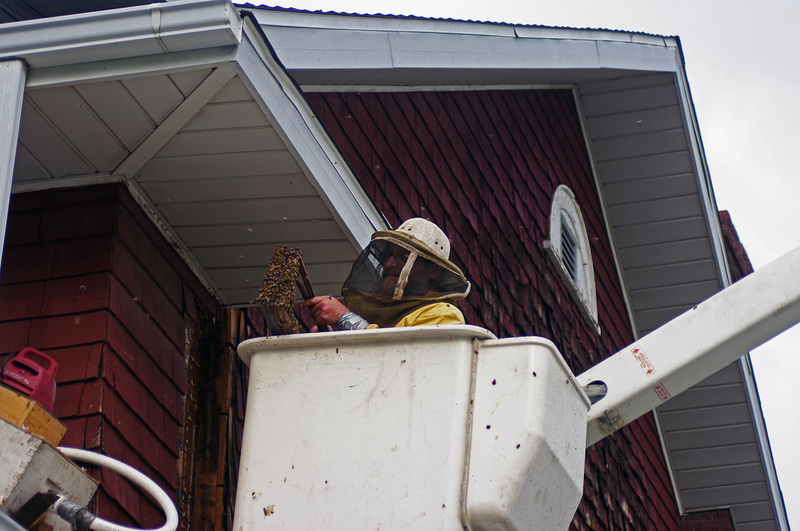 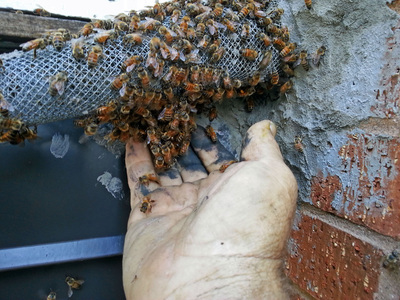 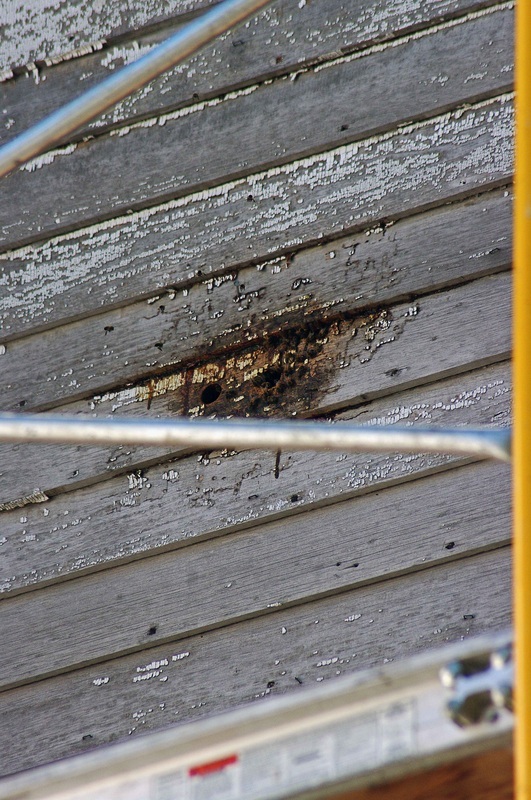 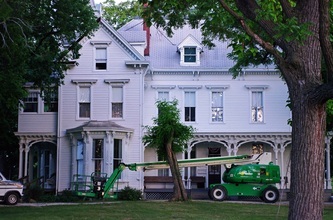 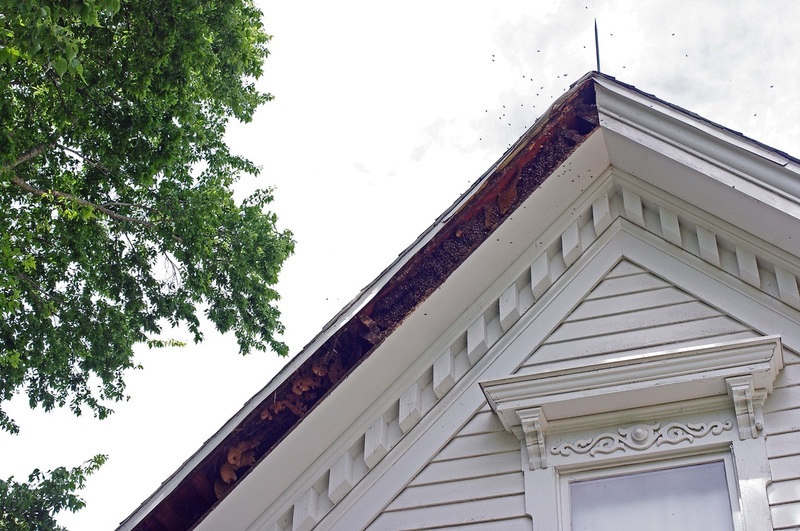 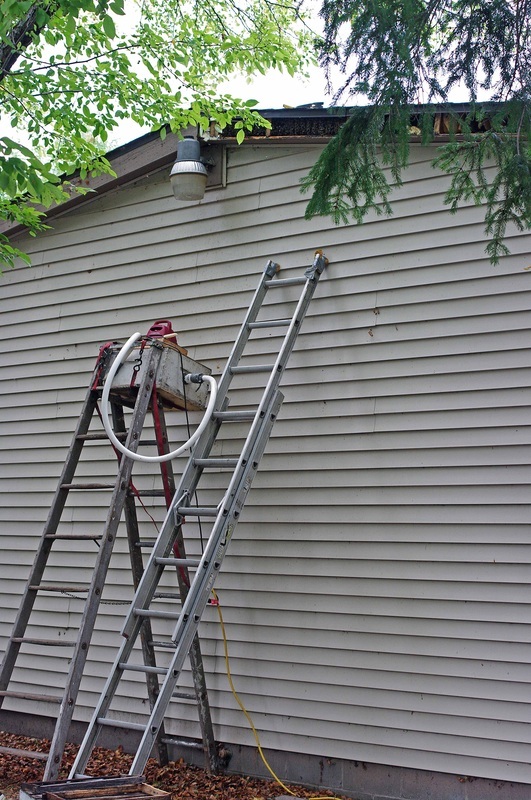 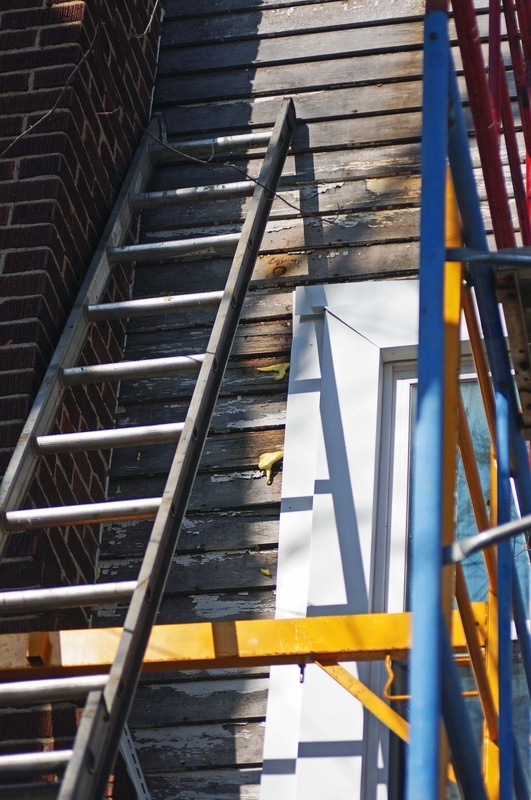 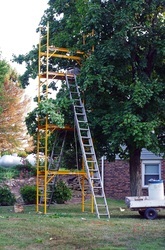 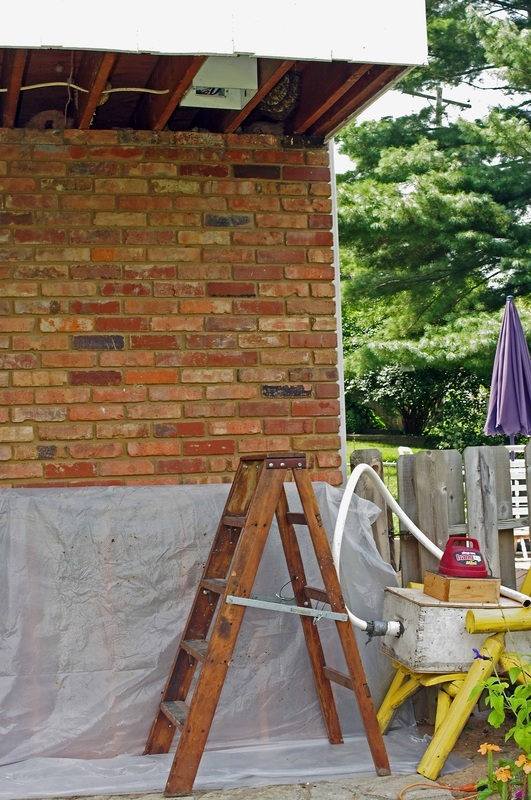 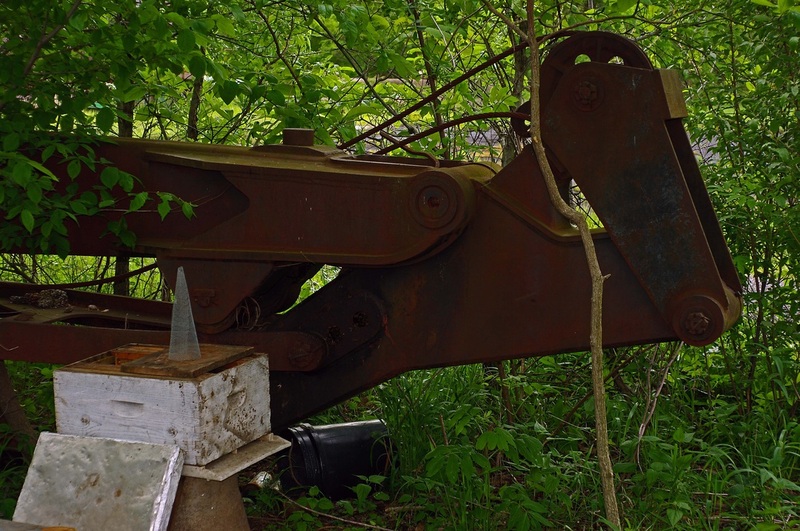 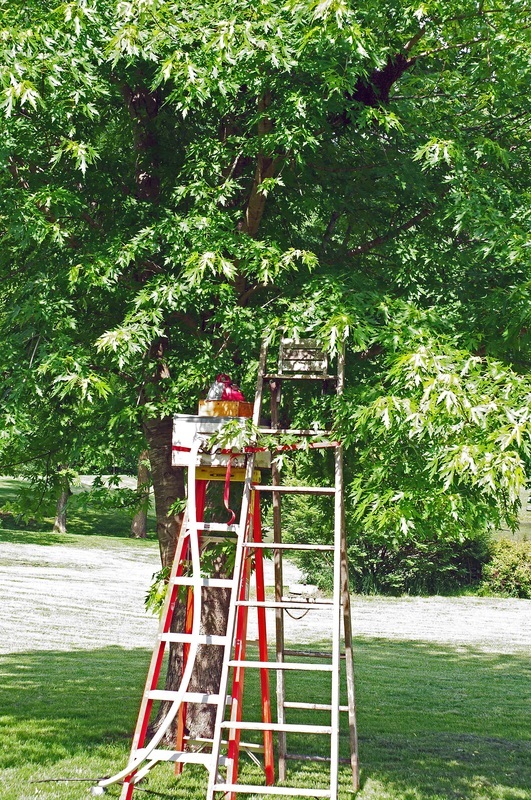 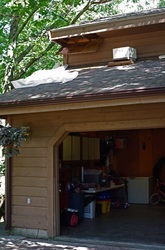 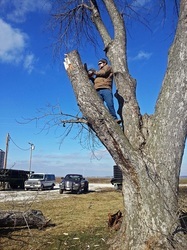 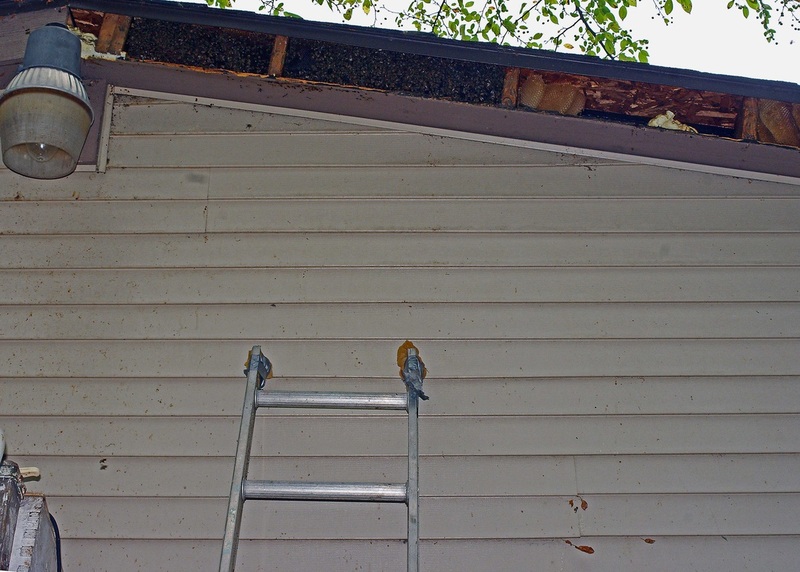 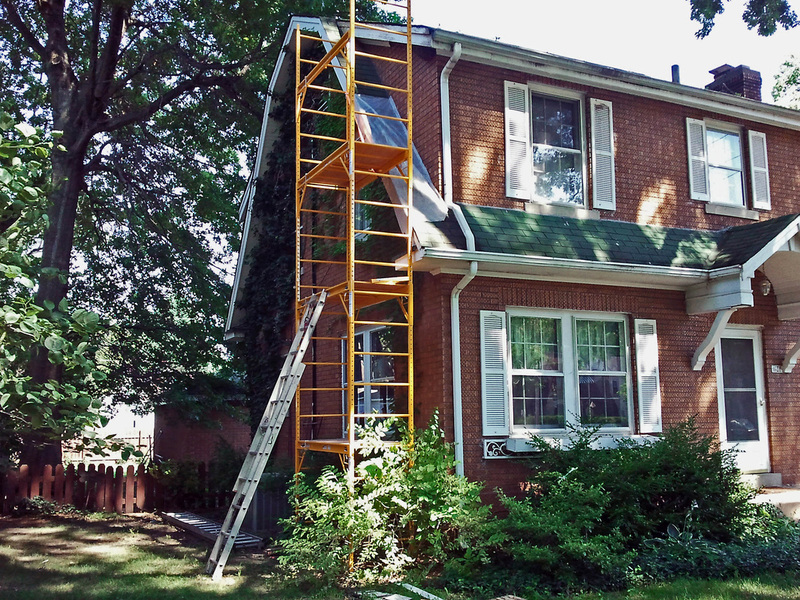 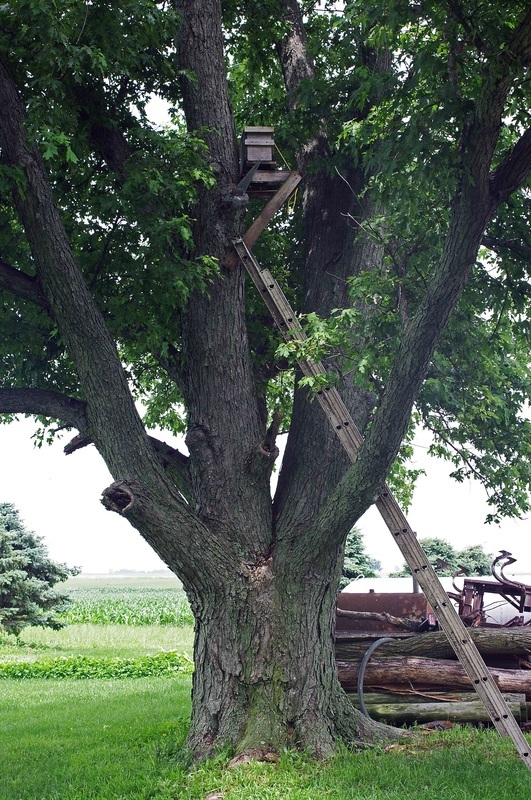 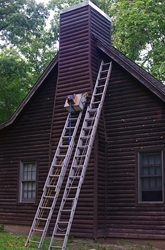 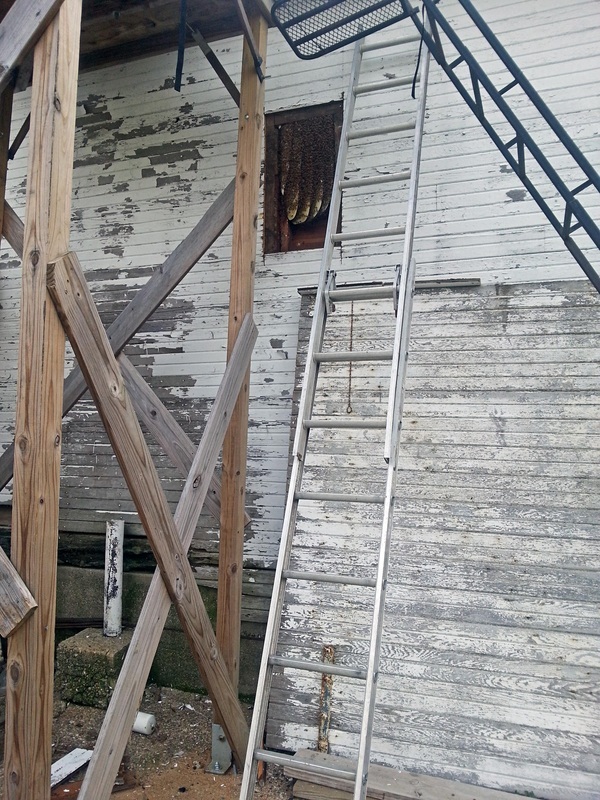 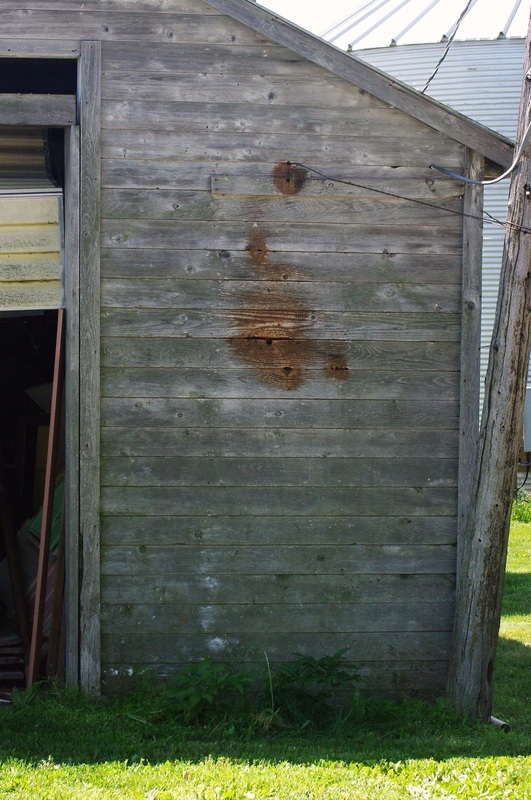 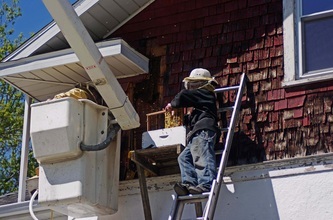 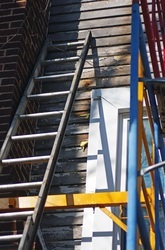 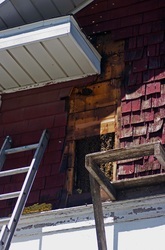 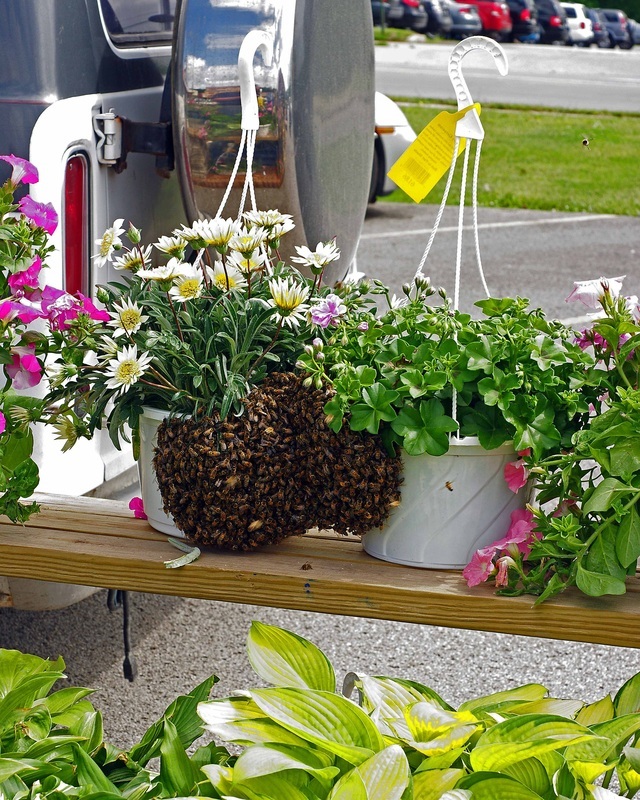 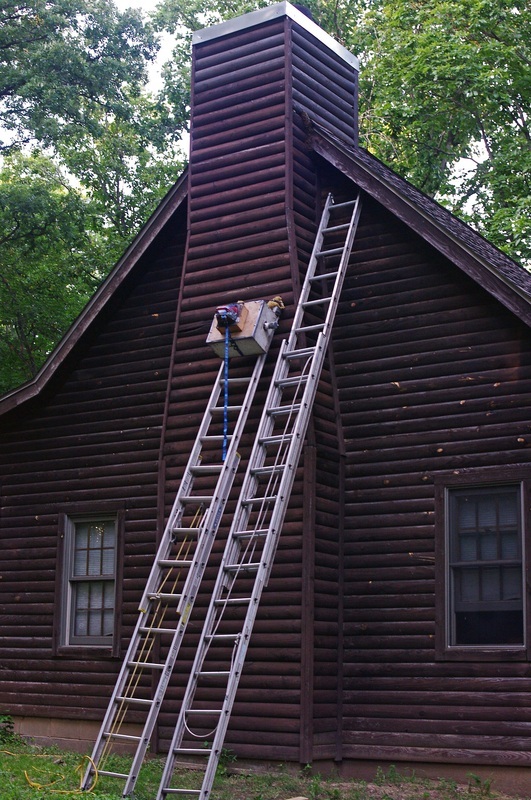 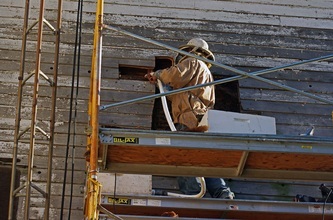 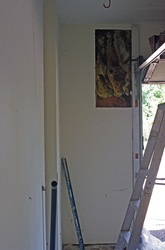 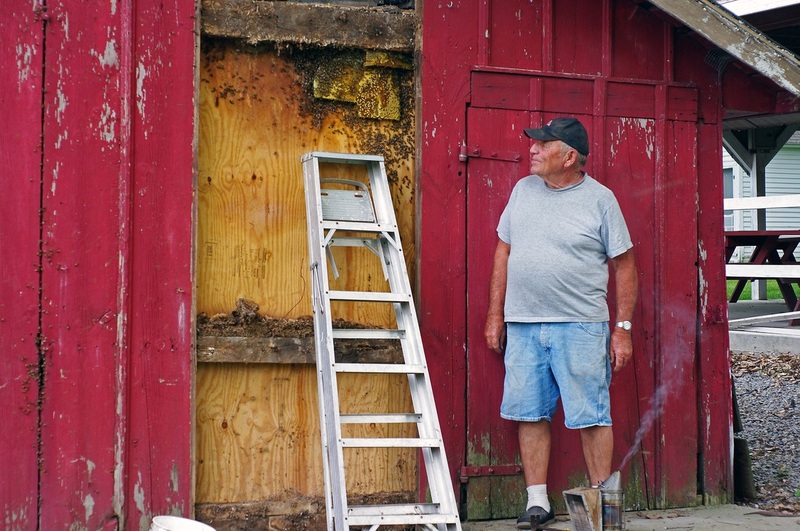 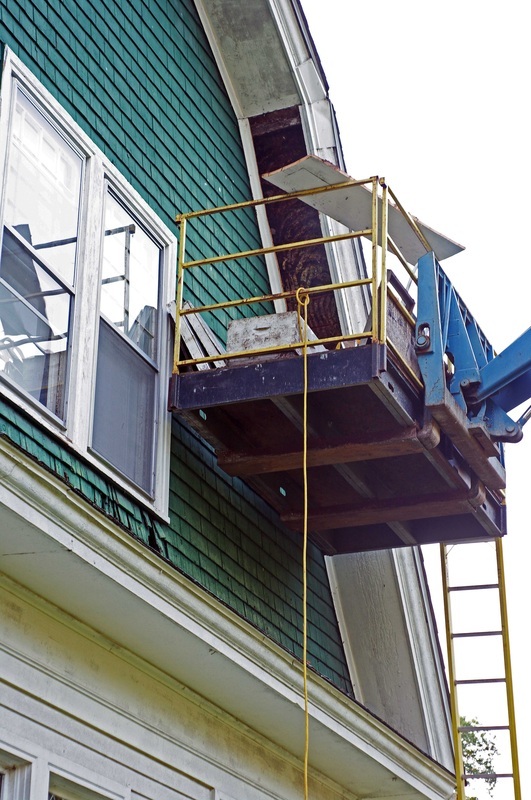 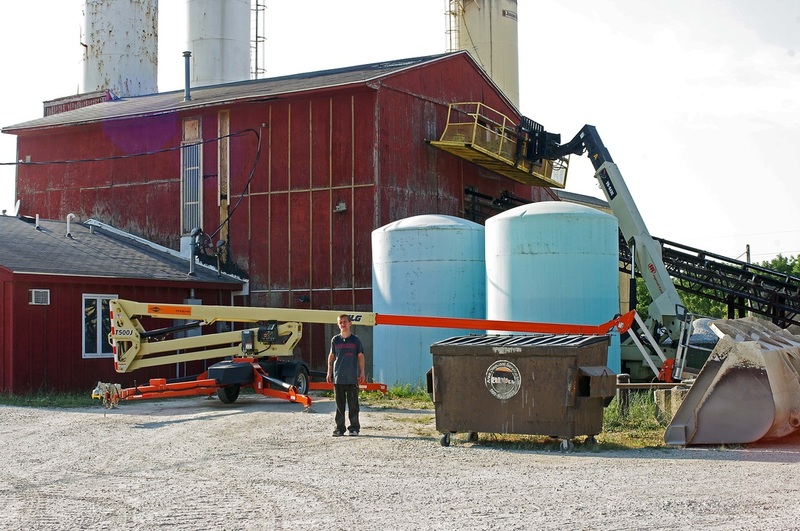 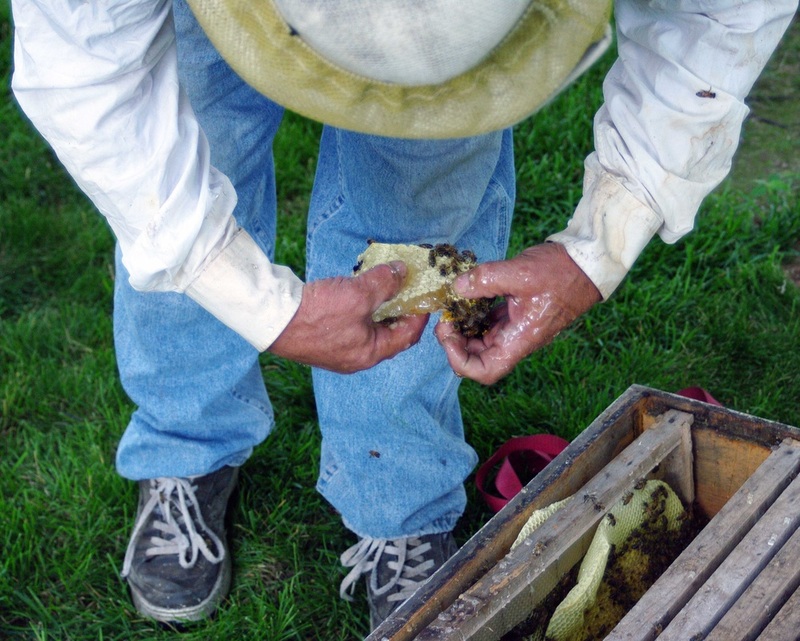 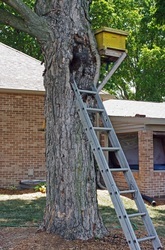 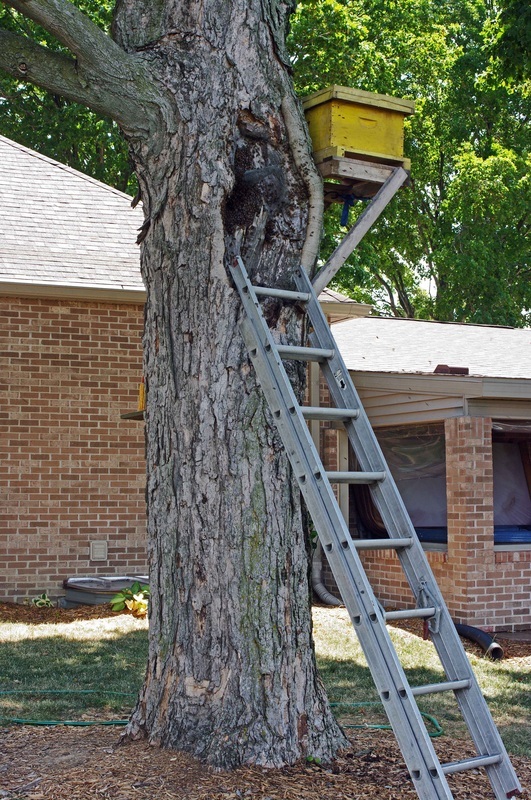 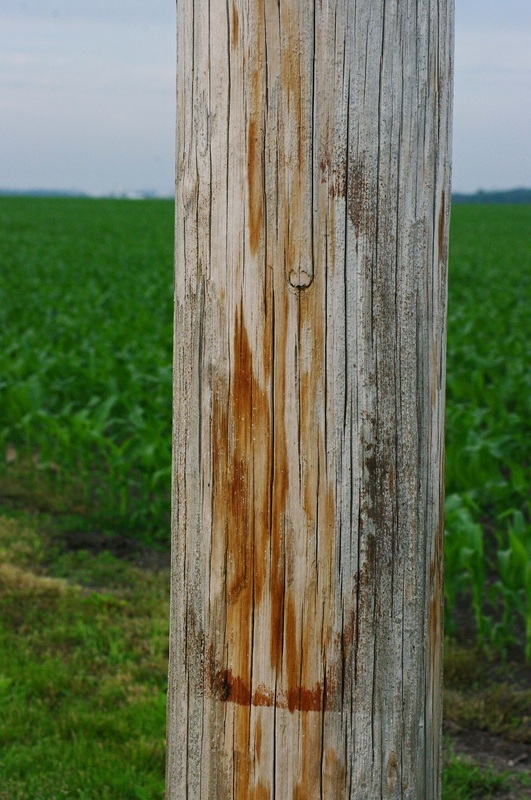 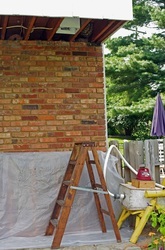 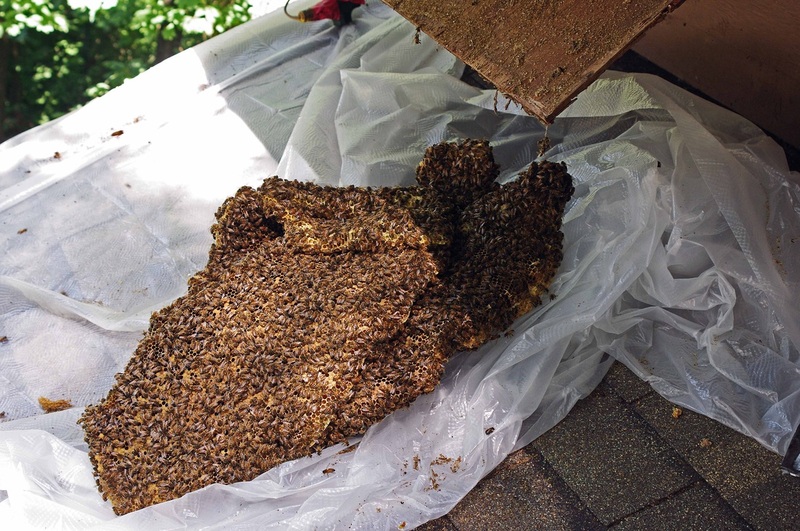 I do whatever I can, in cooperation with the owner, to perform the removal is such a way as to make it easier to do the repairs after the bees are removed, but it is the responsibility of the owner to have the spot repaired. 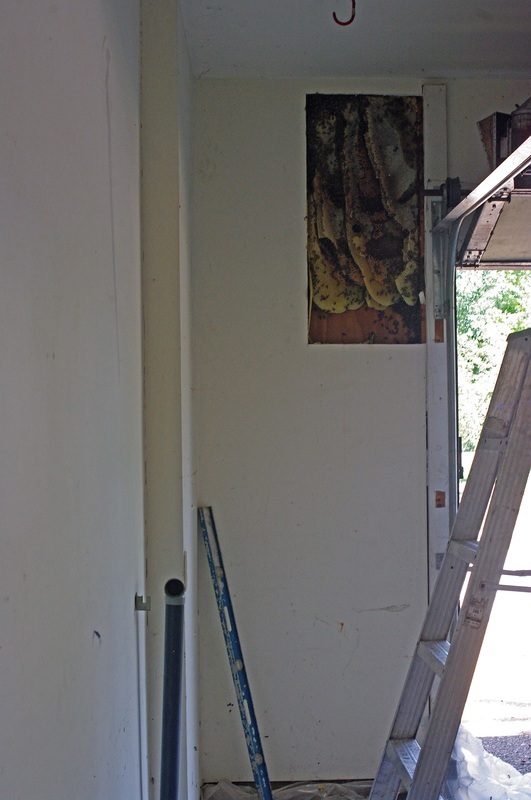 References are gladly furnished if anyone has any concerns. 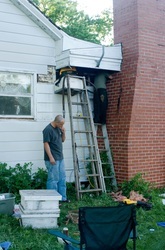 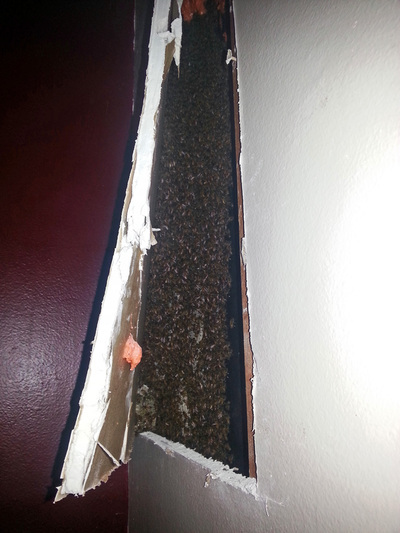 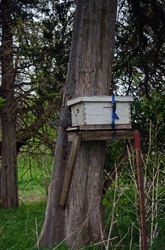 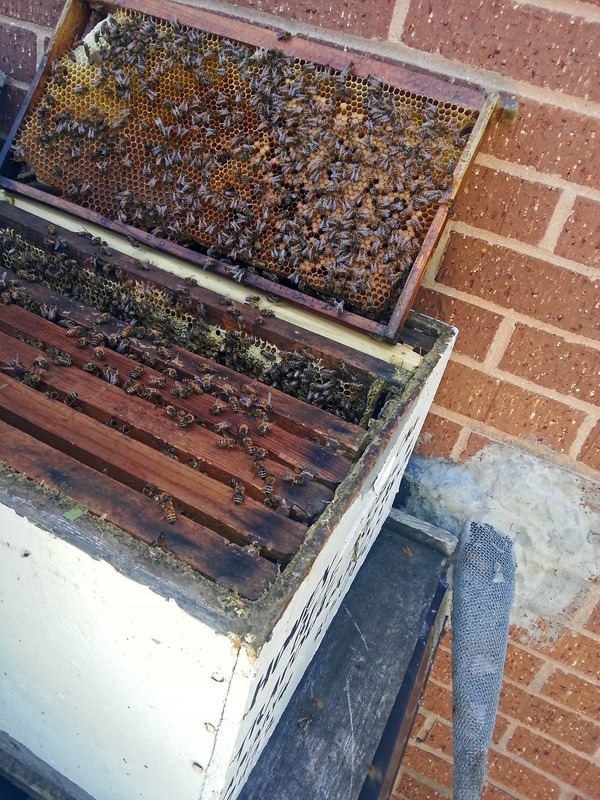 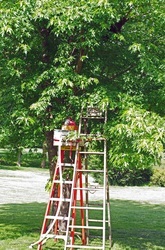 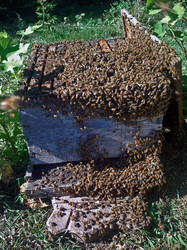 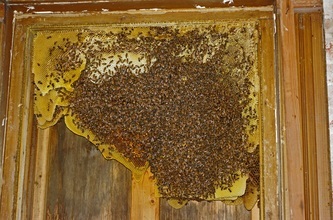 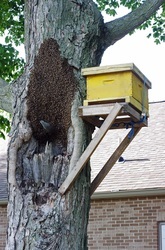 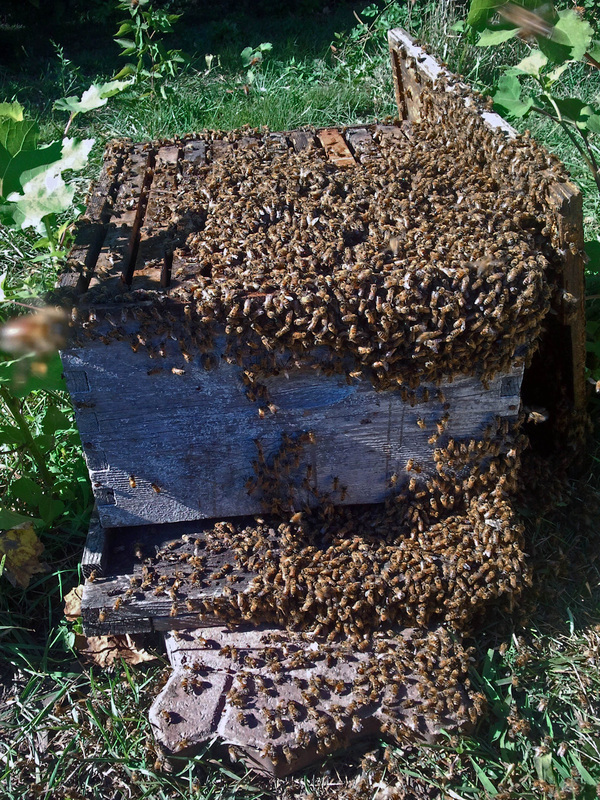 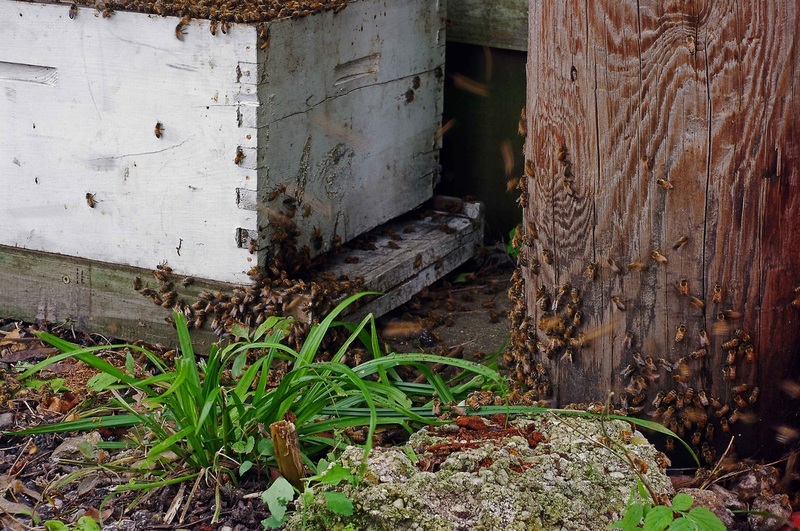 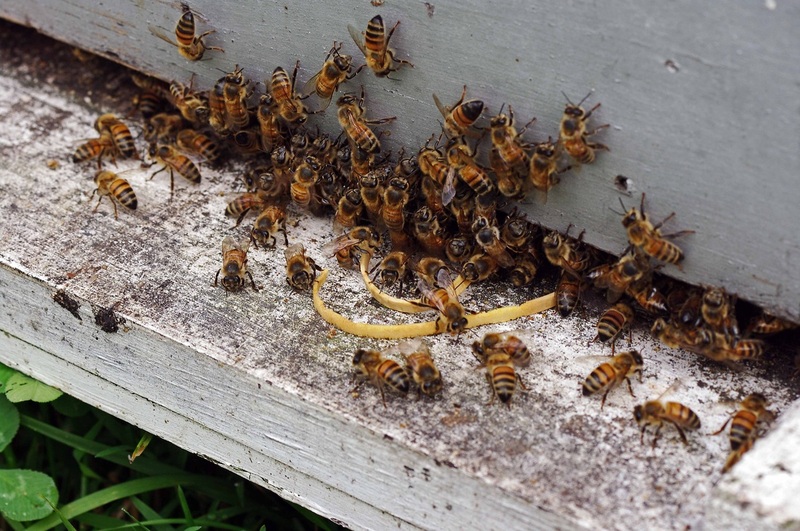 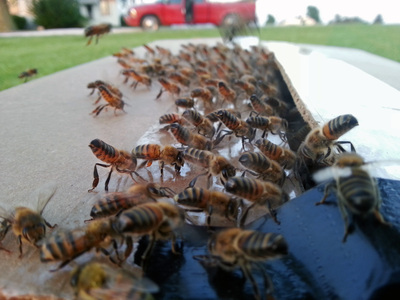 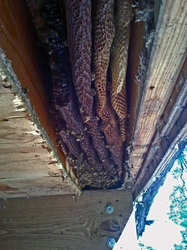 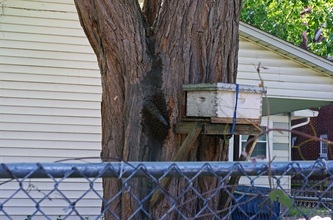 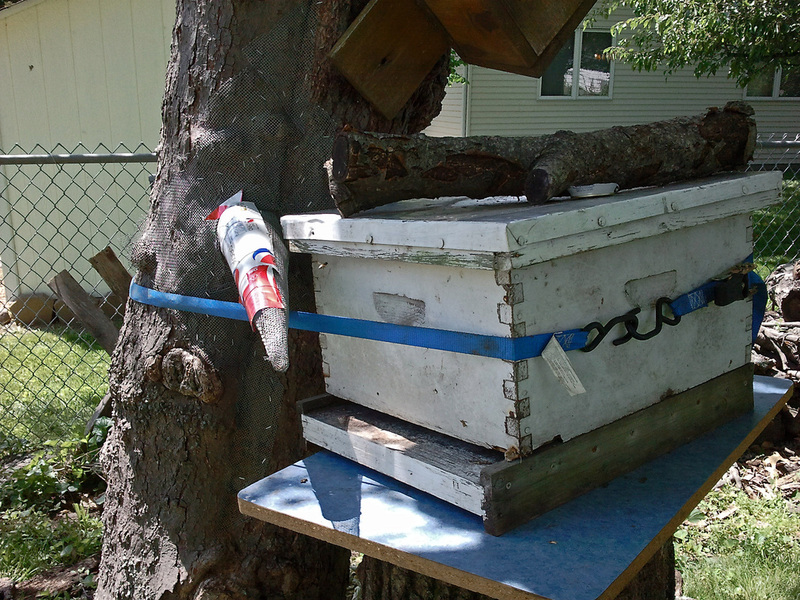 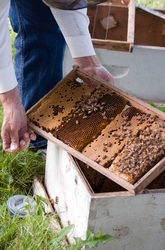 If honeybees have become a problem, send me an email or call or text me at 217-638-6371 or 6372. 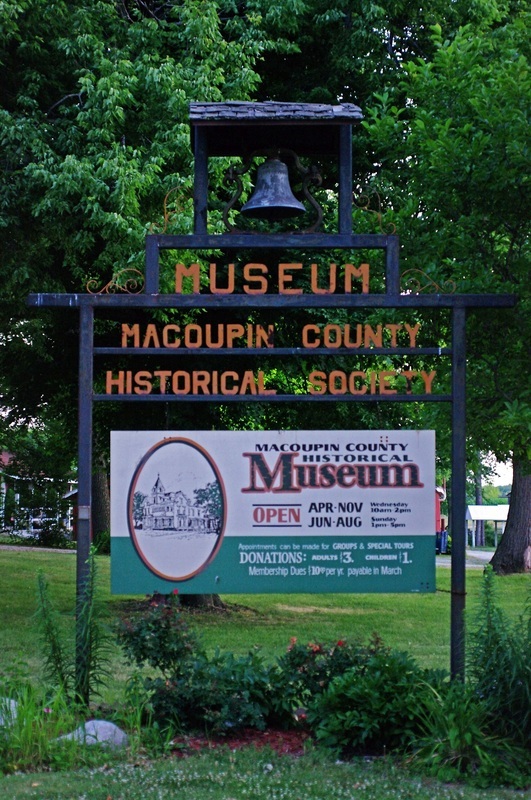 I'd be glad to take a look and talk to you about them. Please call before you spray! 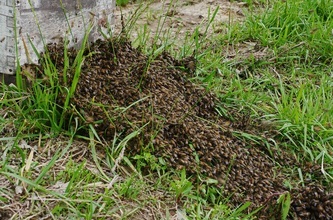 Swarms are the honeybees way of insuring survival. 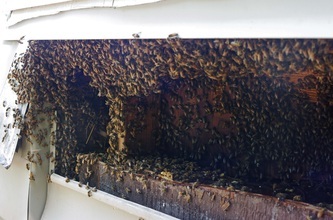 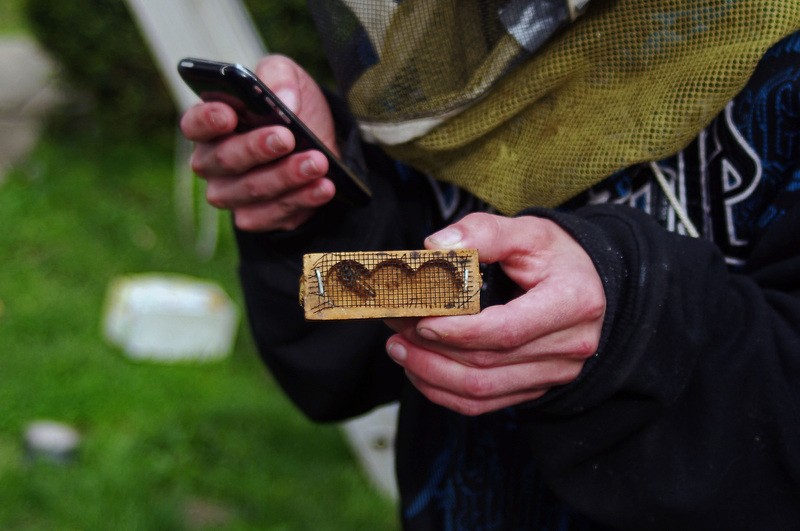 Early in the summer, usually starting in May, the hive has had a chance to build numbers and stores to the point the hive can divide. 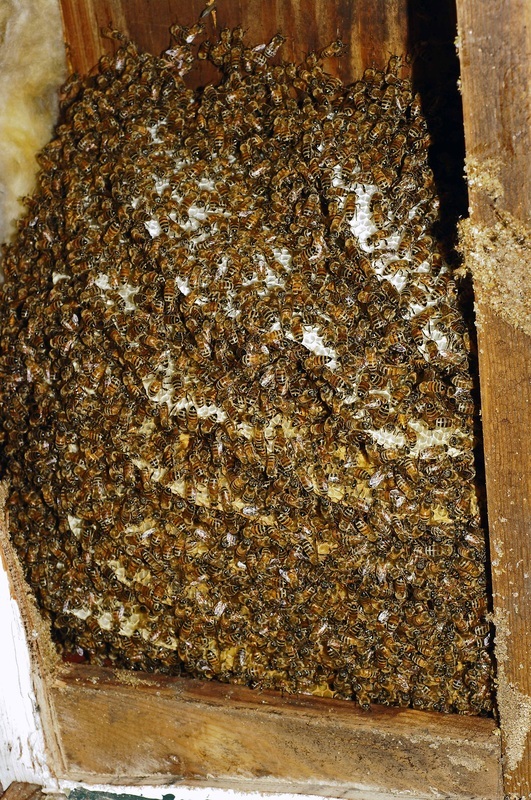 Leading up to this time the hive has been busy raising new queens to take over. Just before the first of the new queens hatch the existing queen and up to half of the colony will swarm out to come to rest usually not terribly far from the original location. 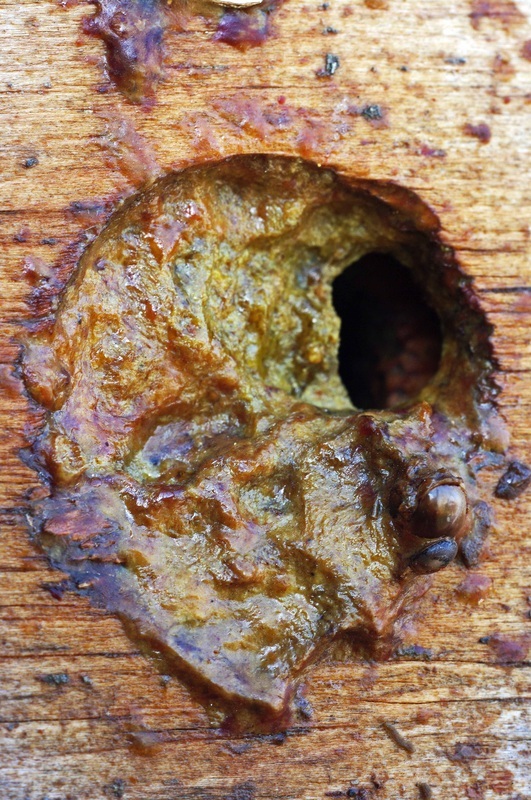 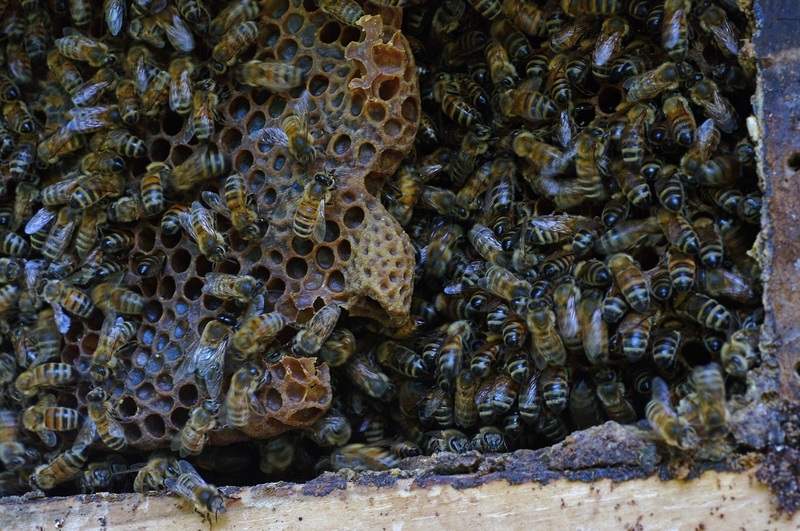 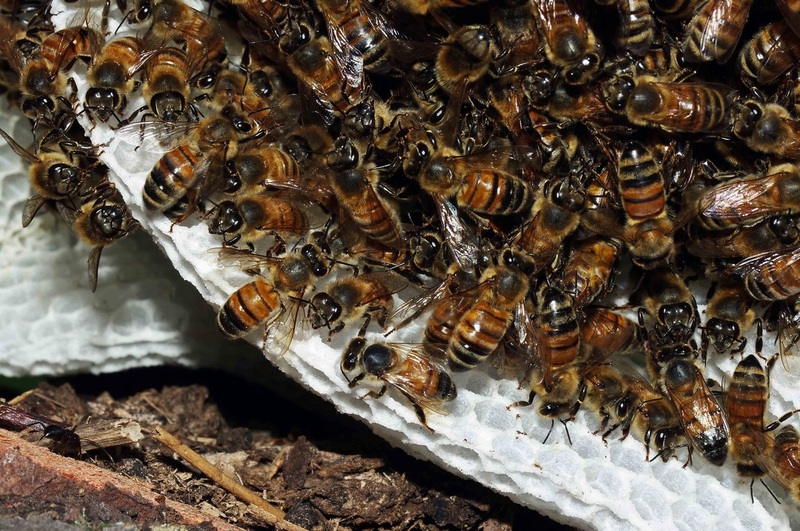 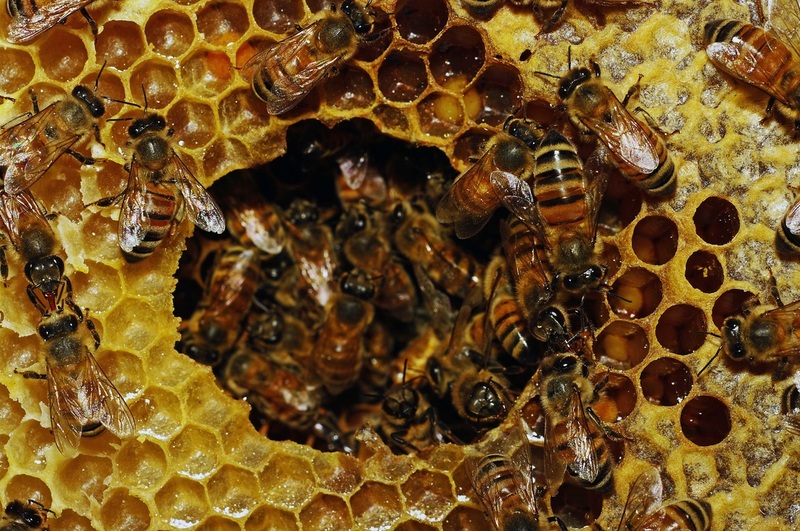 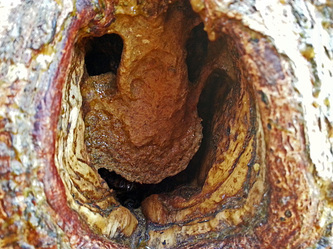 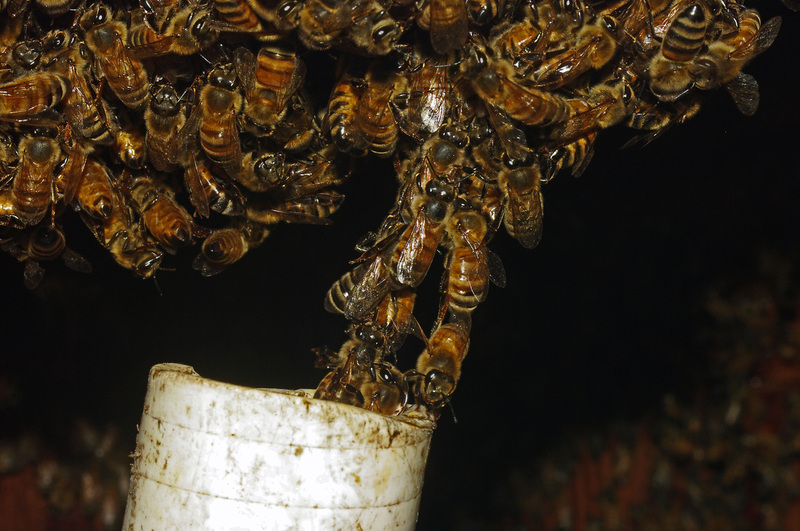 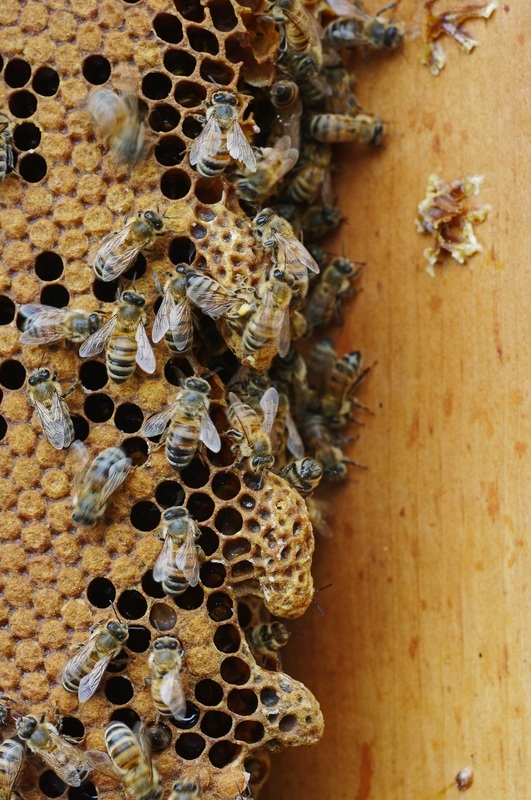 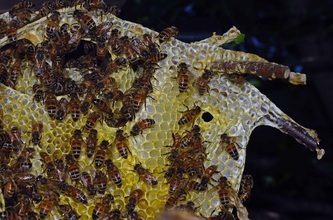 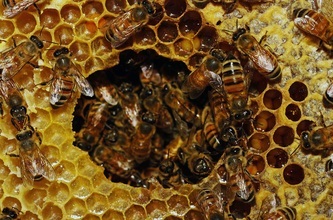 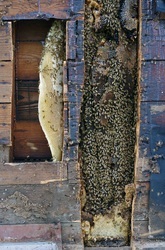 Before they leave, the workers fill themselves with honey that will help them and the queen survive until a new cavity can be found to begin a new hive. 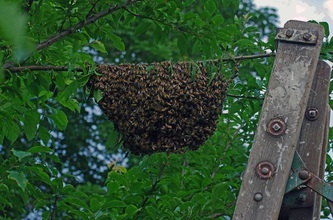 Scouts are sent out from the swarm to locate a suitable spot, much like scouts are sent out to locate nectar and pollen sources. 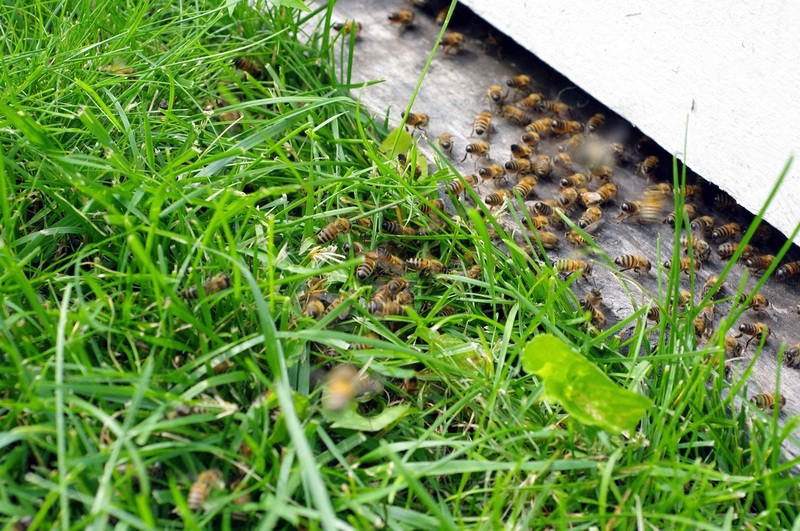 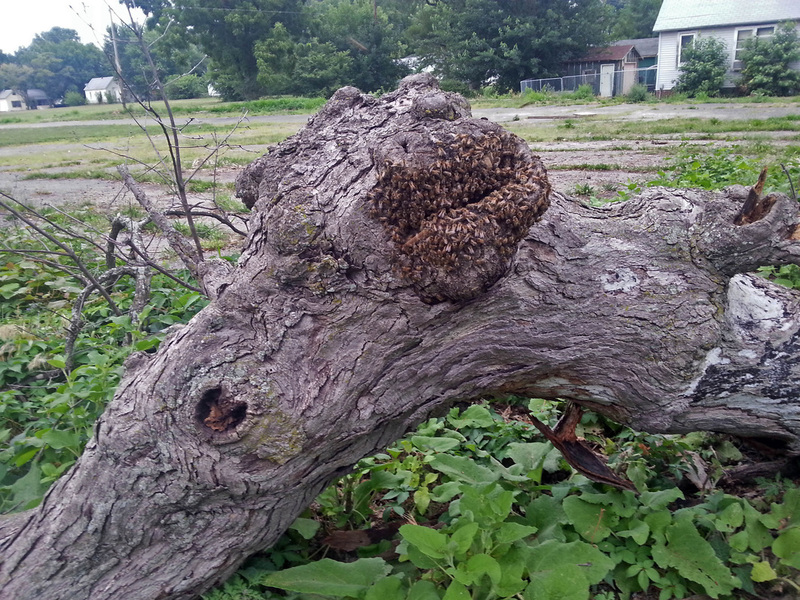 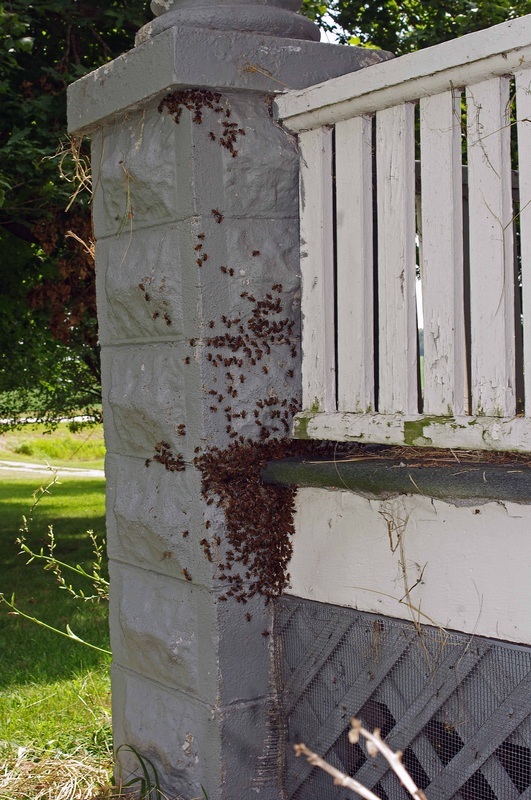 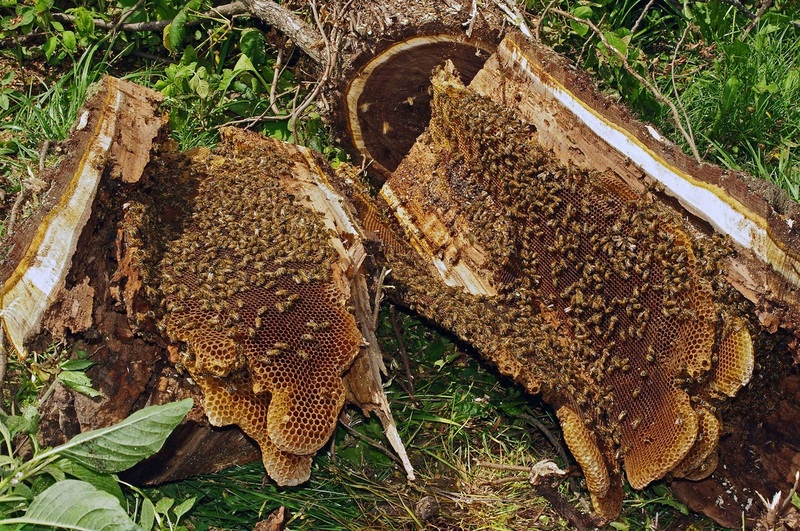 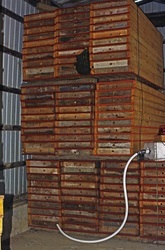 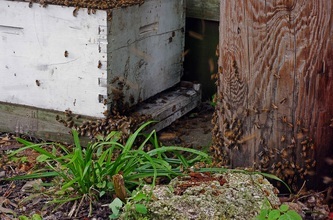 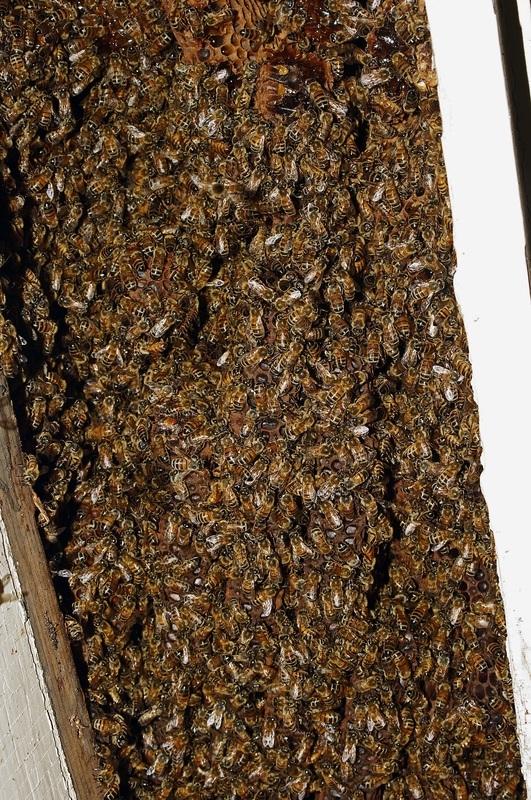 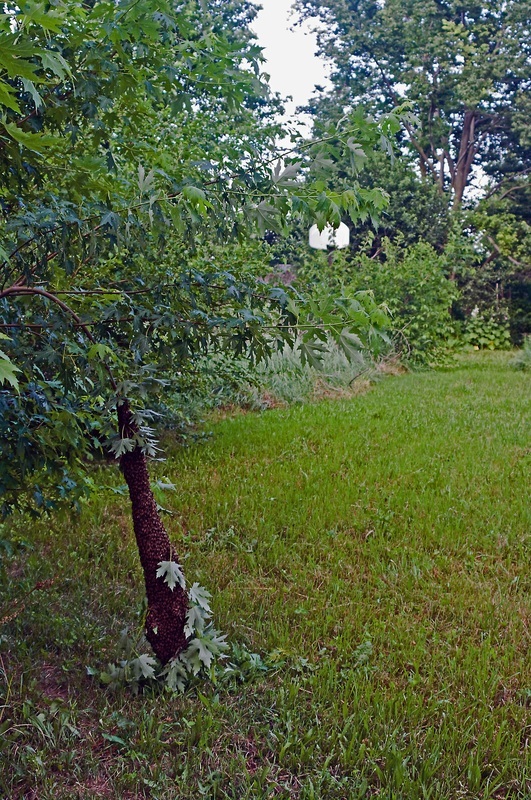 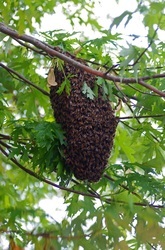 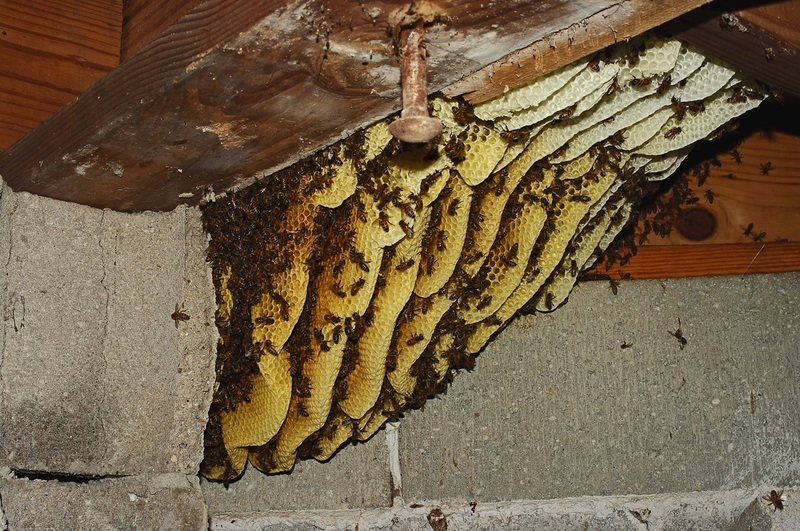 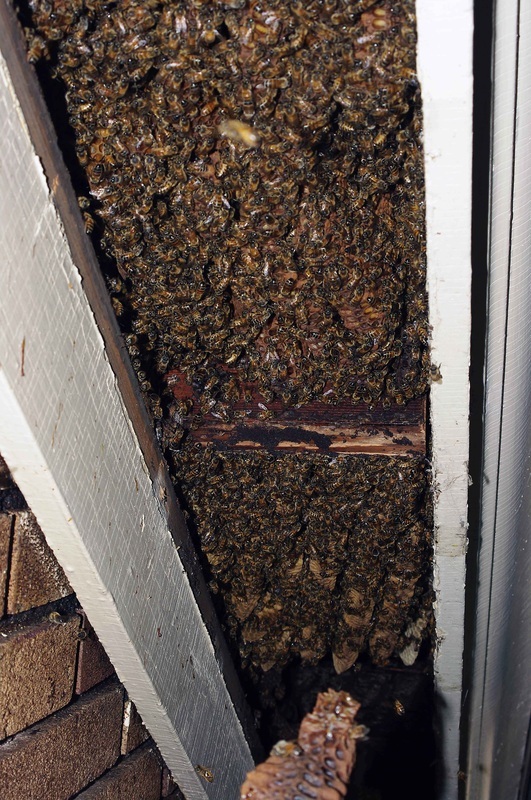 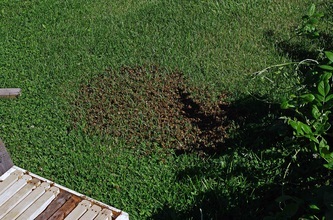 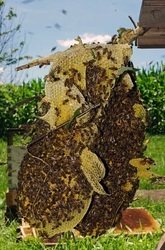 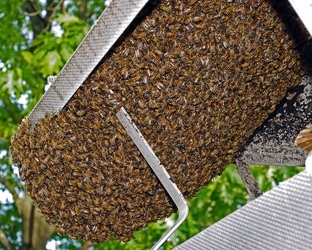 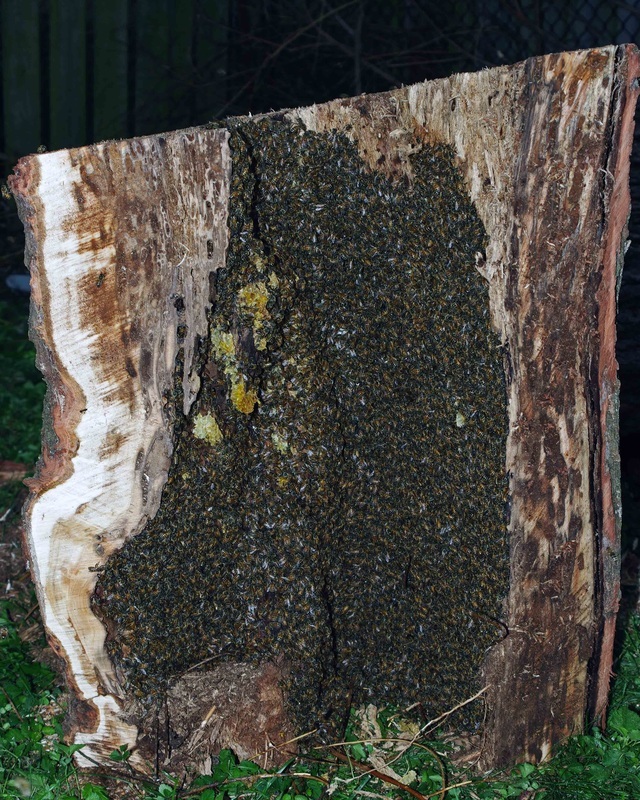 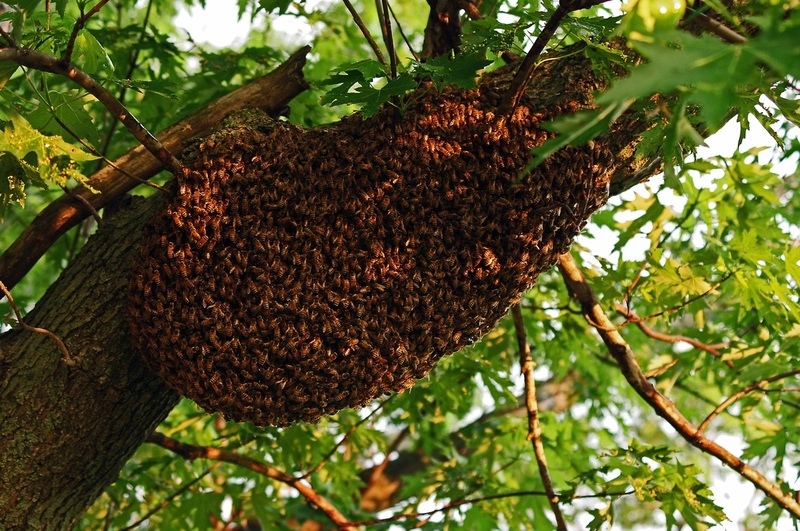 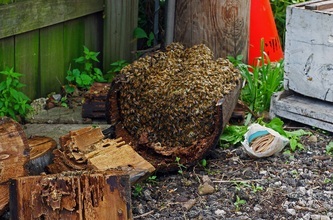 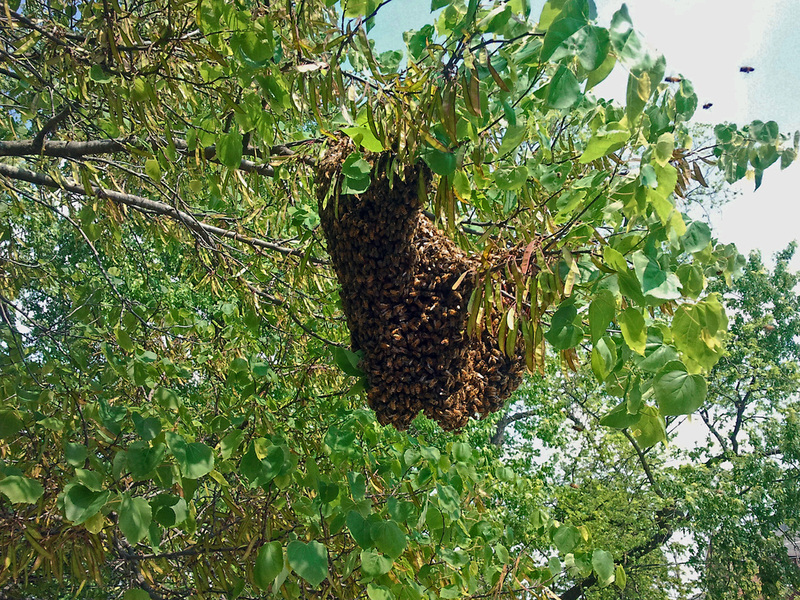 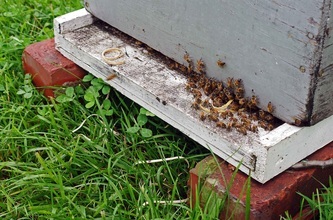 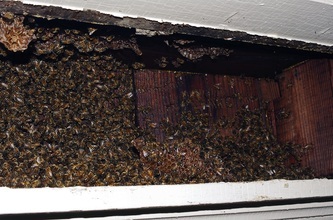 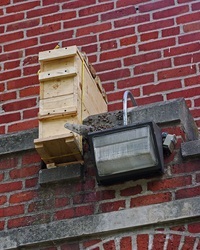 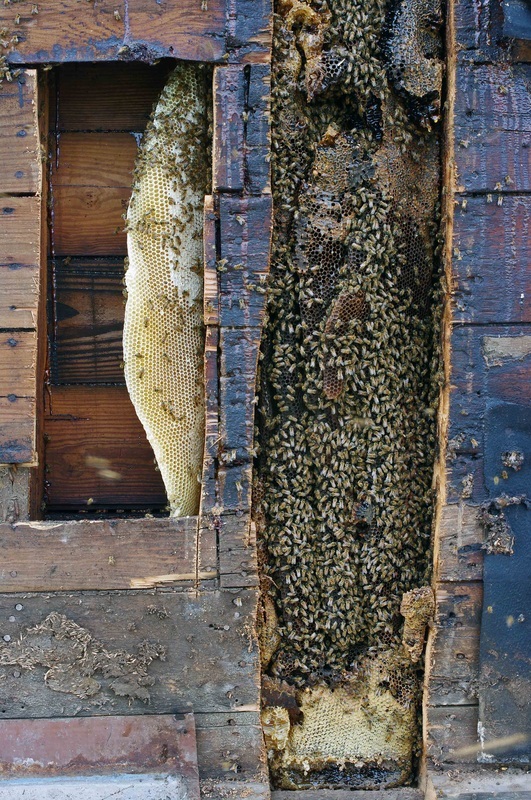 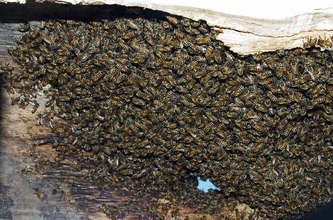 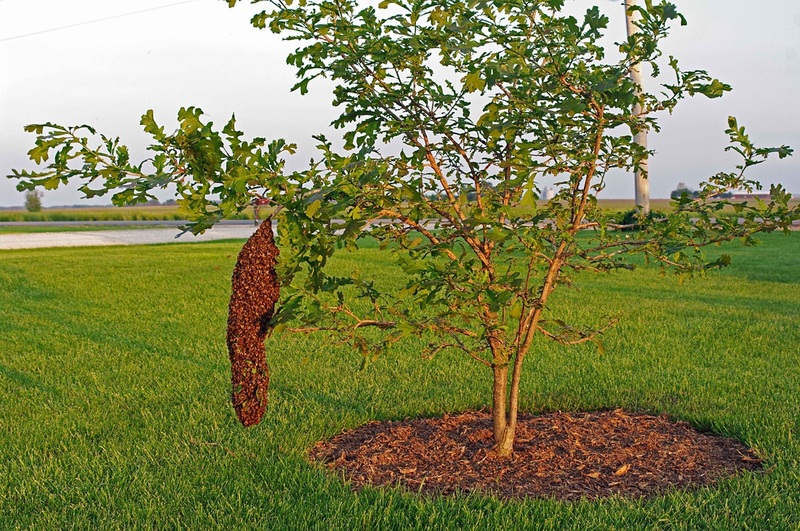 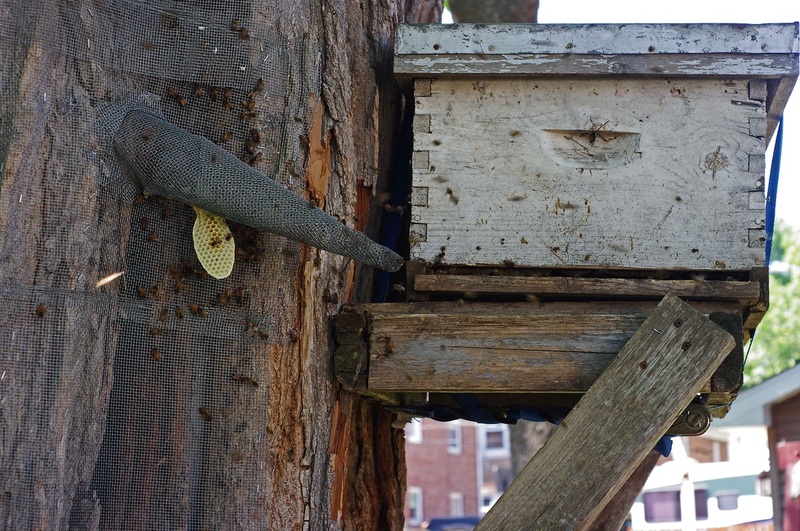 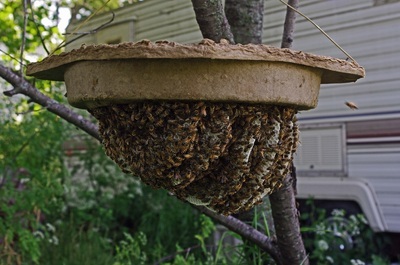 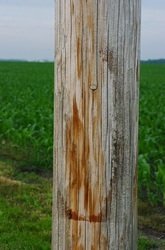 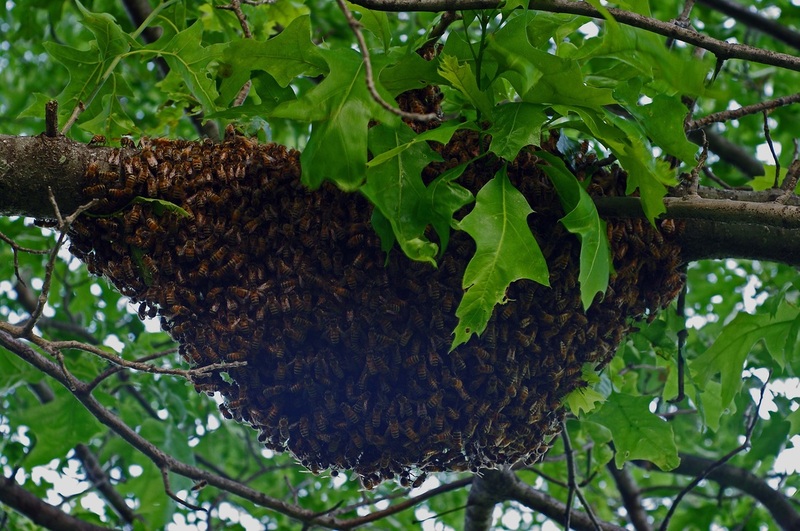 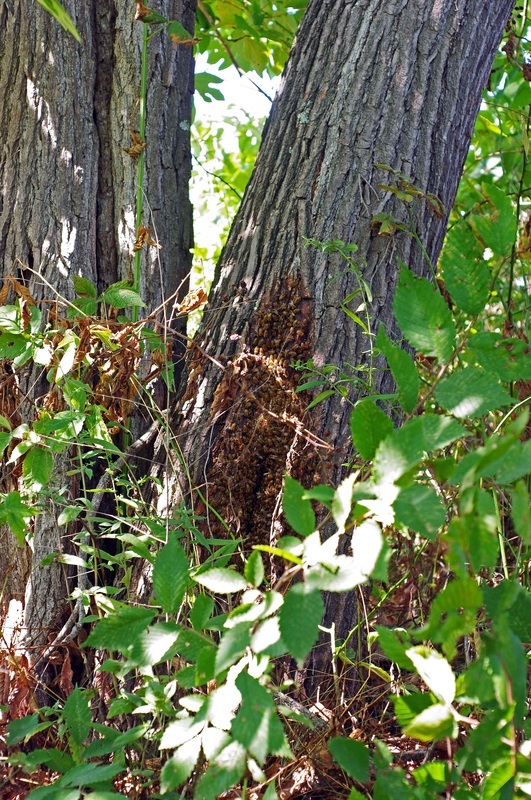 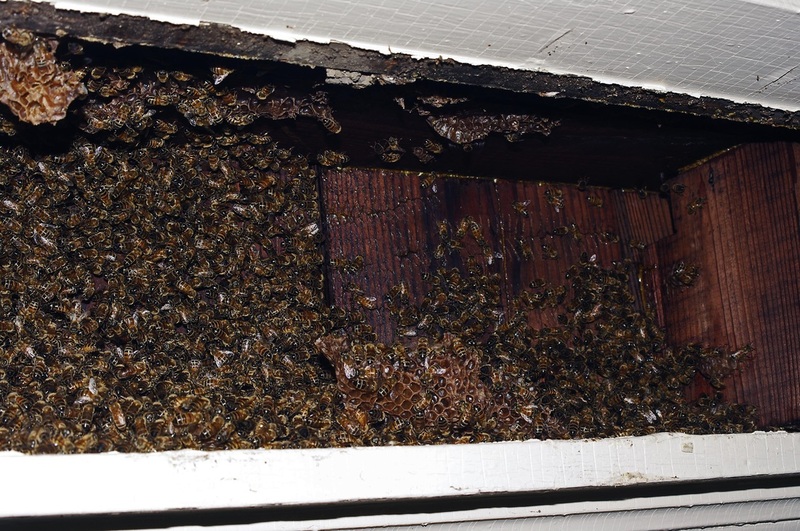 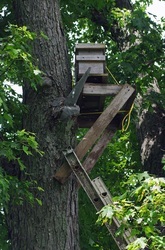 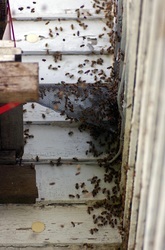 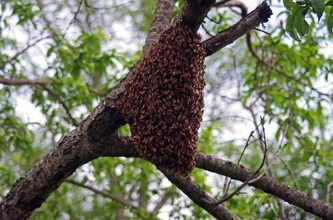 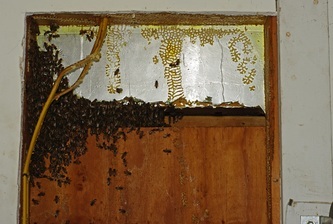 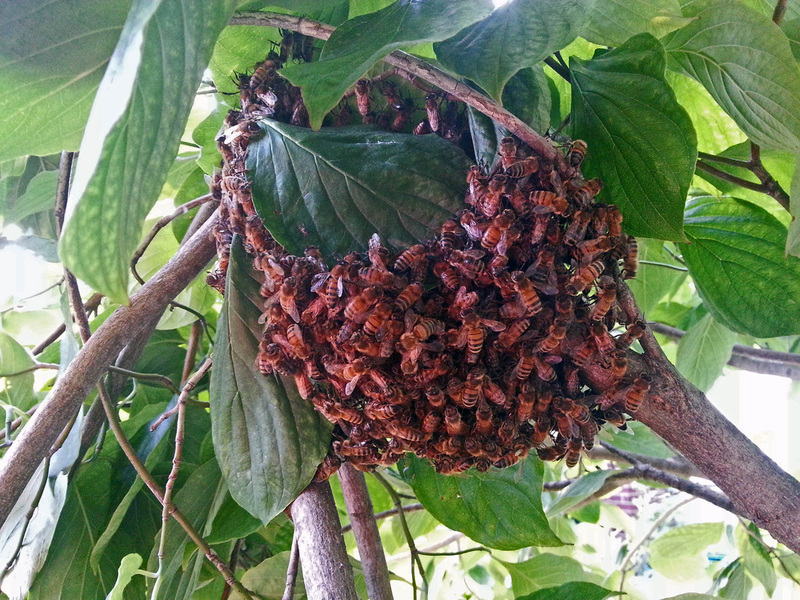 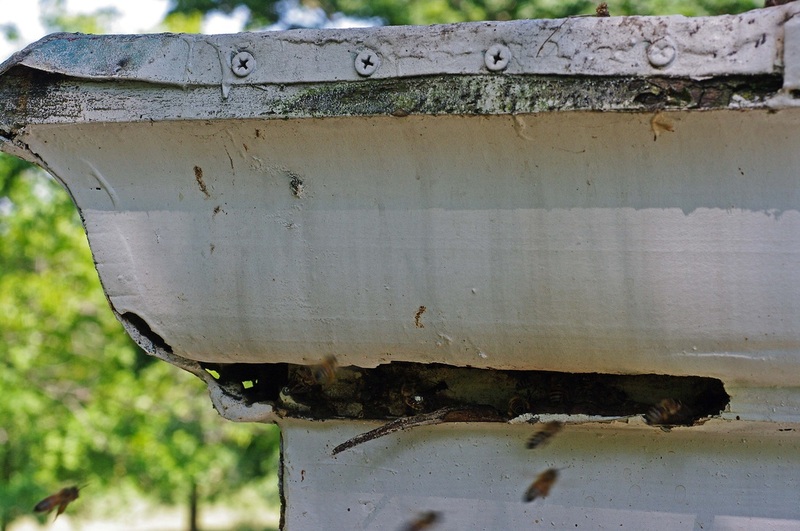 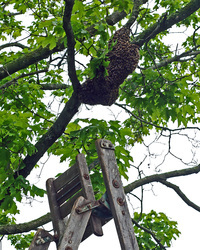 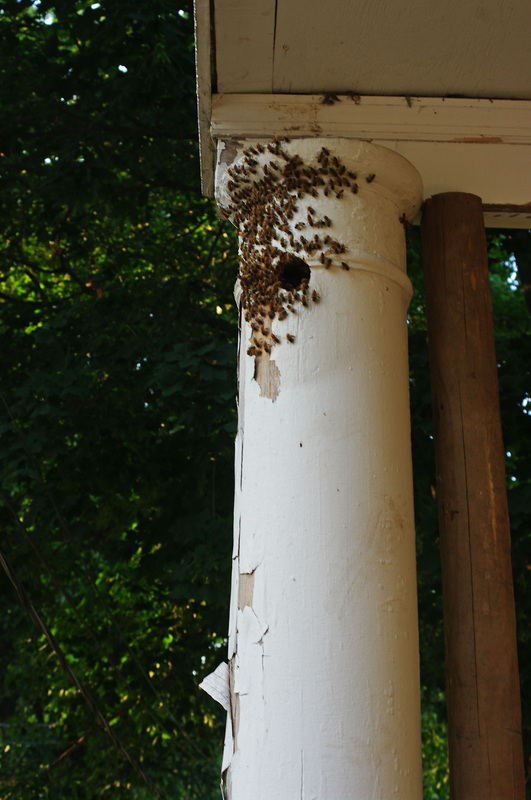 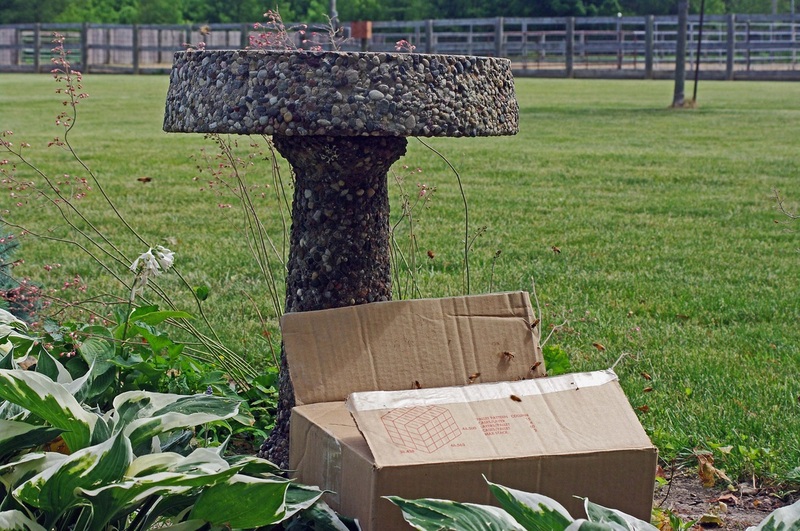 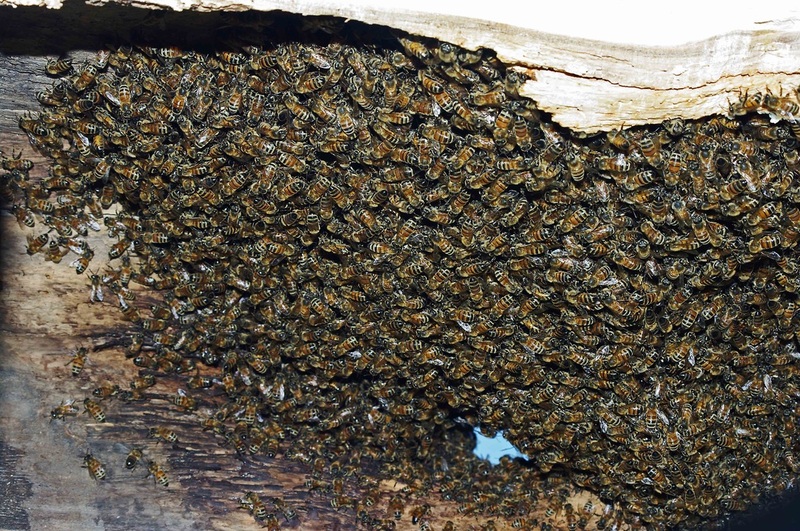 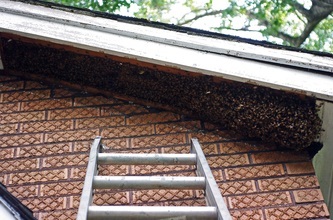 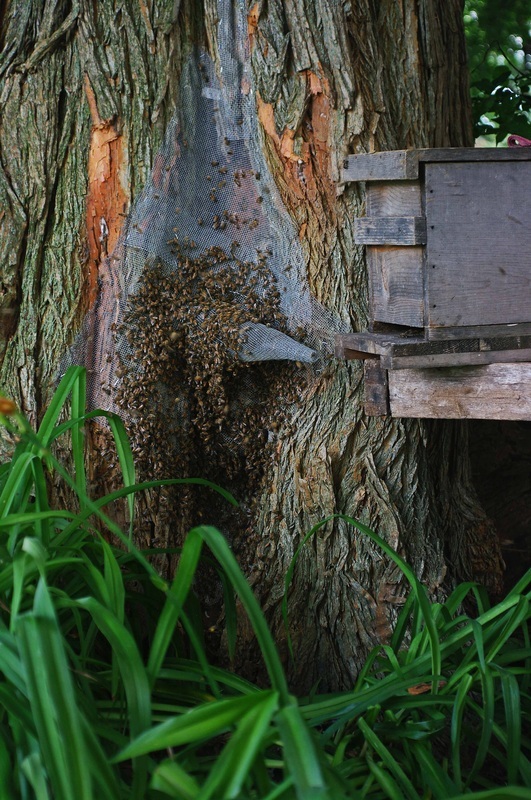 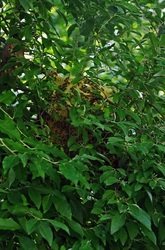 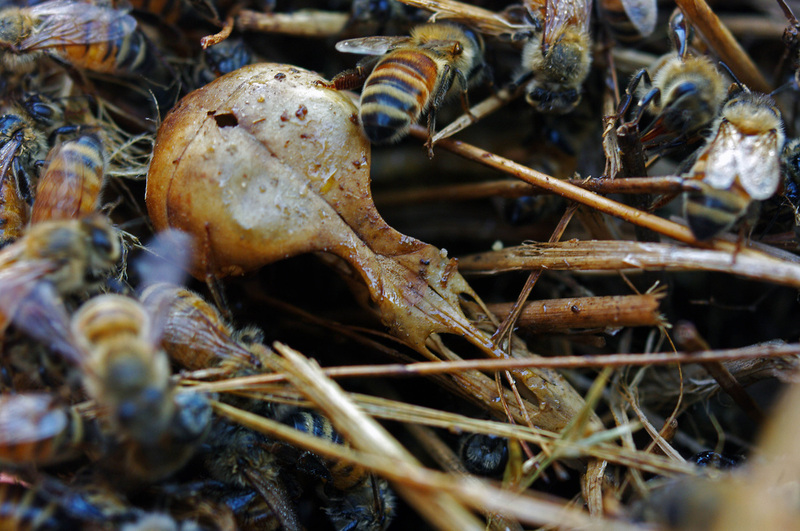 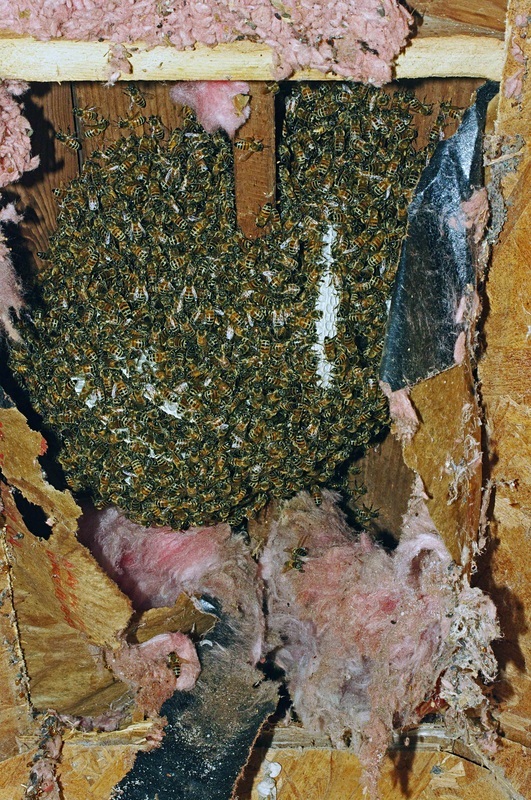 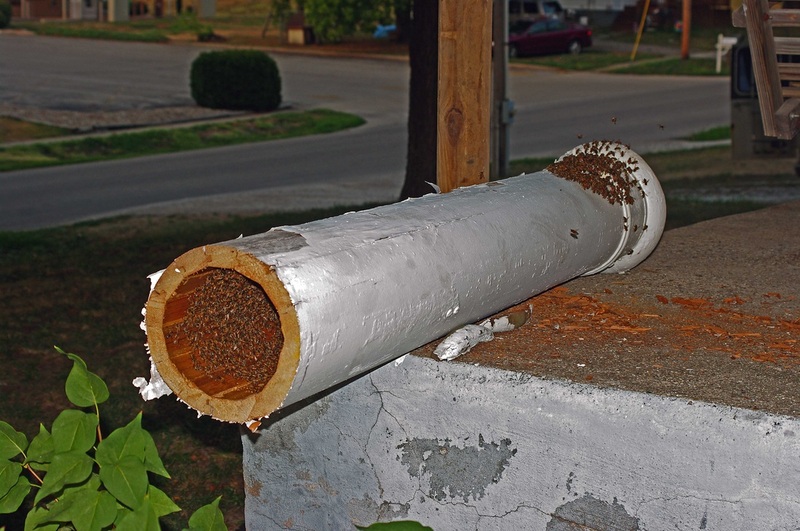 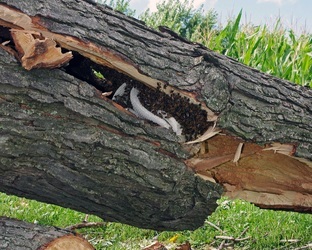 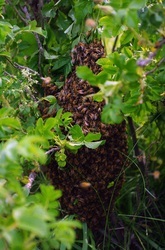 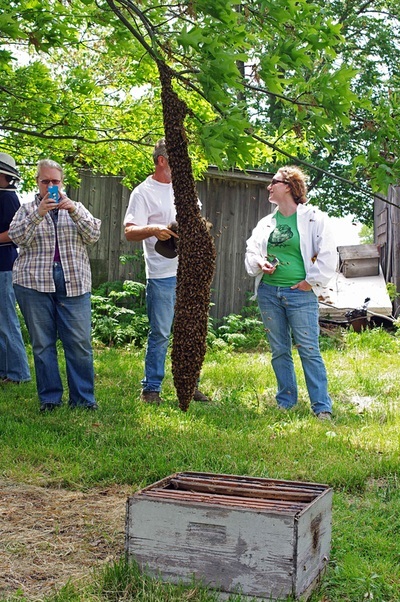 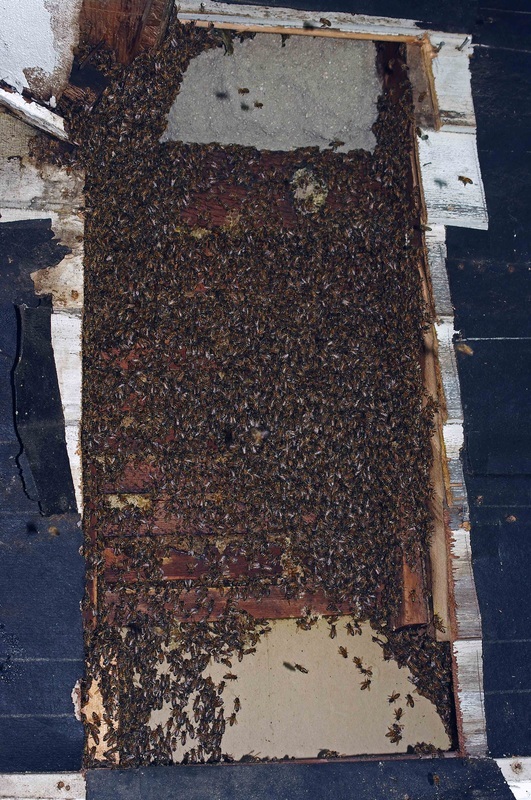 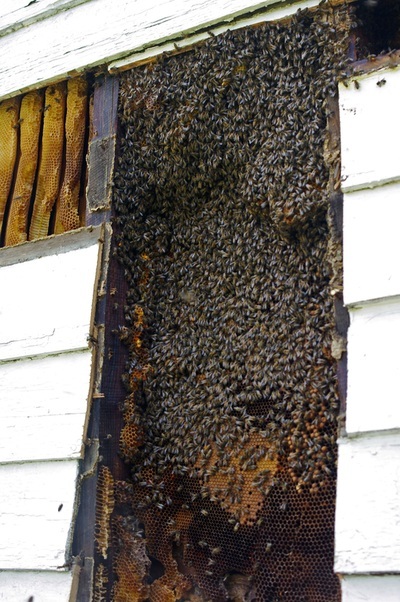 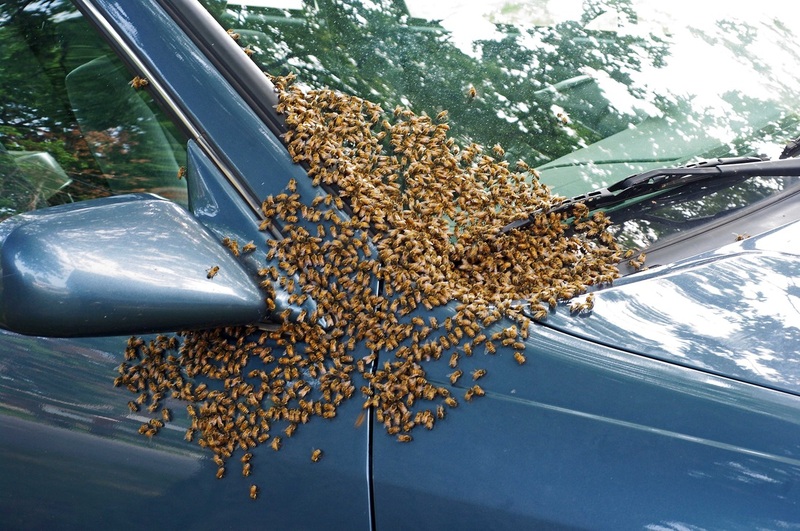 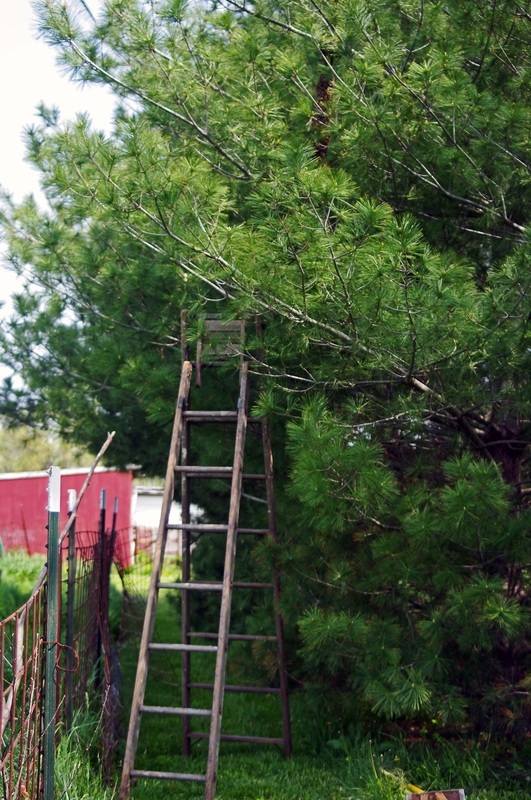 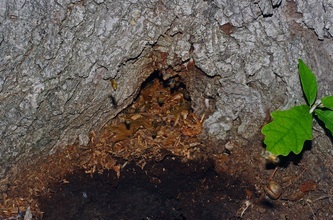 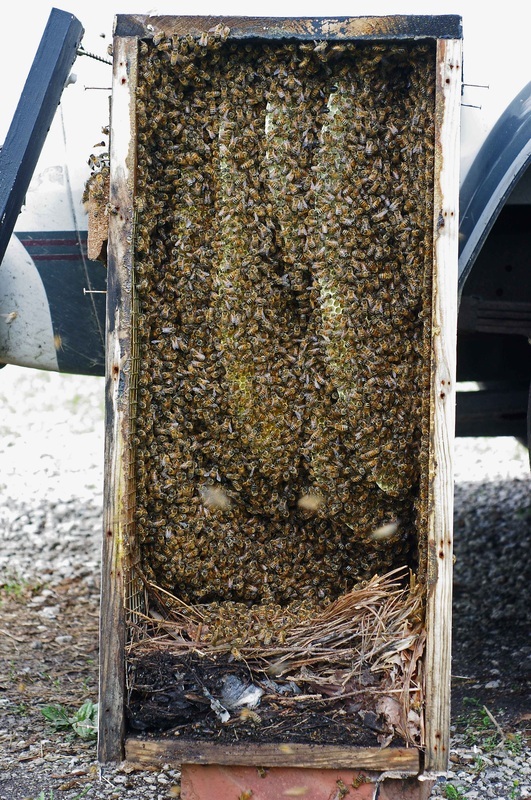 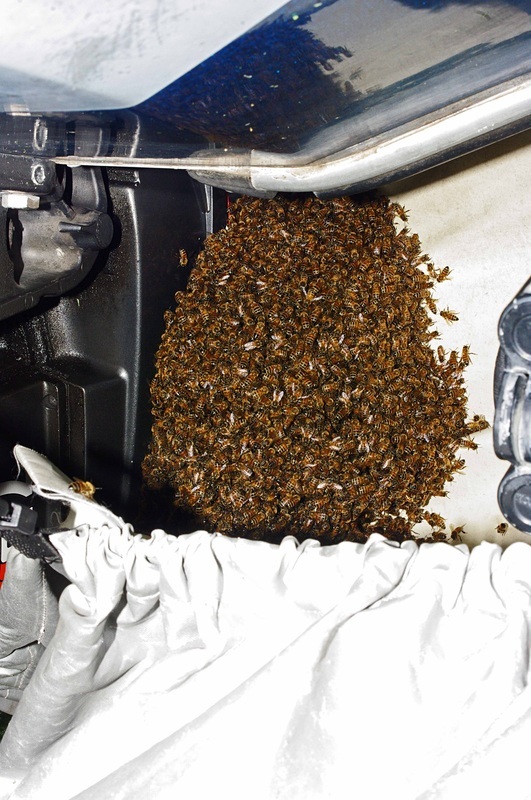 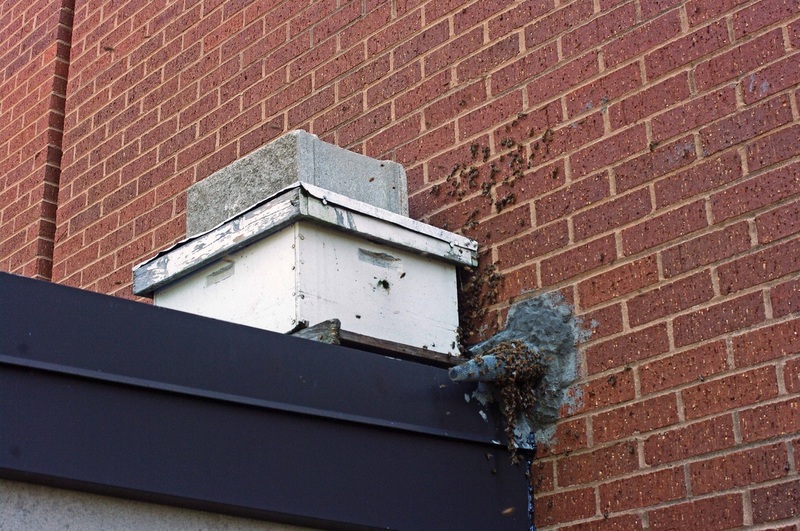 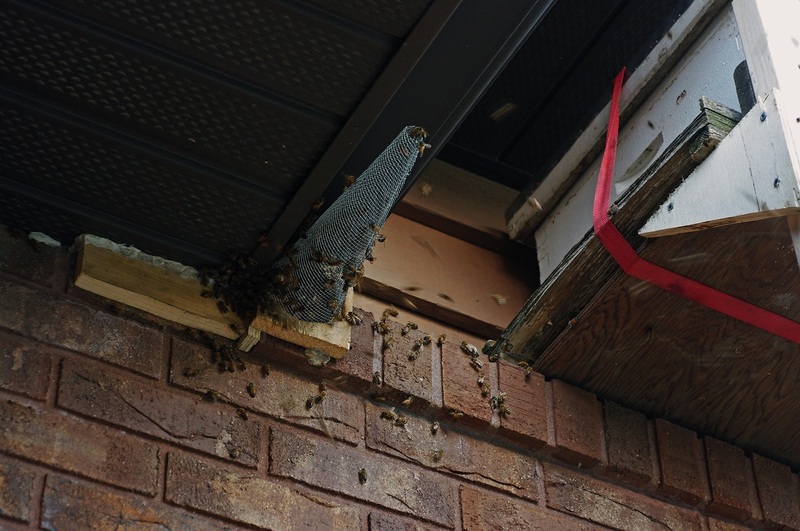 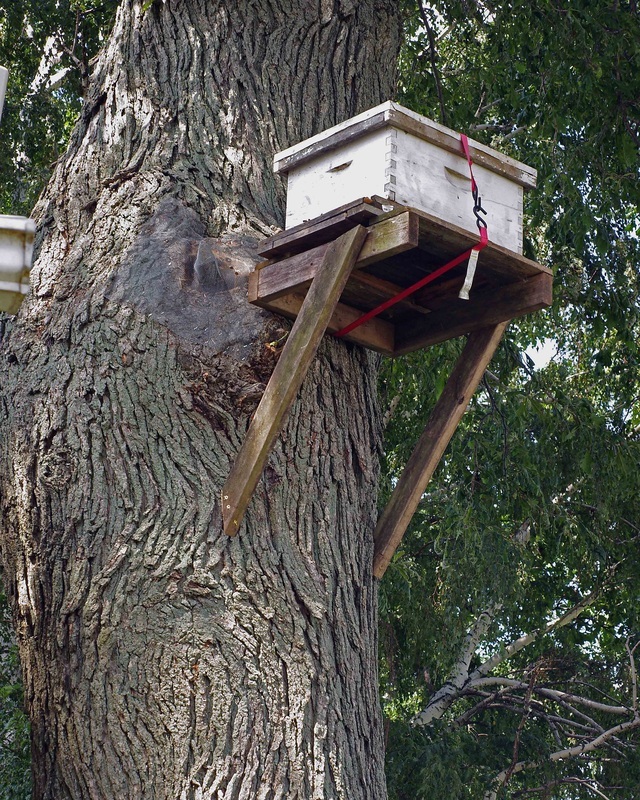 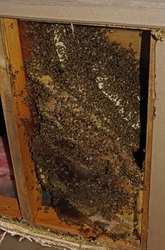 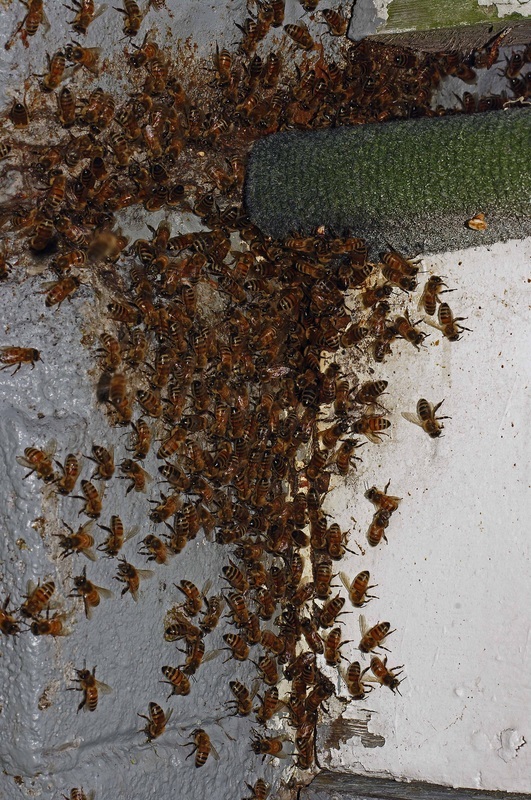 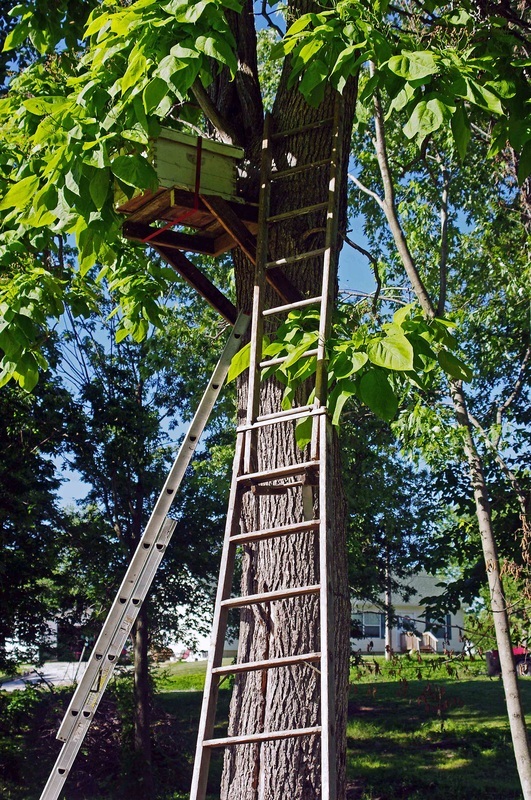 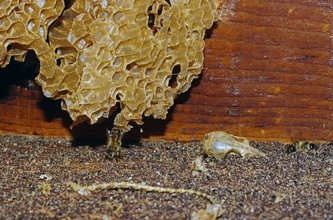 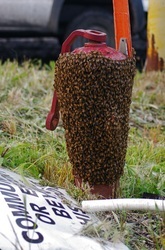 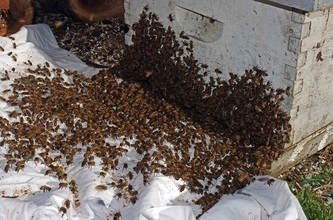 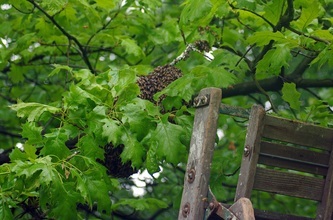 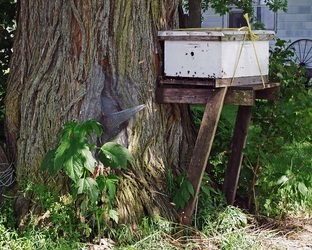 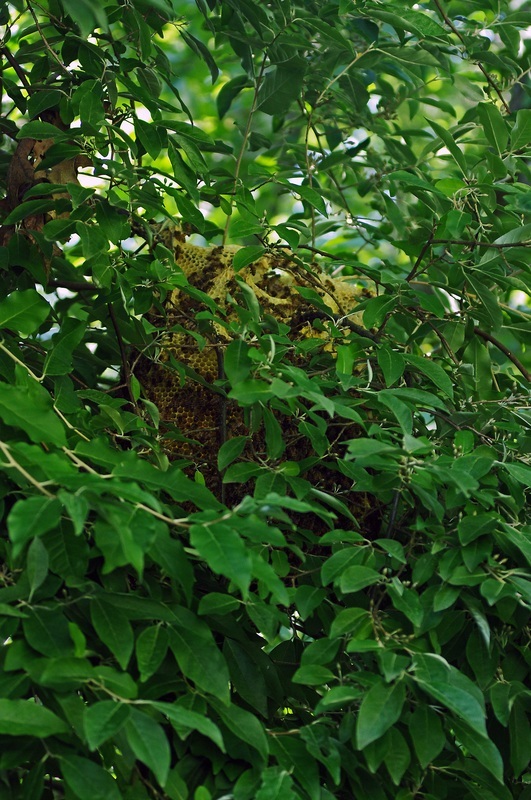 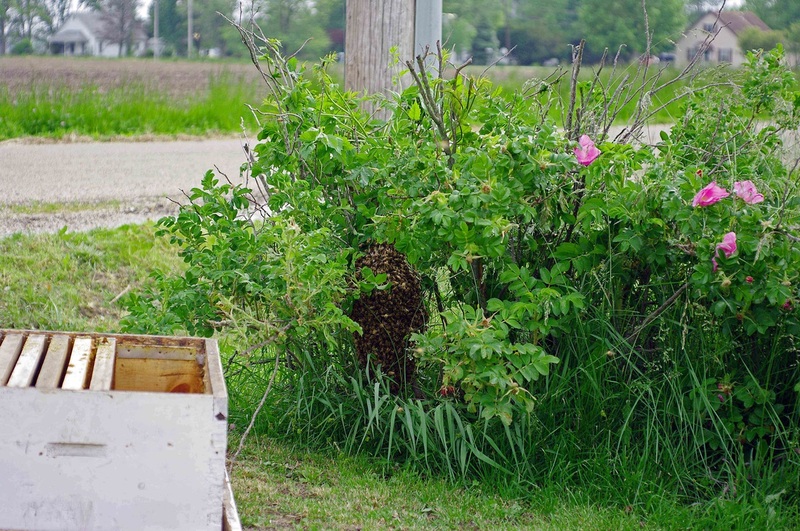 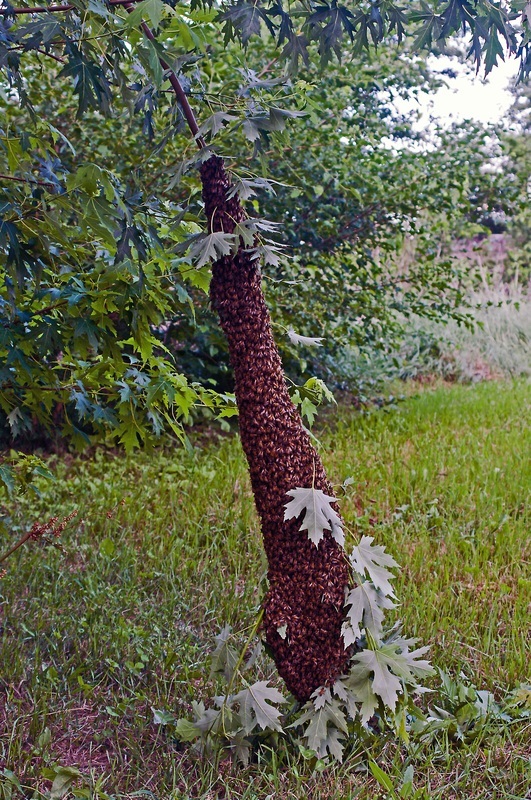 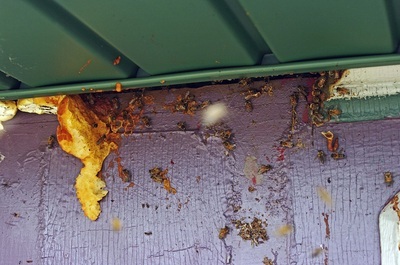 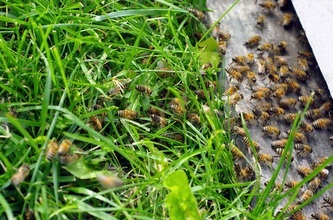 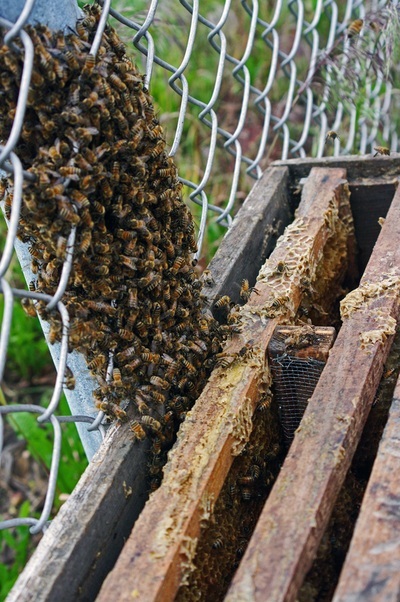 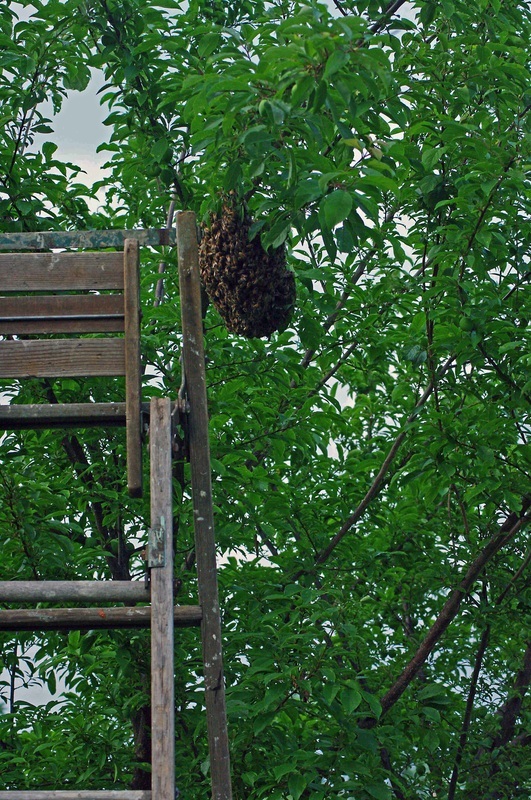 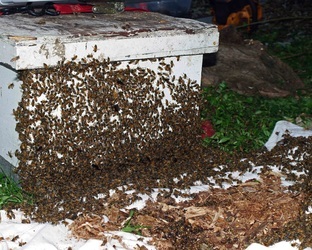 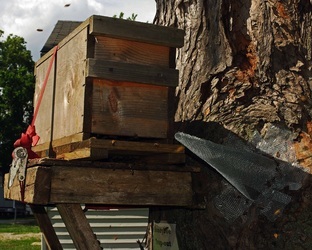 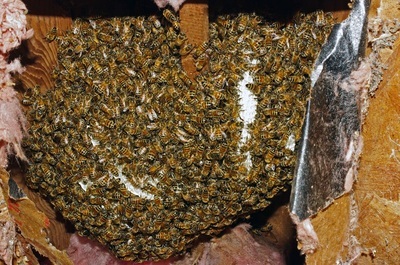 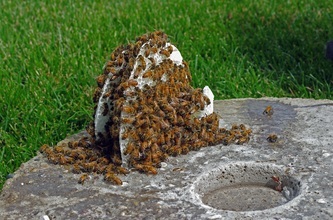 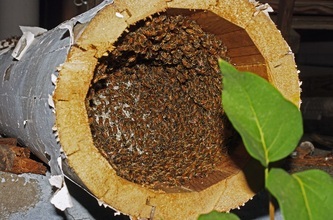 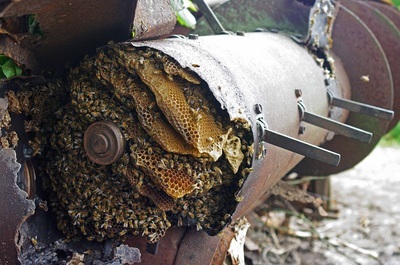 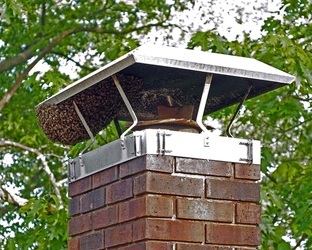 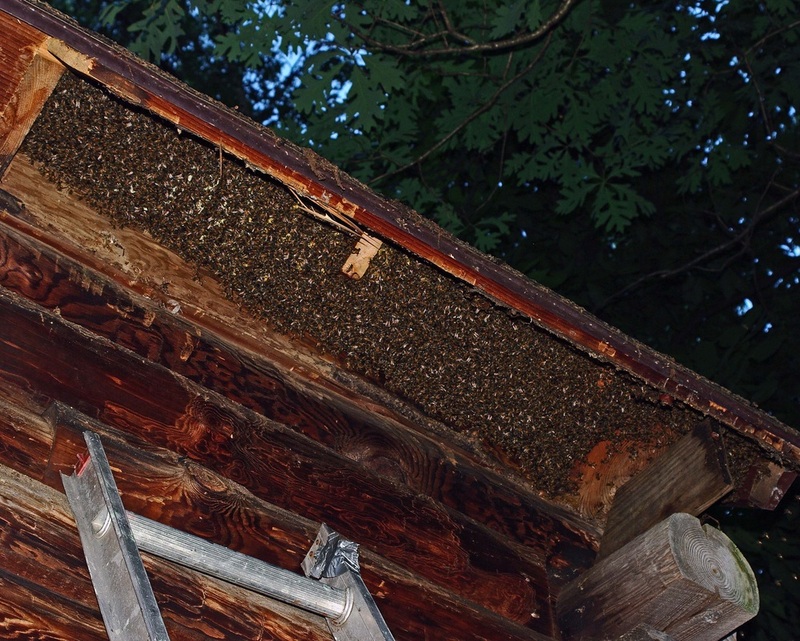 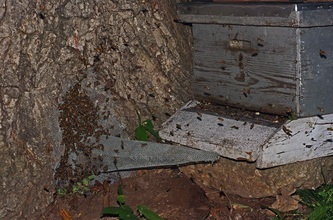 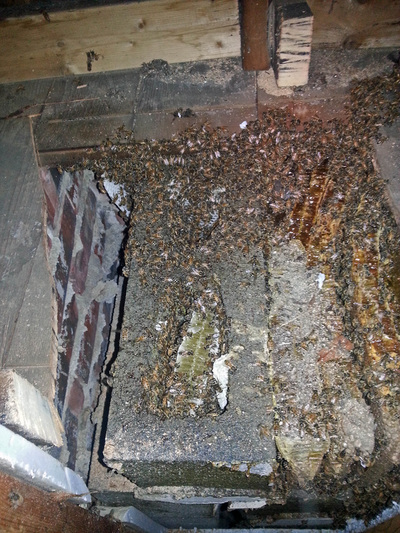 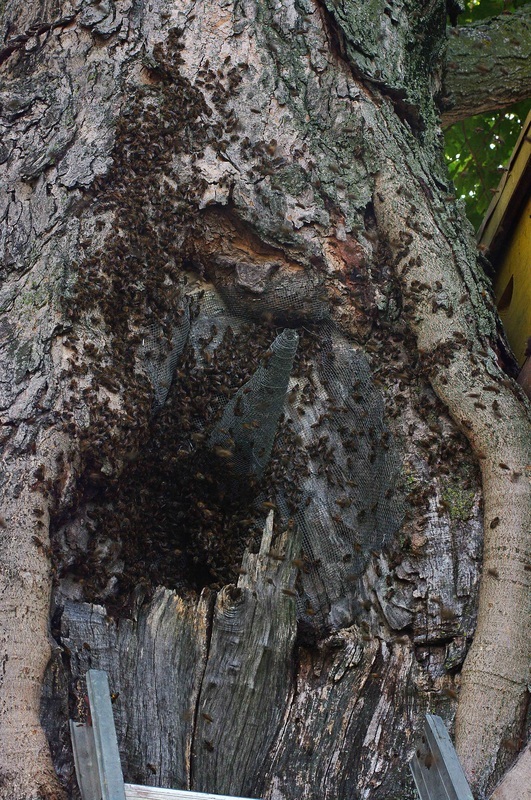 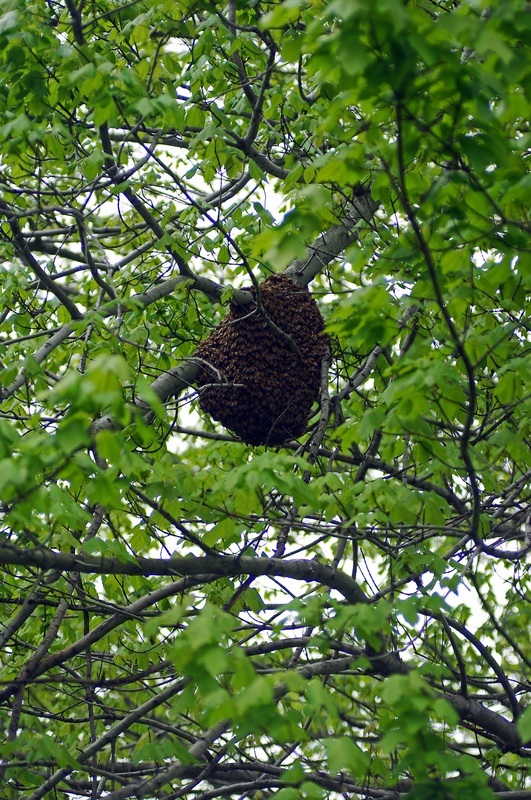 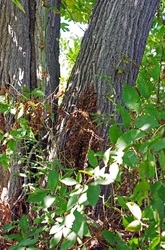 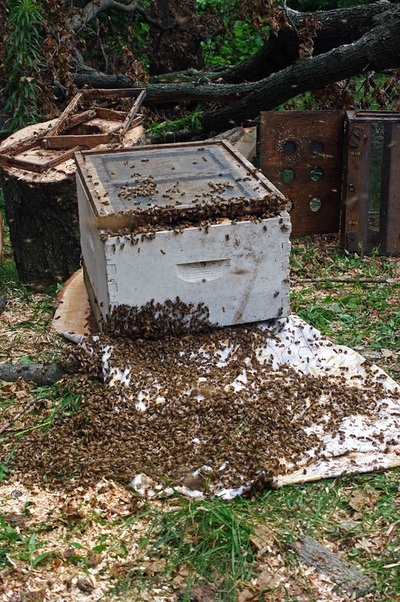 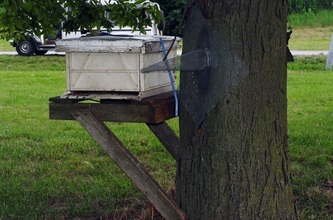 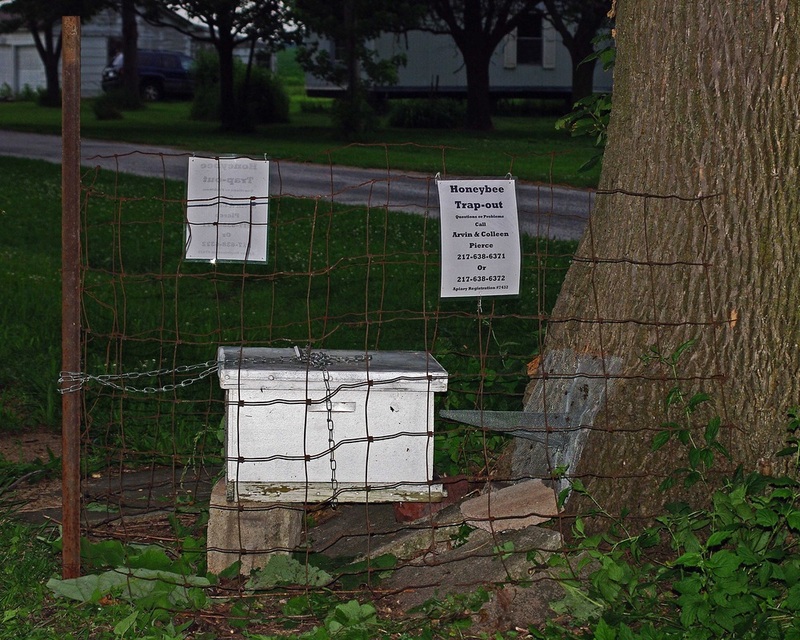 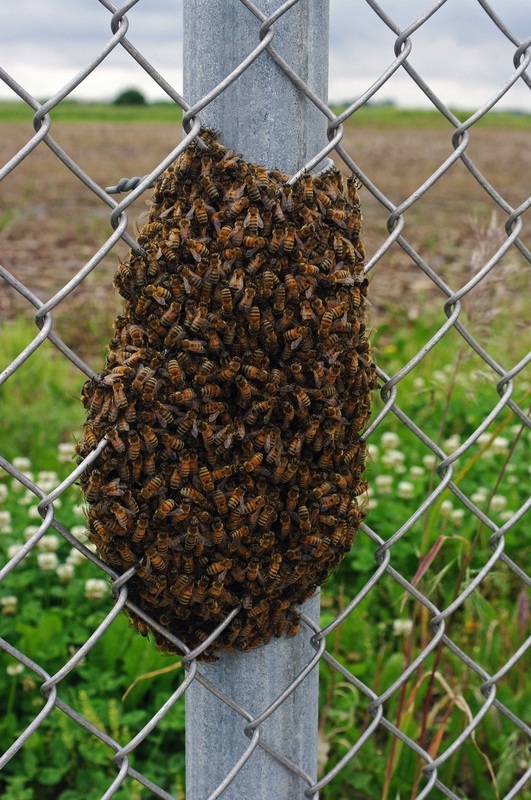 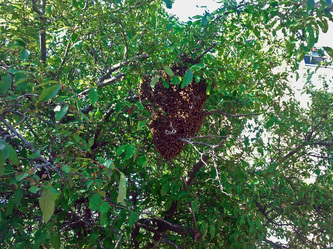 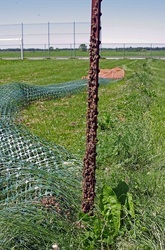 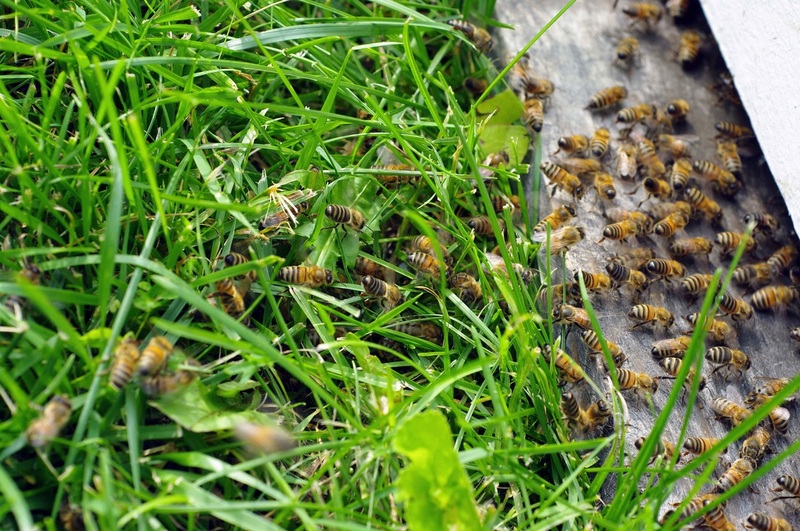 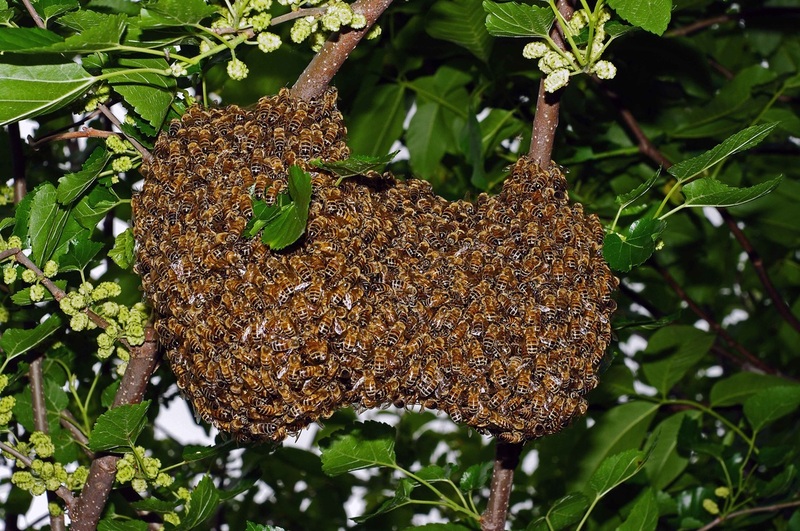 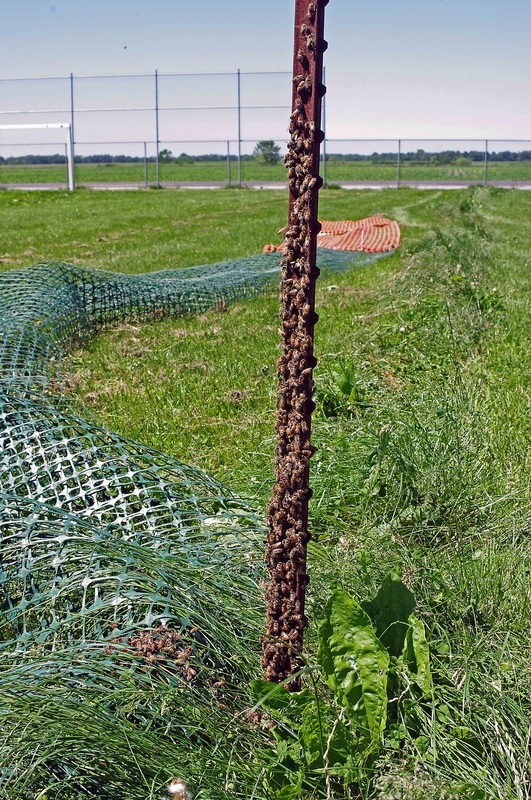 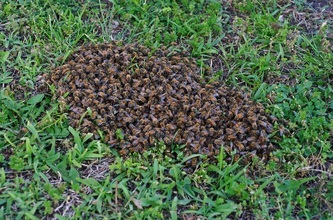 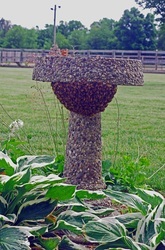 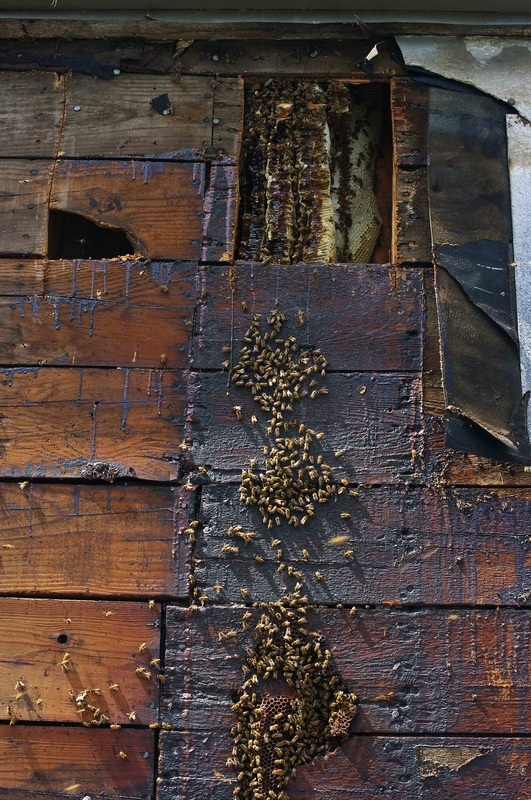 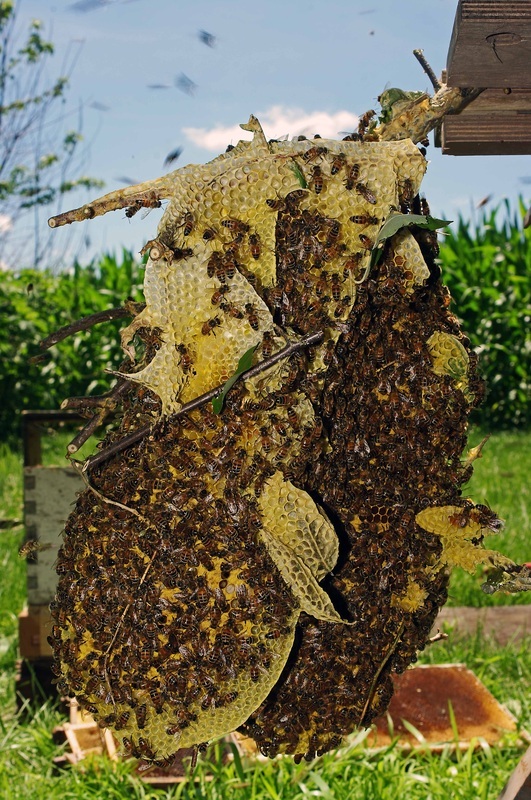 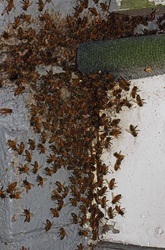 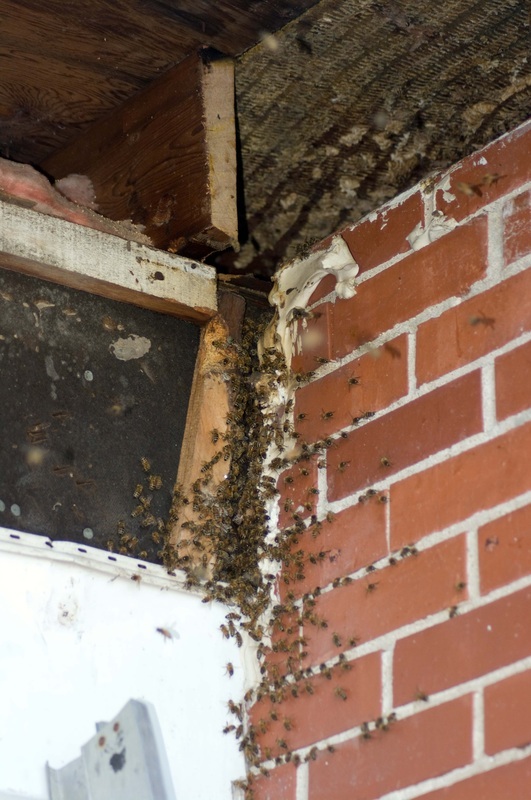 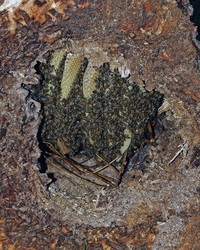 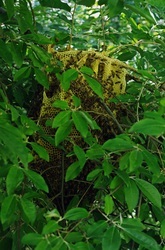 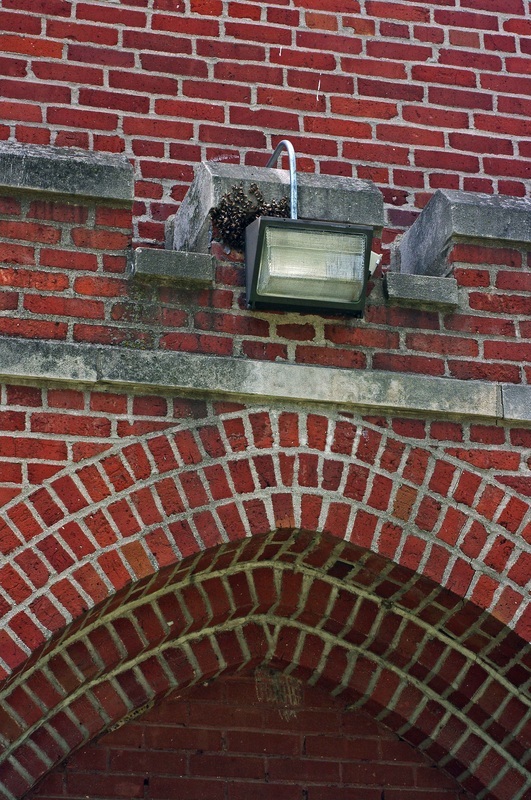 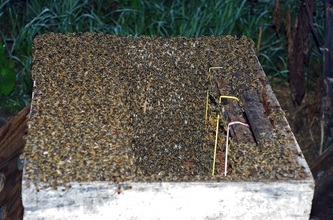 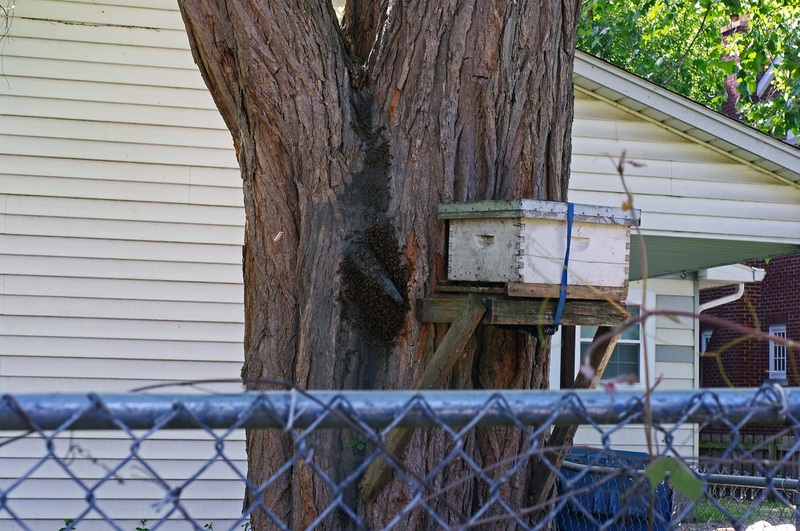 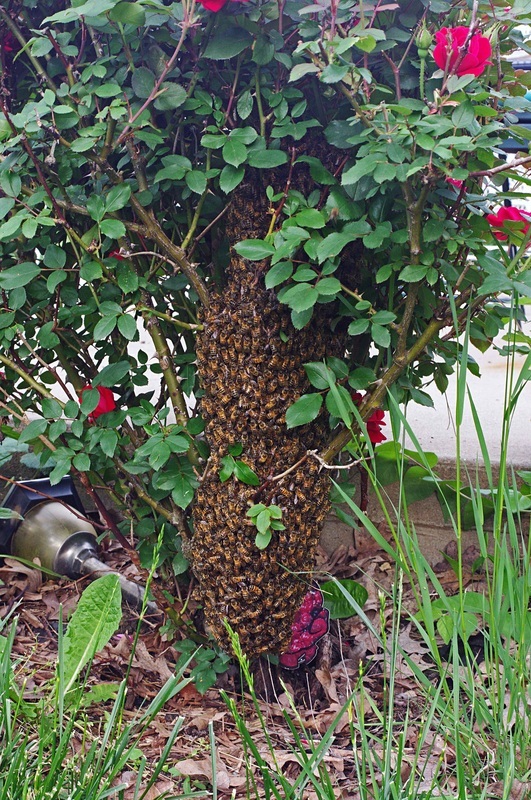 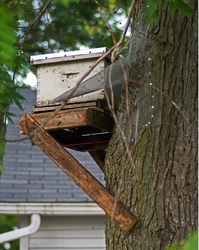 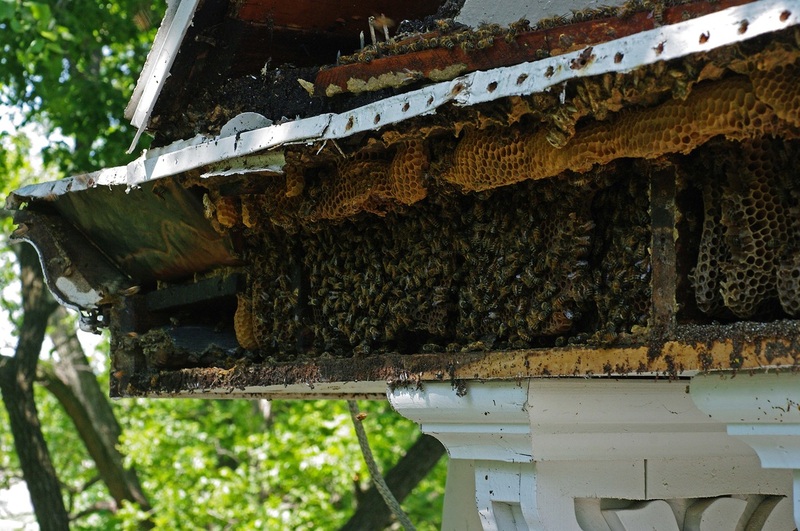 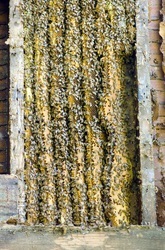 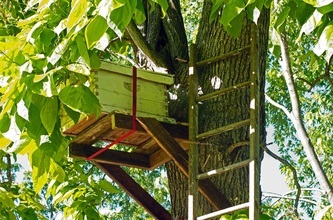 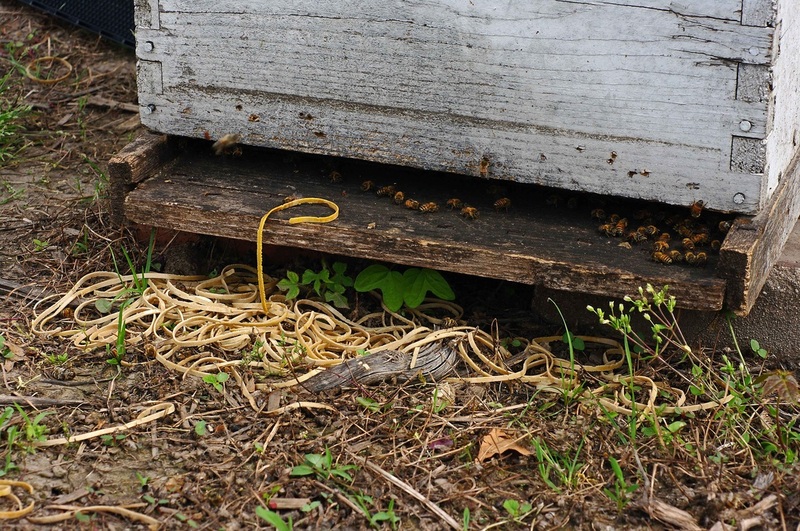 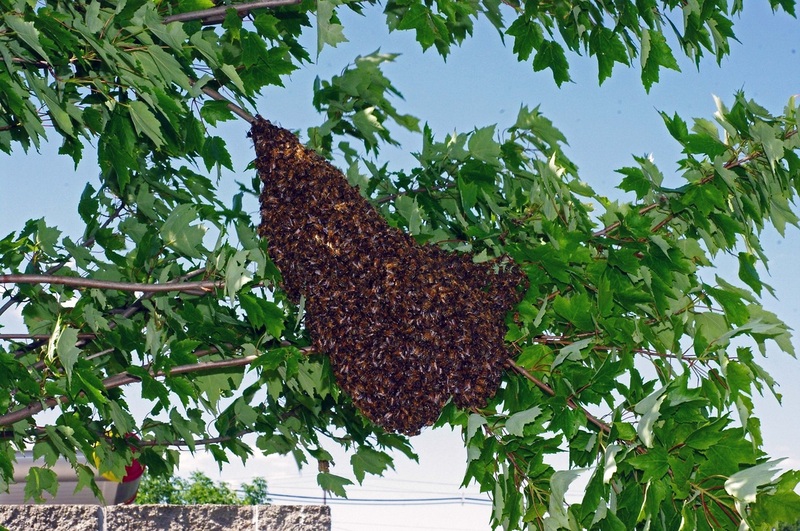 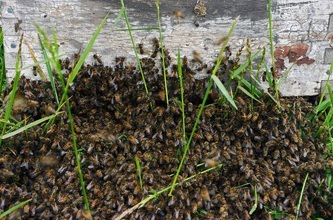 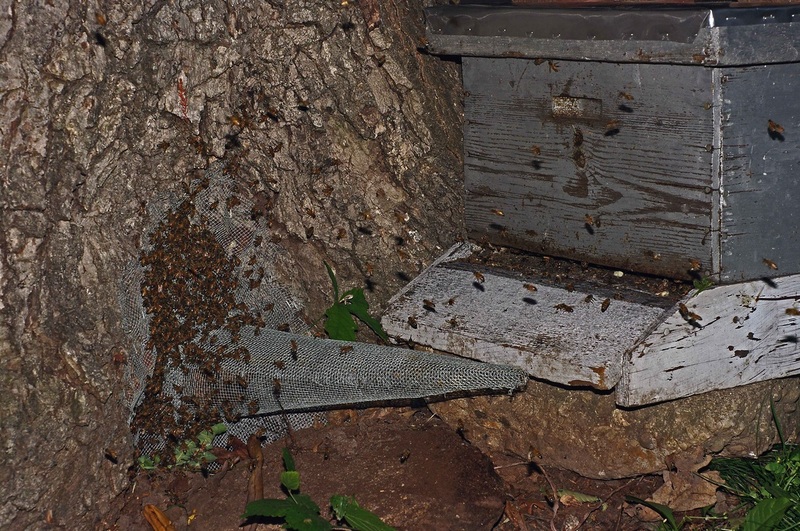 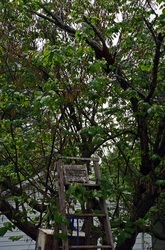 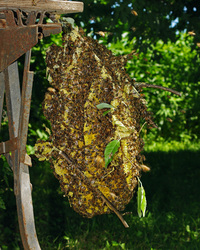 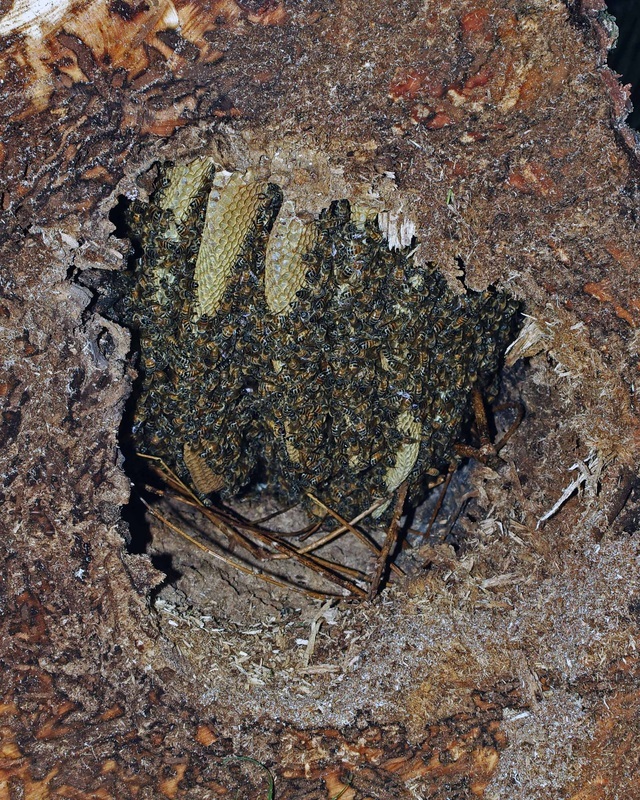 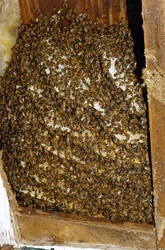 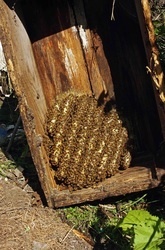 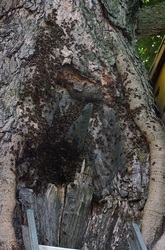 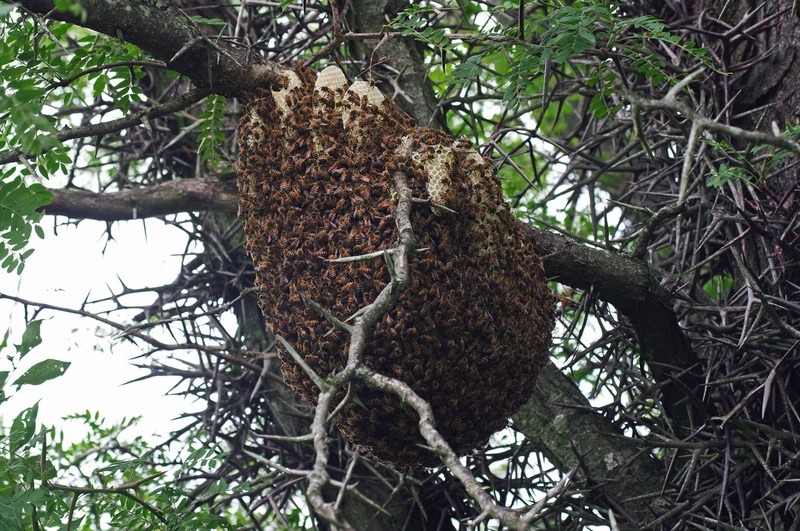 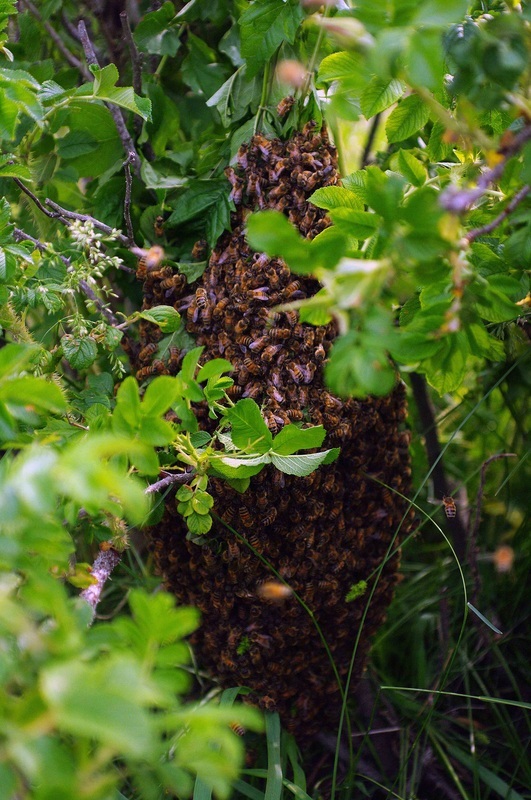 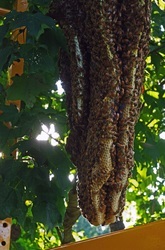 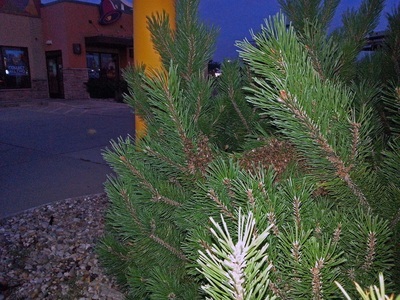 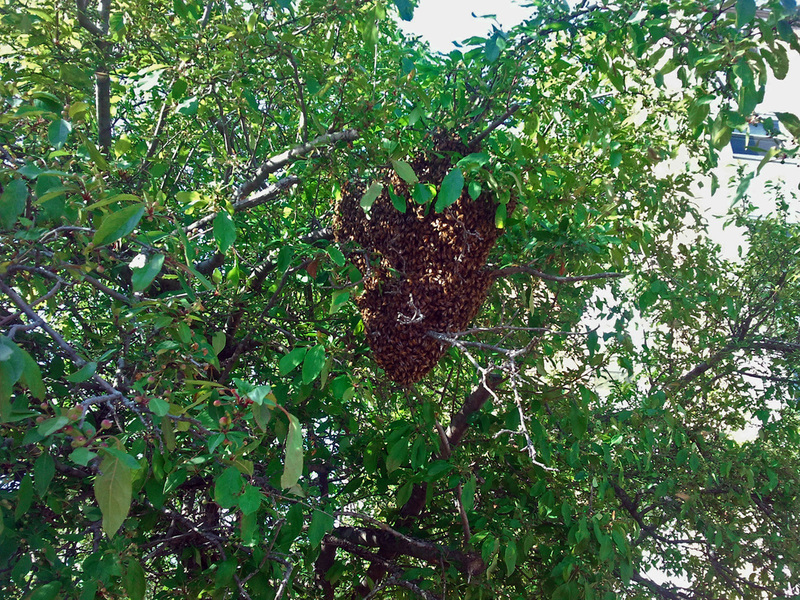 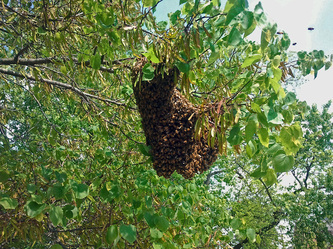 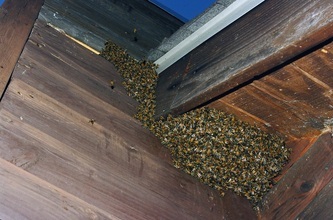 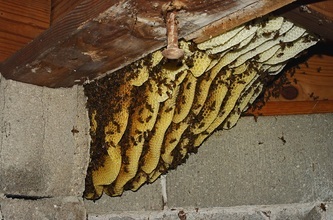 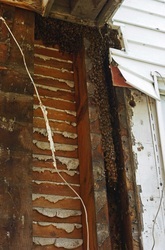 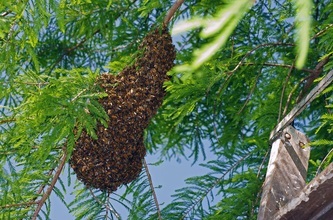 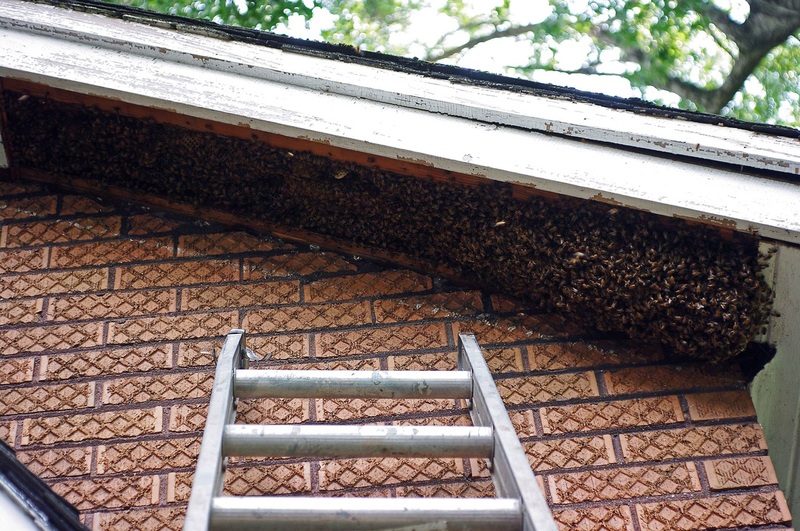 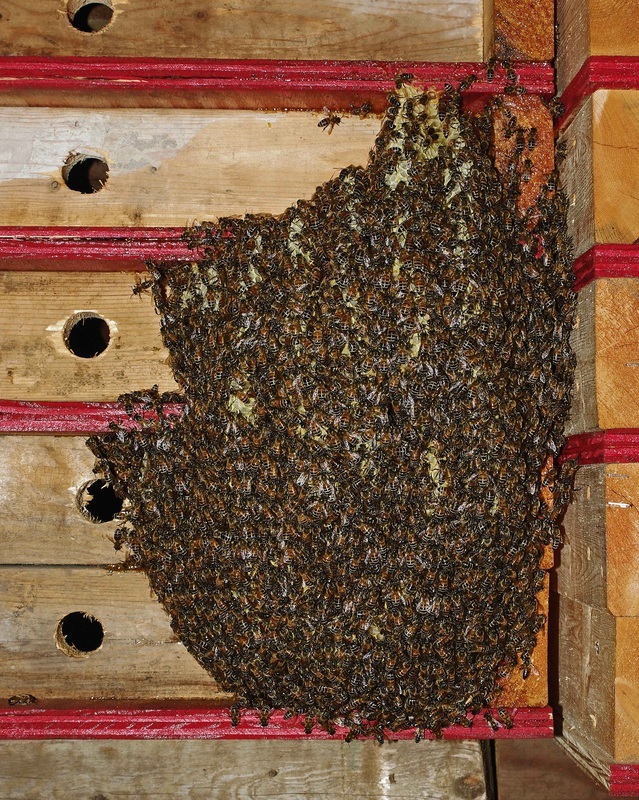 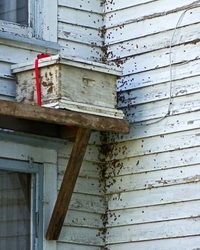 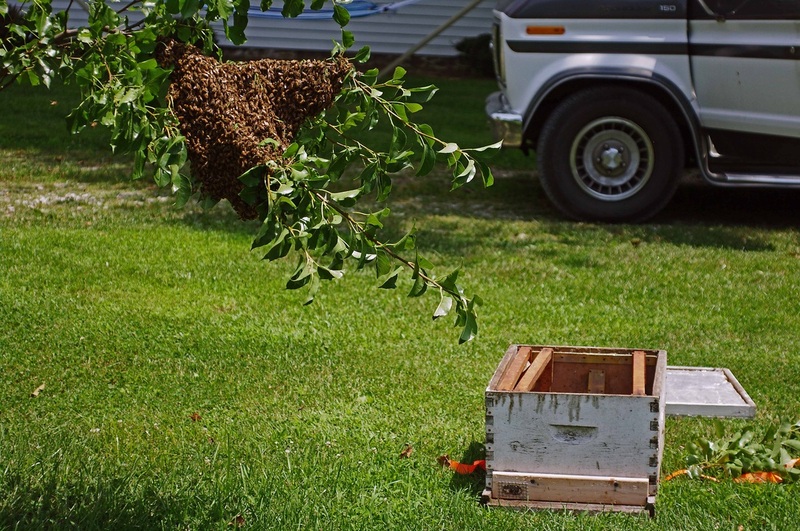 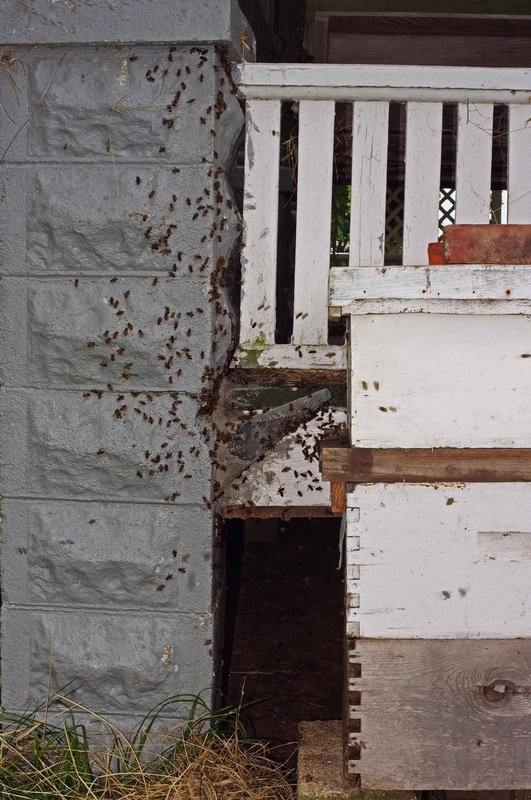 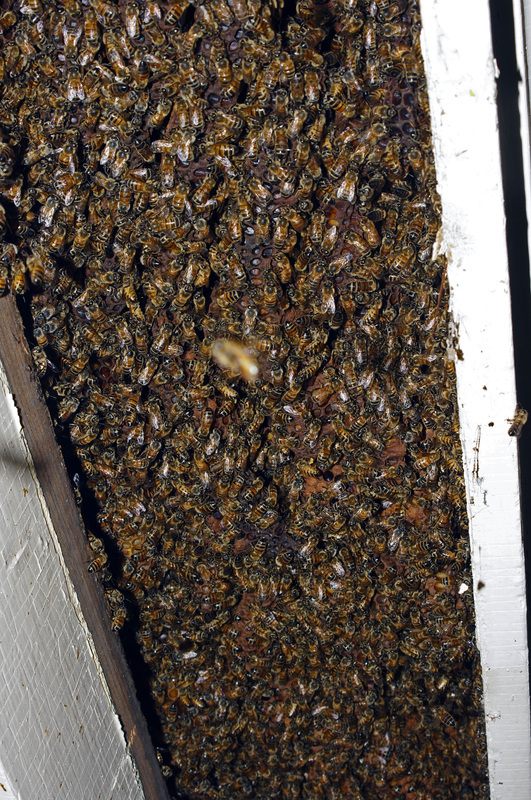 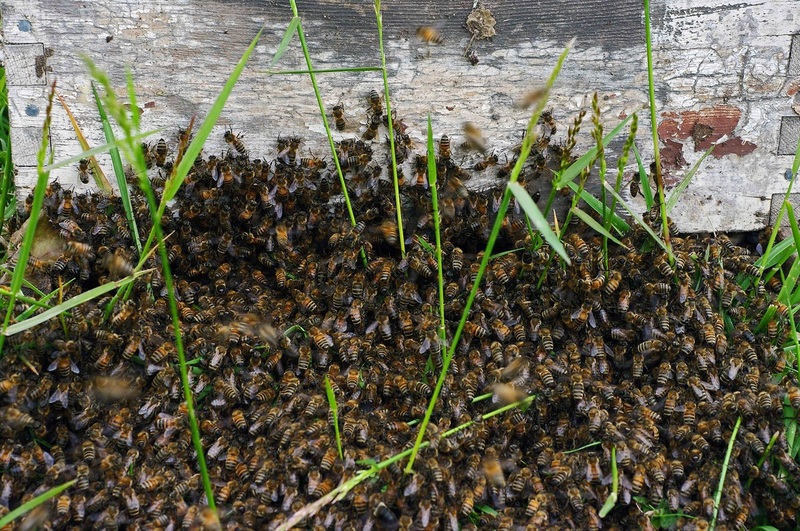 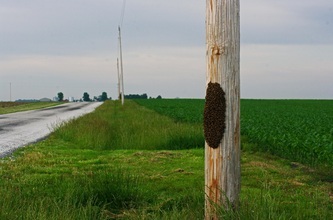 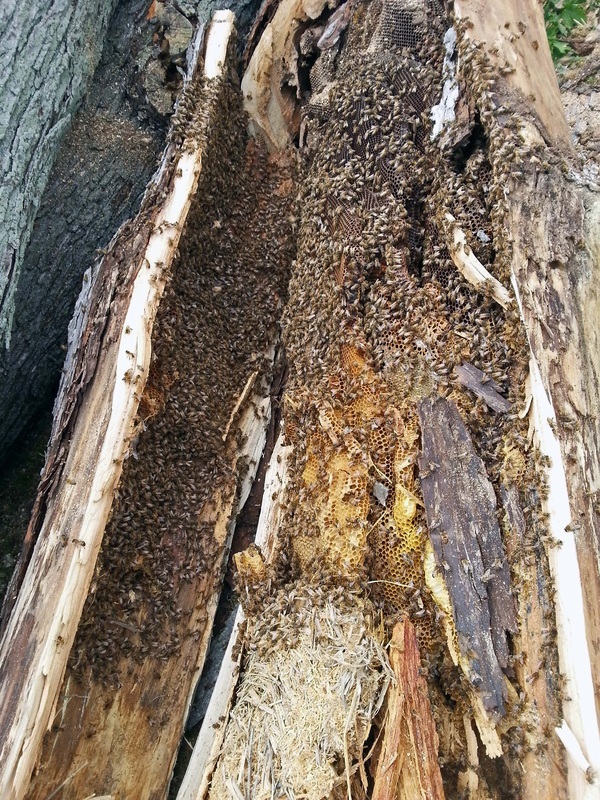 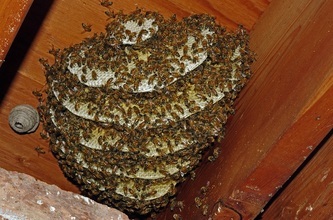 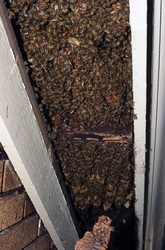 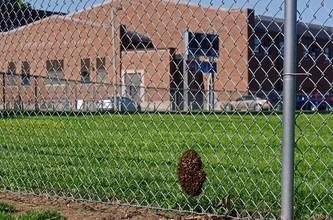 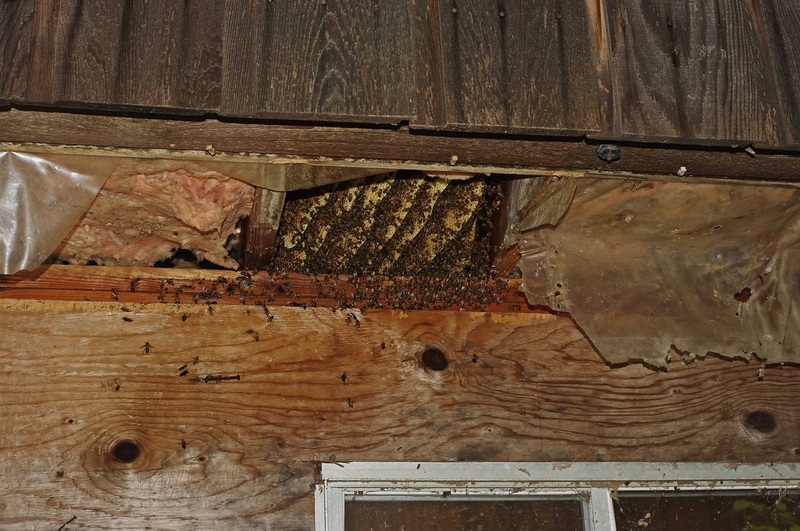 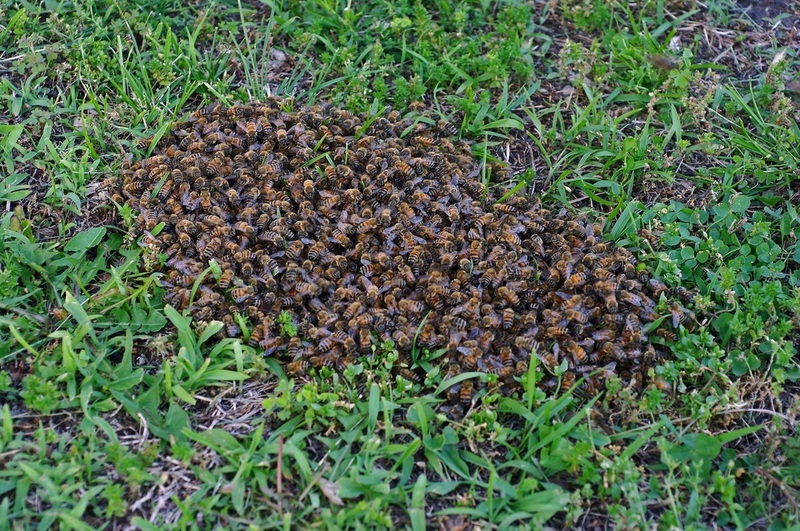 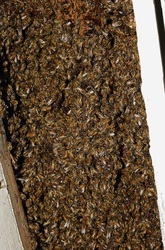 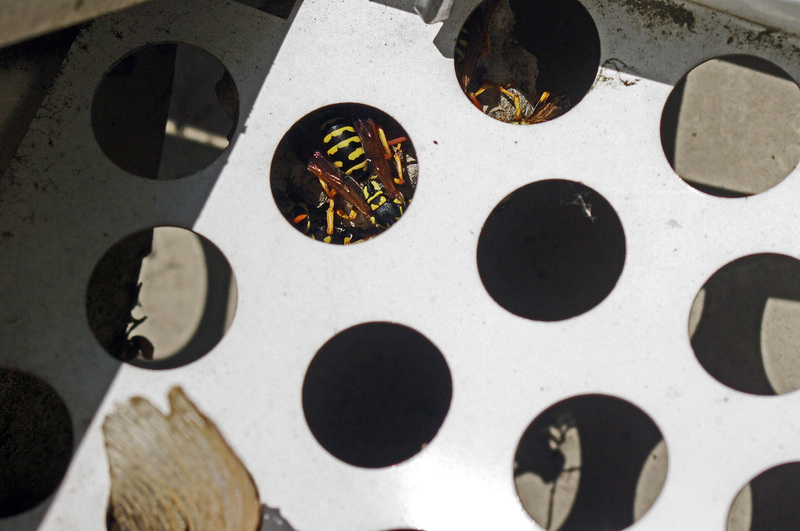 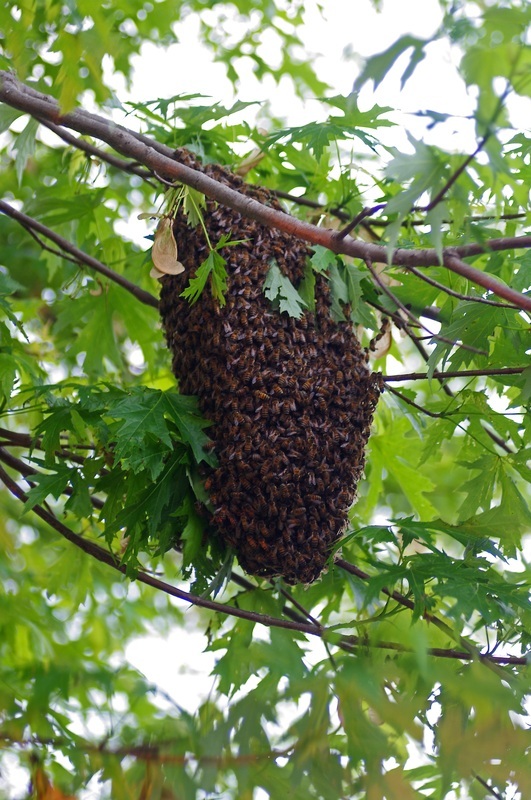 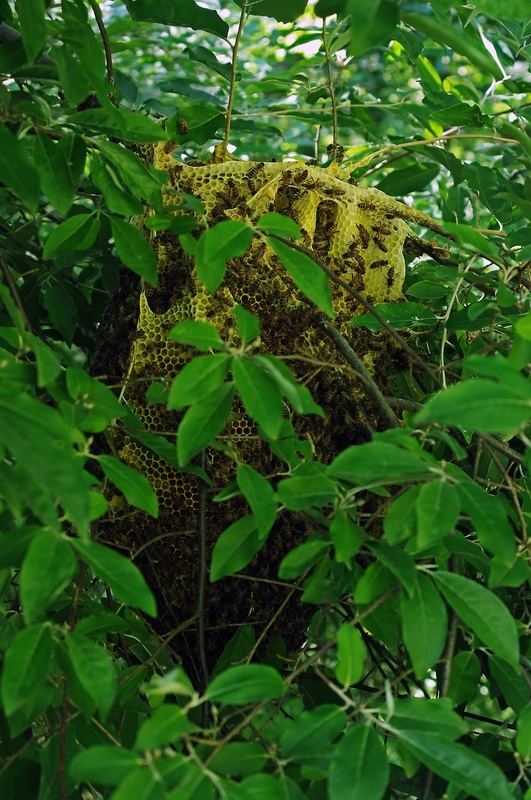 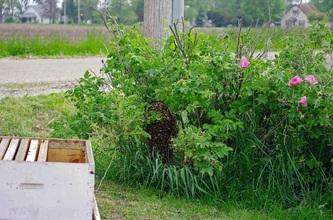 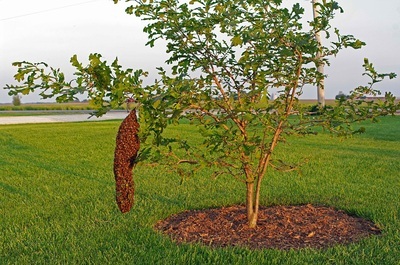 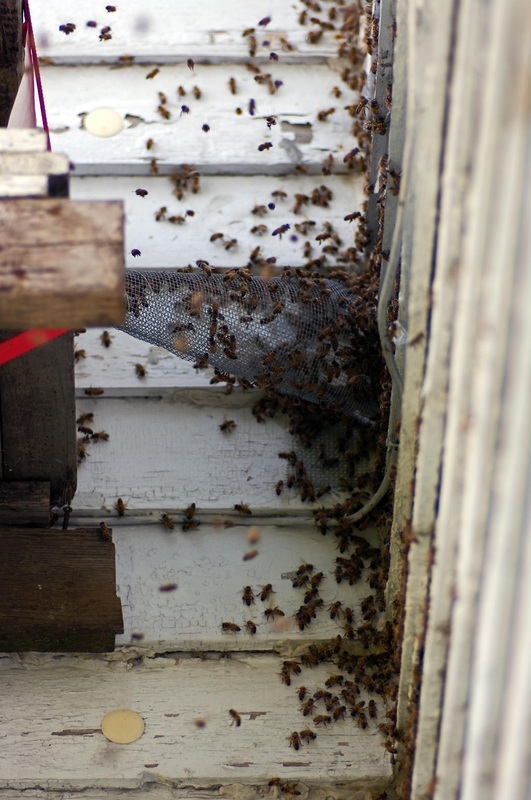 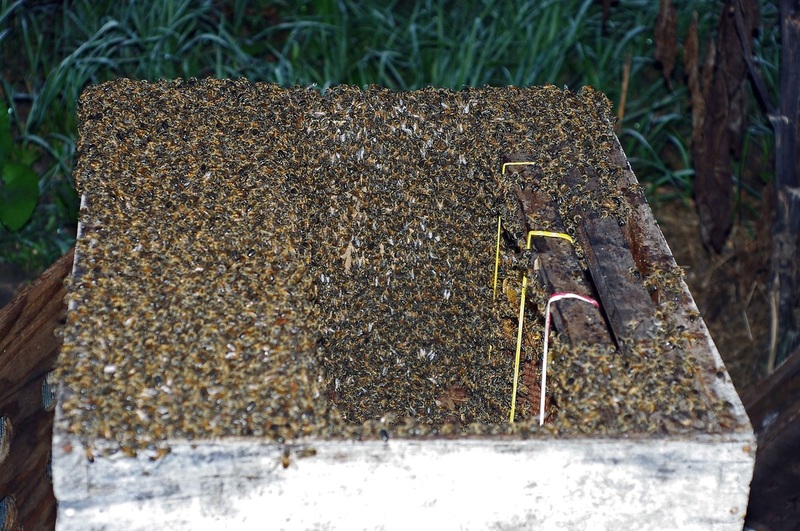 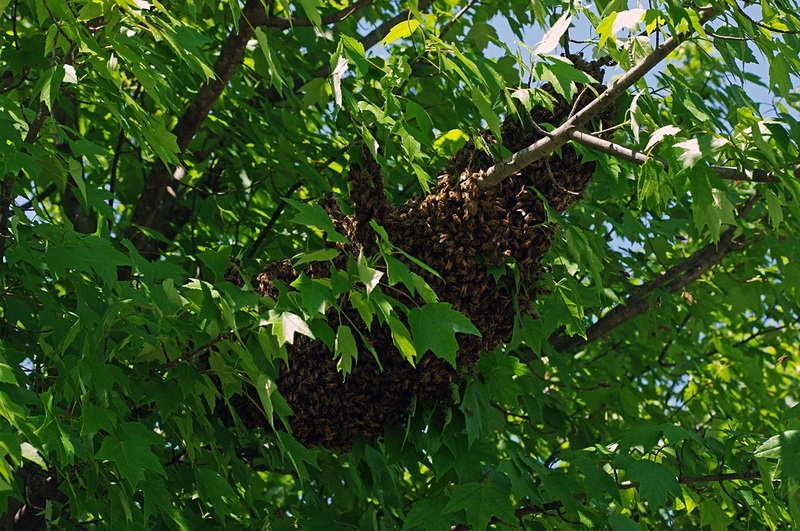 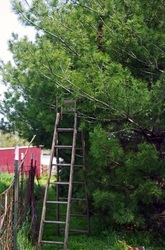 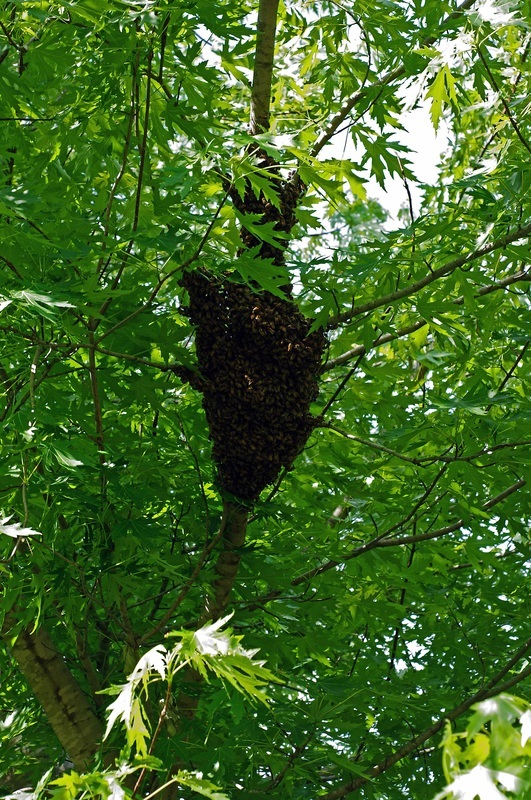 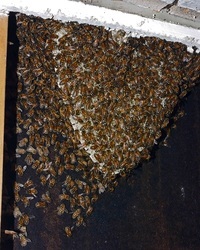 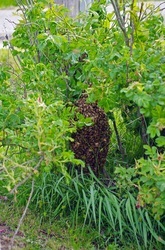 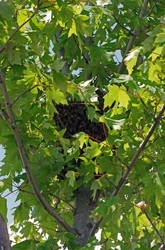 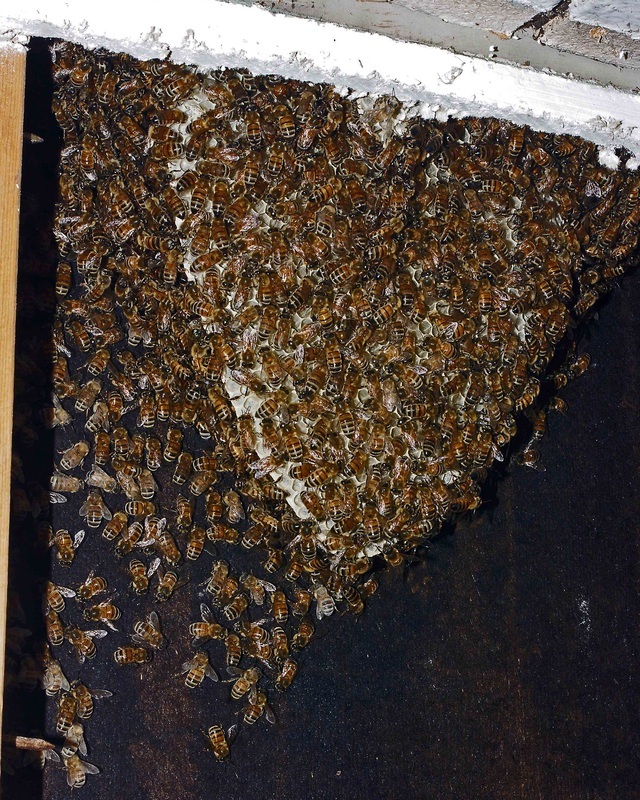 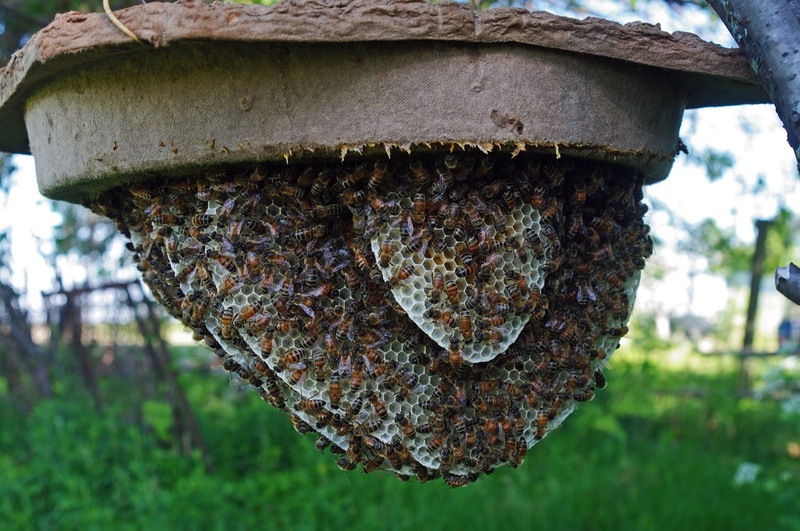 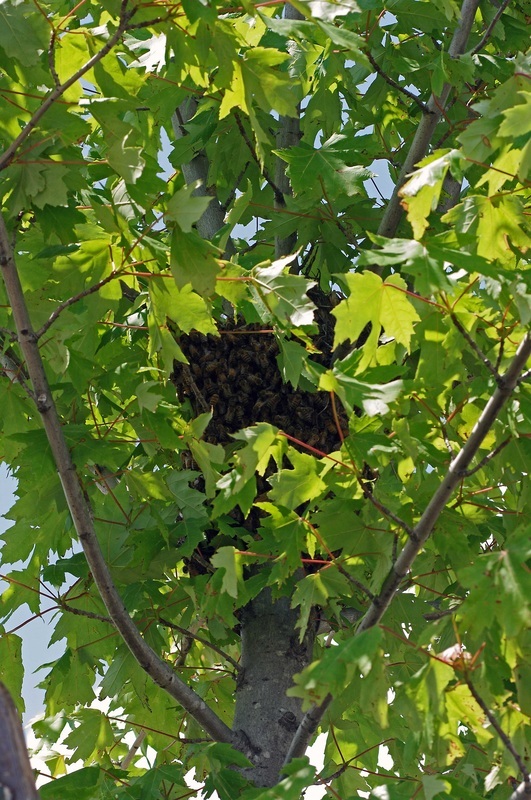 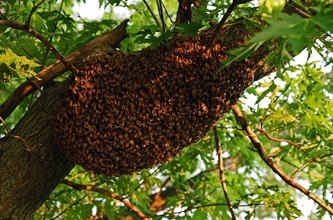 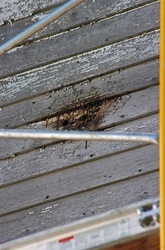 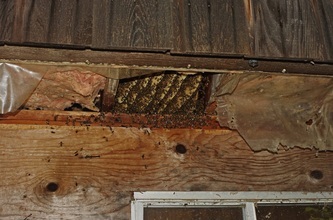 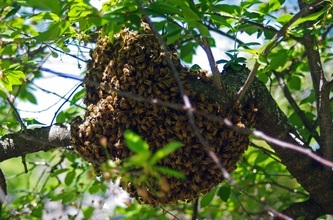 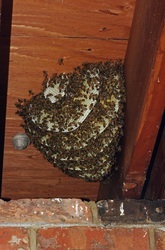 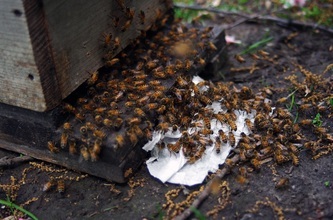 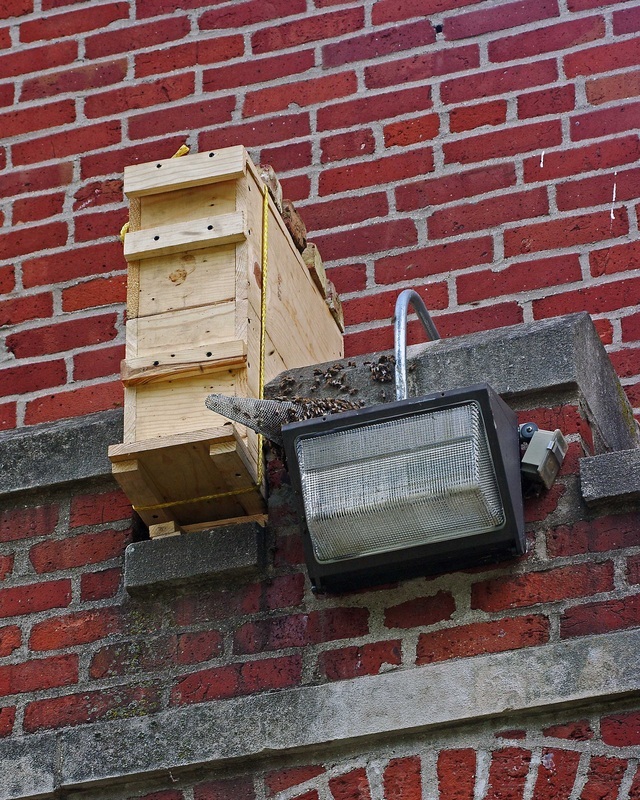 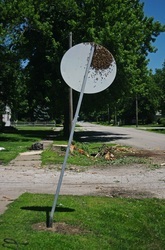 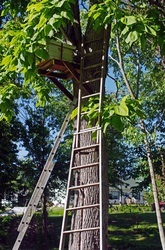 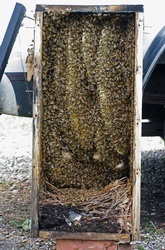 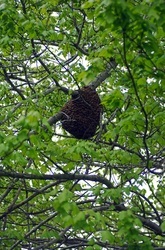 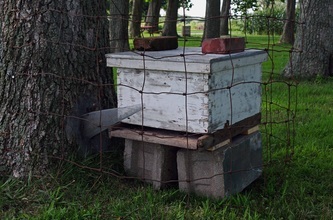 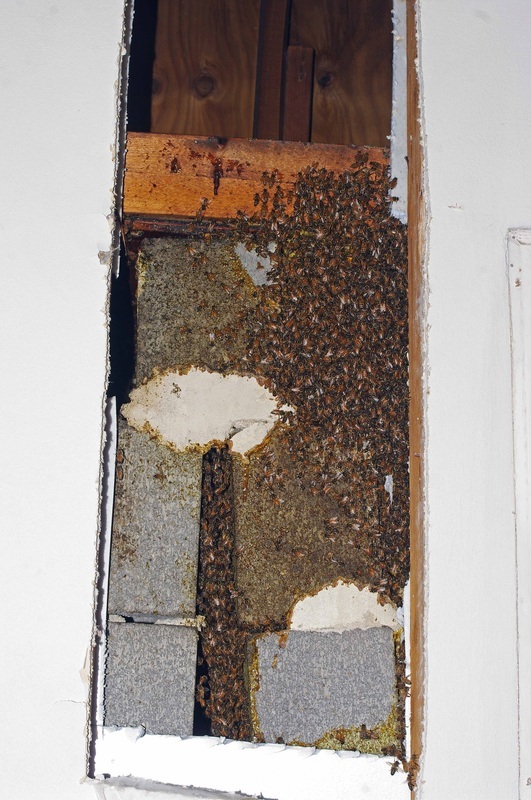 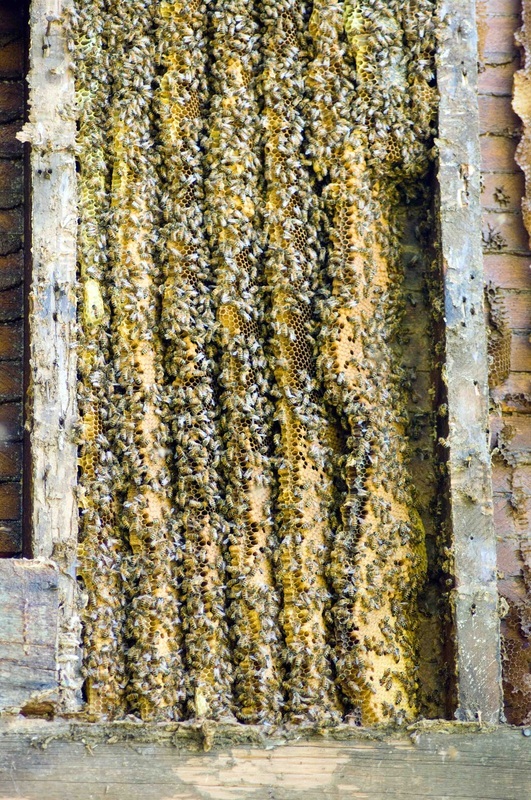 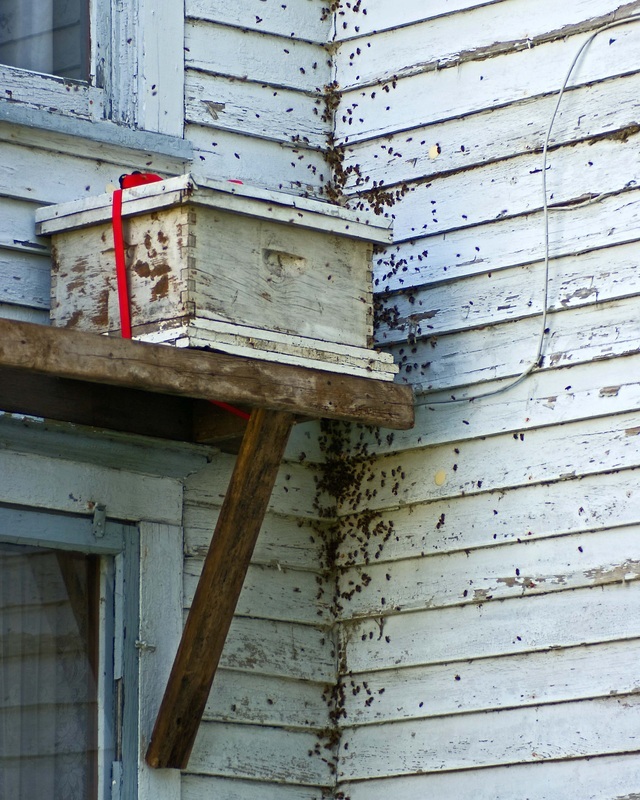 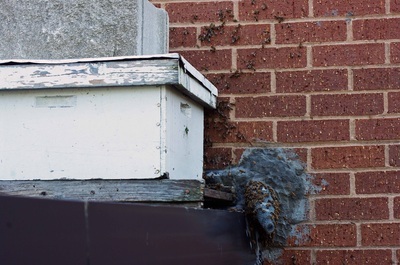 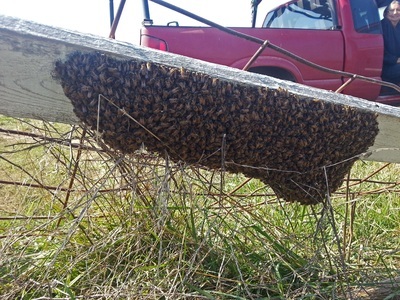 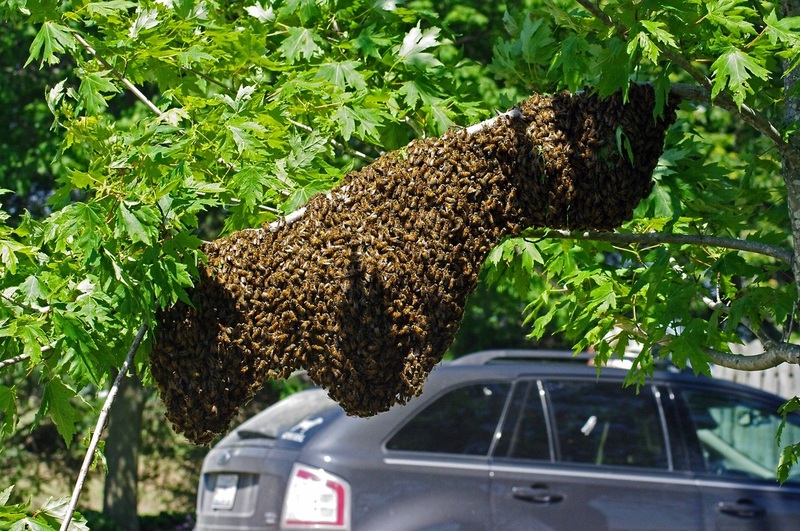 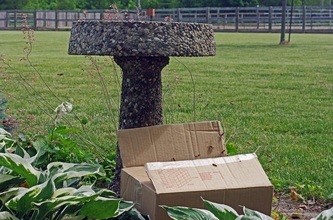 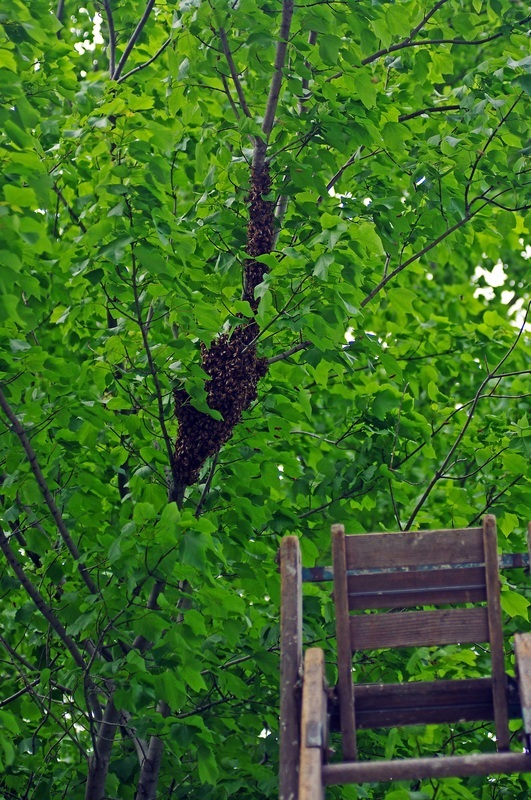 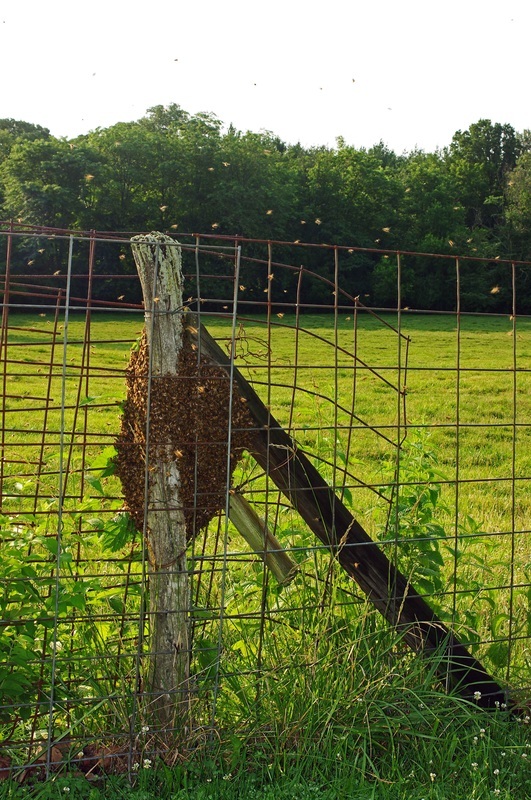 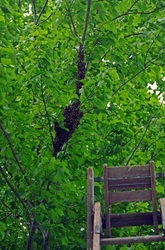 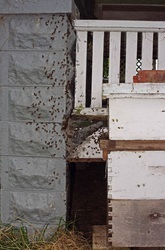 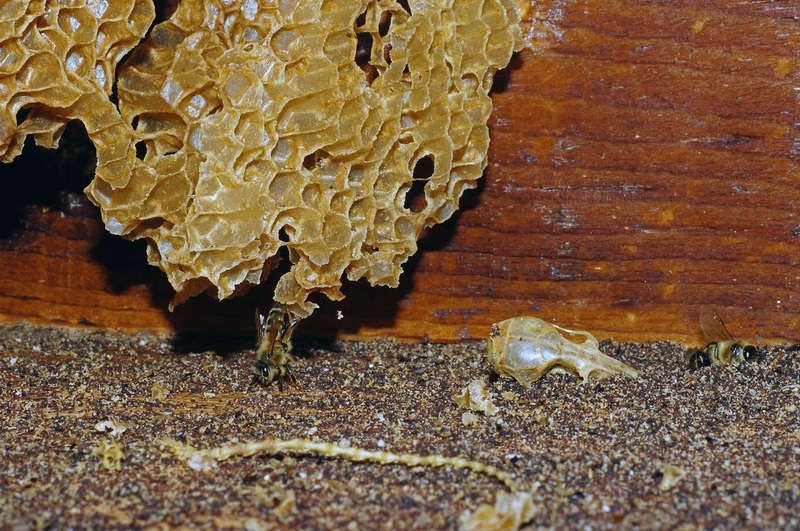 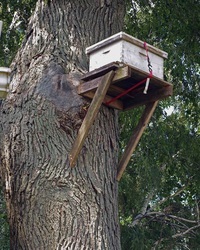 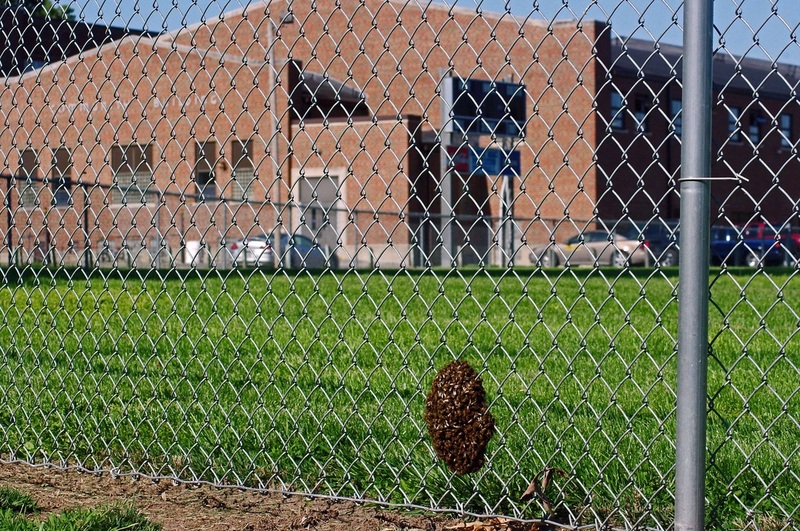 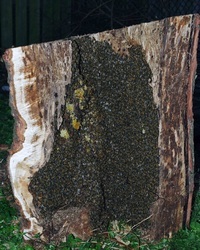 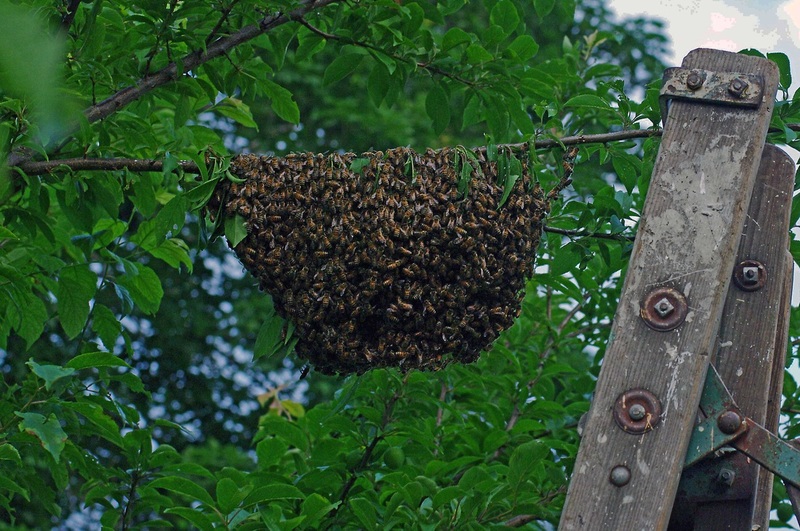 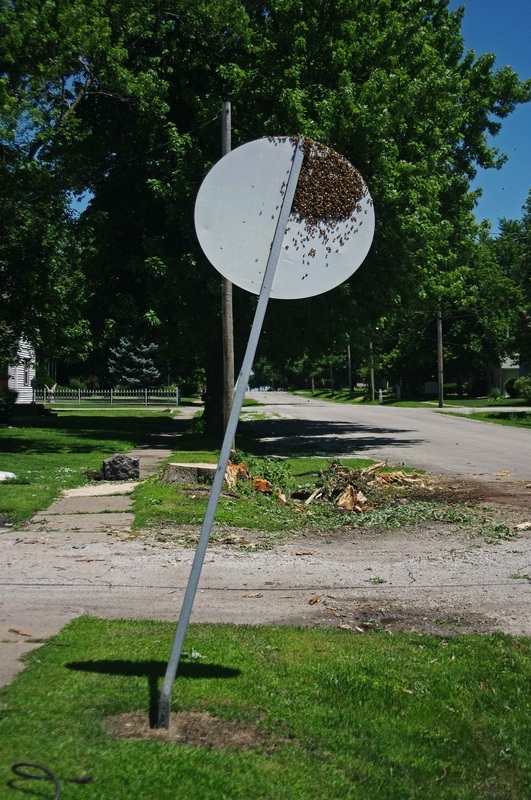 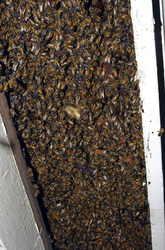 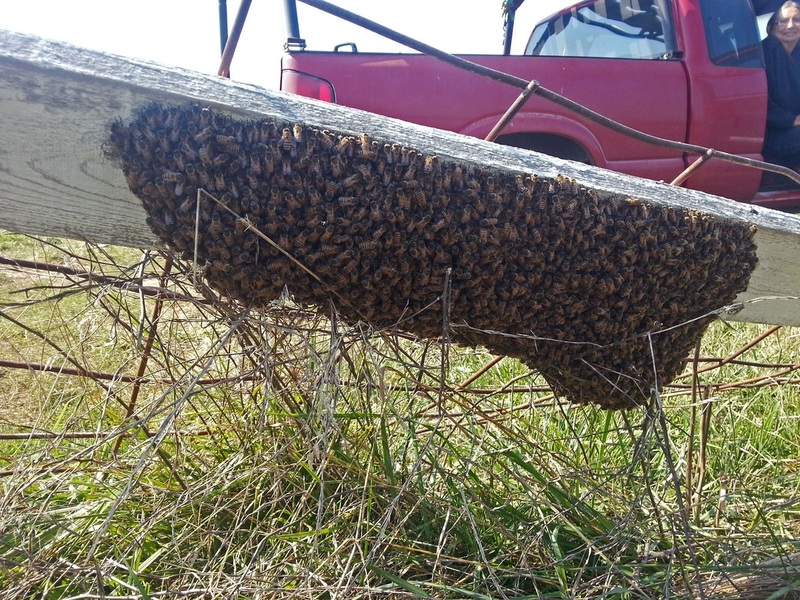 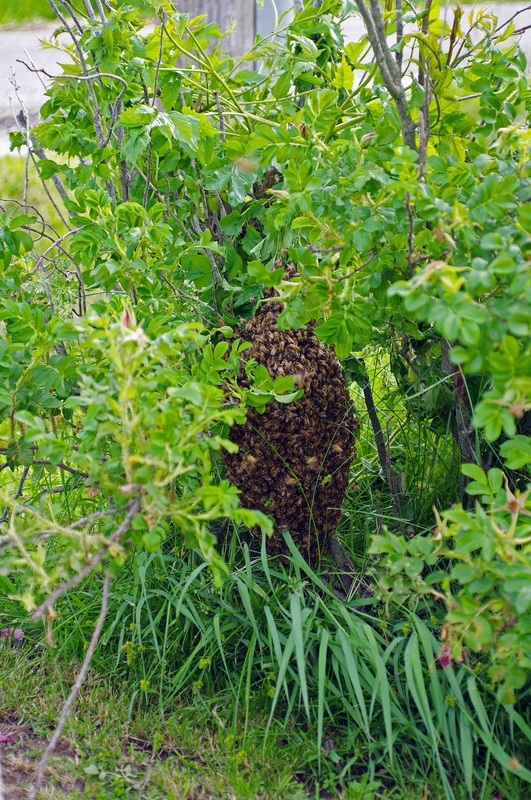 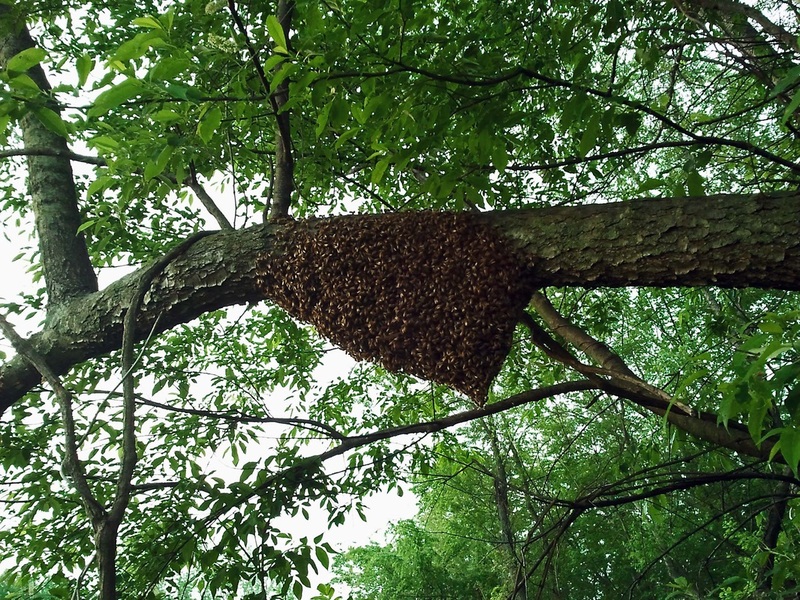 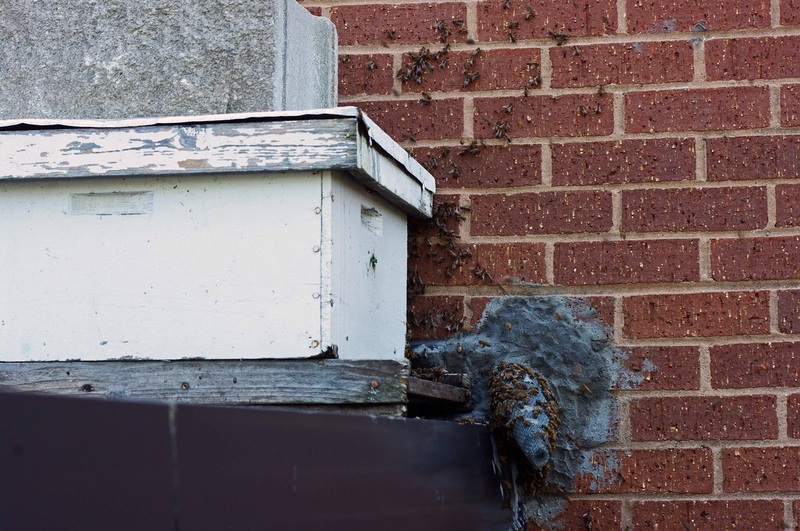 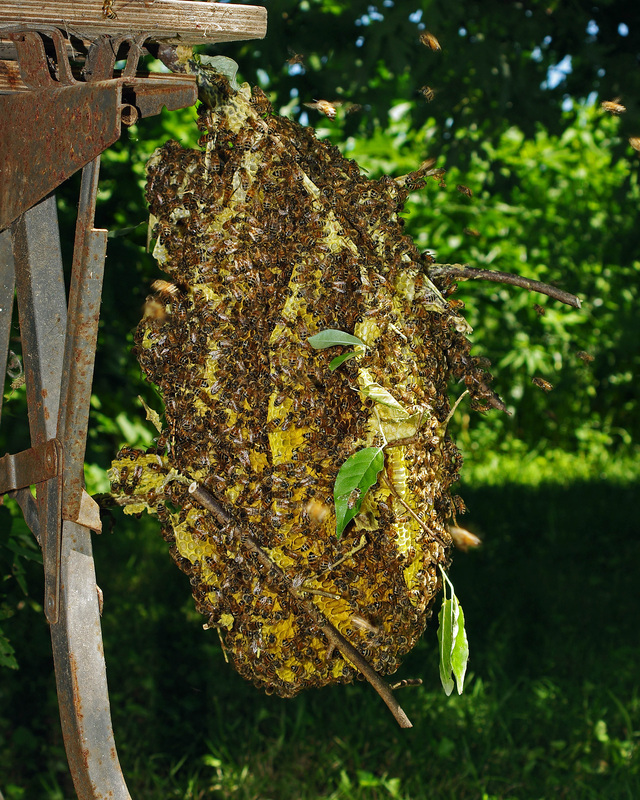 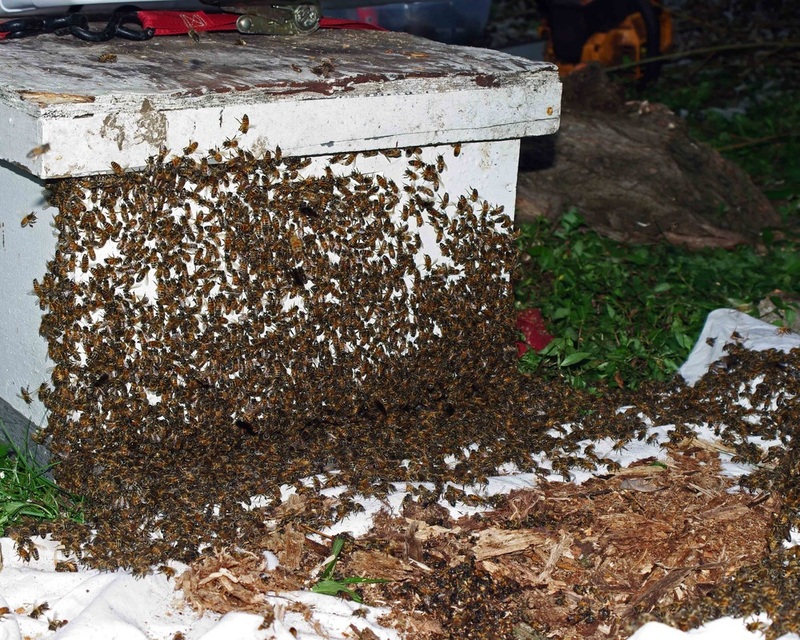 A swarm will usually not stay in a location more than a few days and can leave within hours. 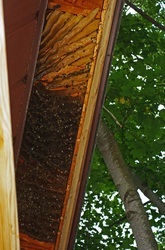 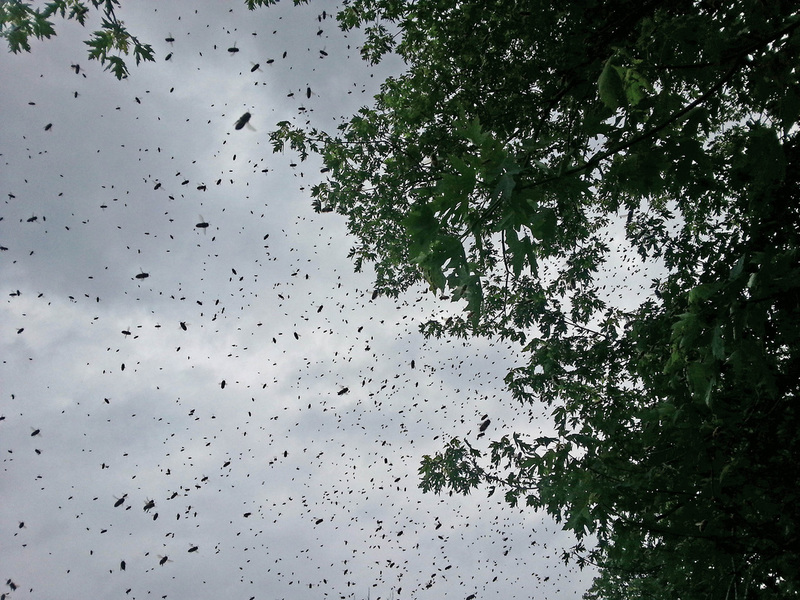 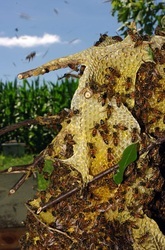 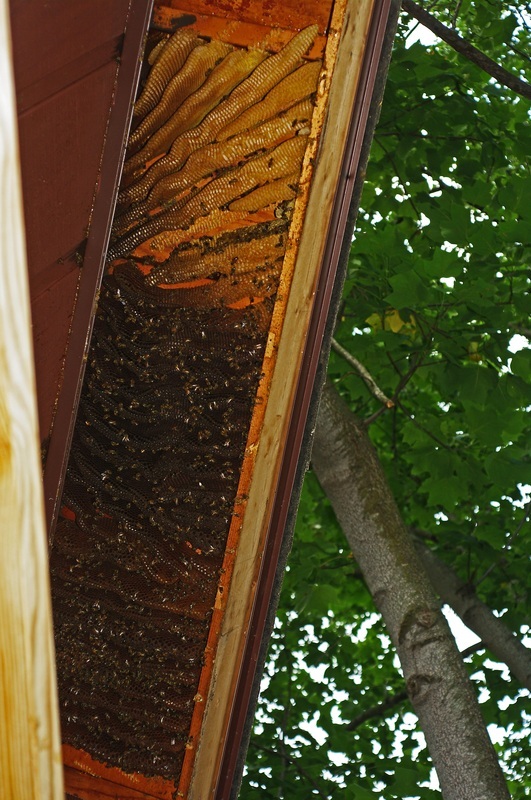 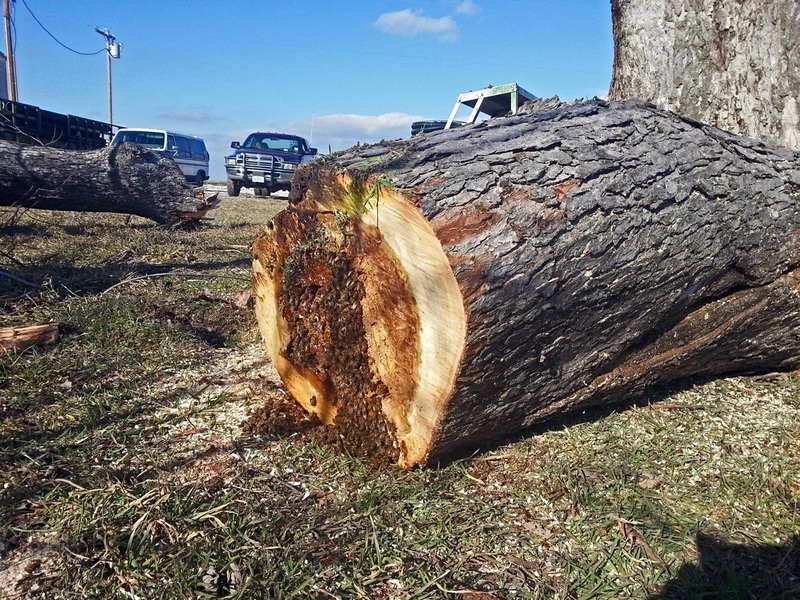 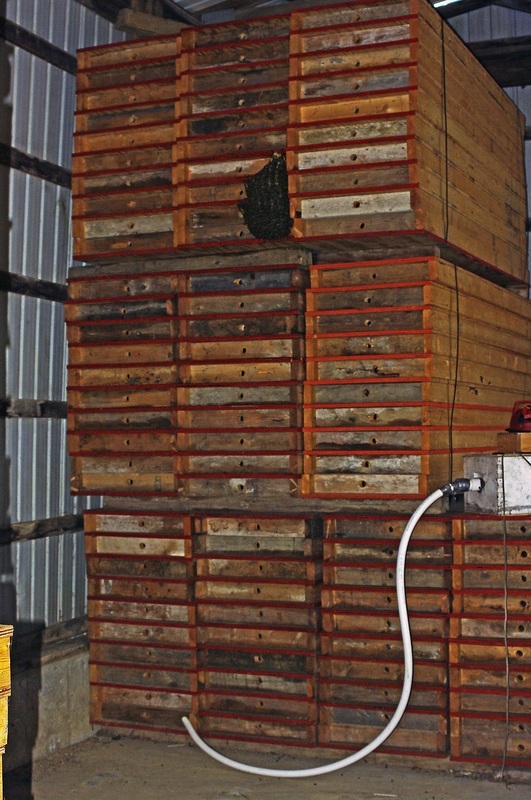 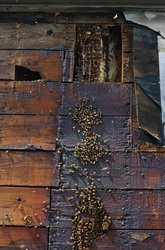 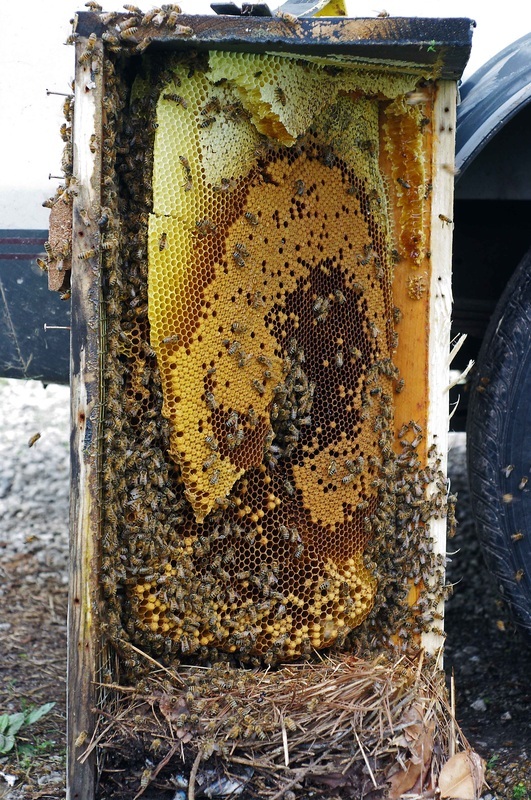 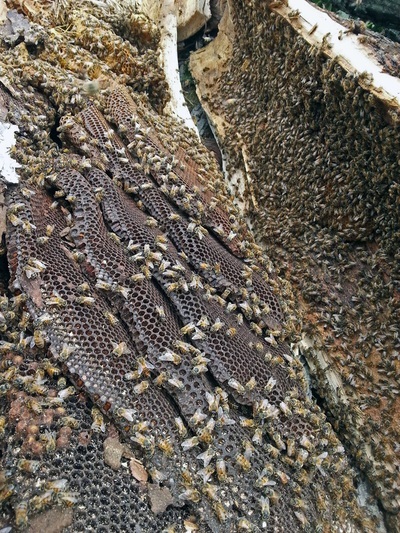 Swarms often will leave their original hive just before an approaching weather system. 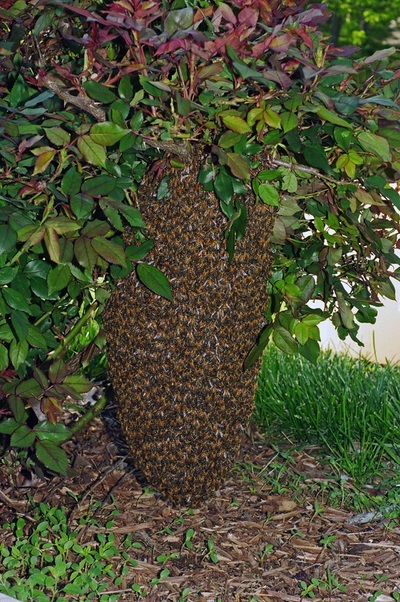 Generally a swarm is very docile. 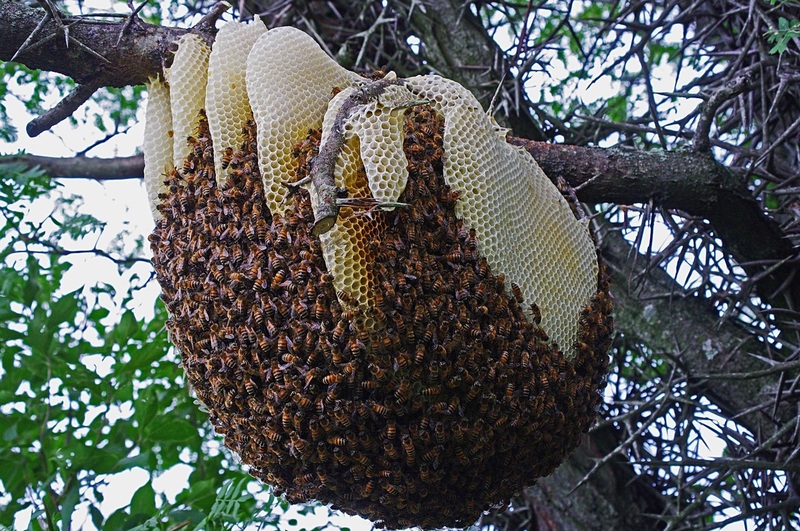 They have no hive to protect, nothing to defend, they're just waiting for directions to a new place to start over. 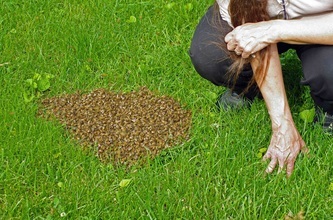 However, with bees, there are exceptions. 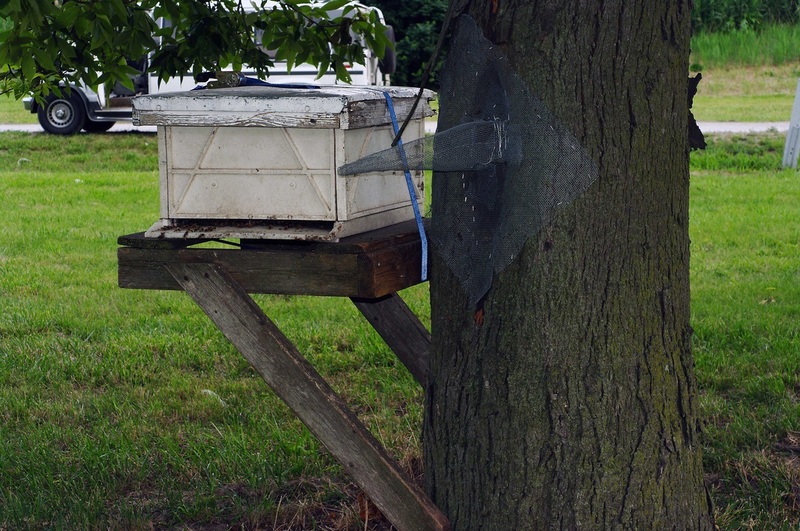 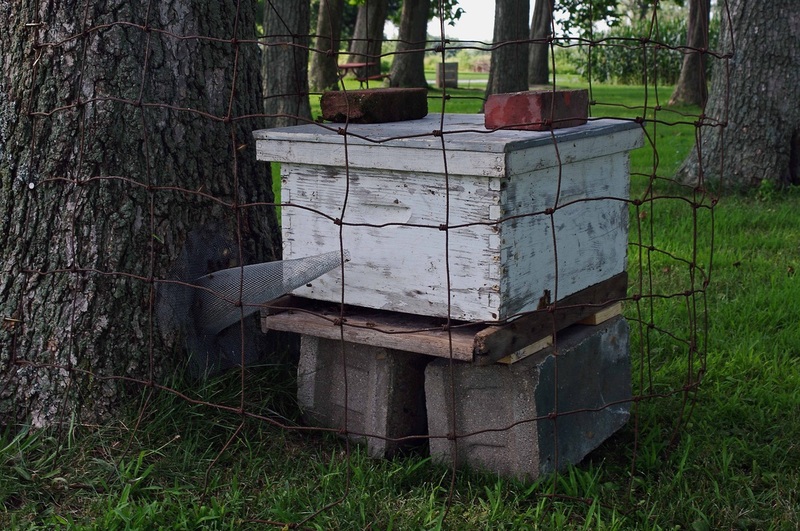 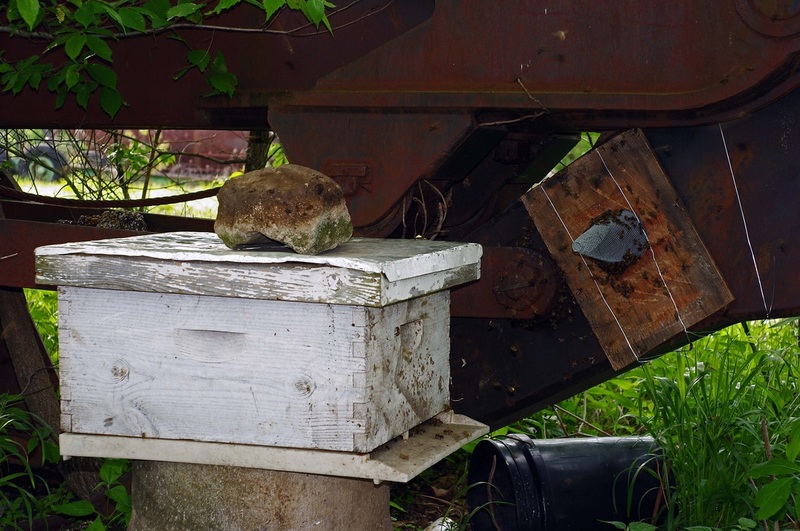 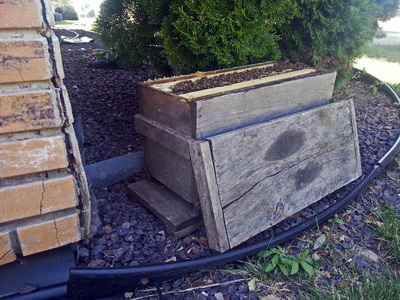 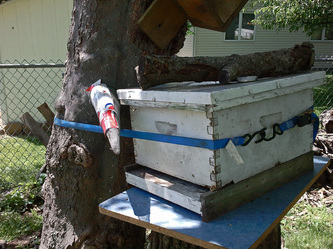 There are basically two methods used to remove established colonies-Cut Outs and Trap Outs. Cut outs are much quicker than trap outs when it comes to removing an established colony of honeybees, but not necessarily the easiest. 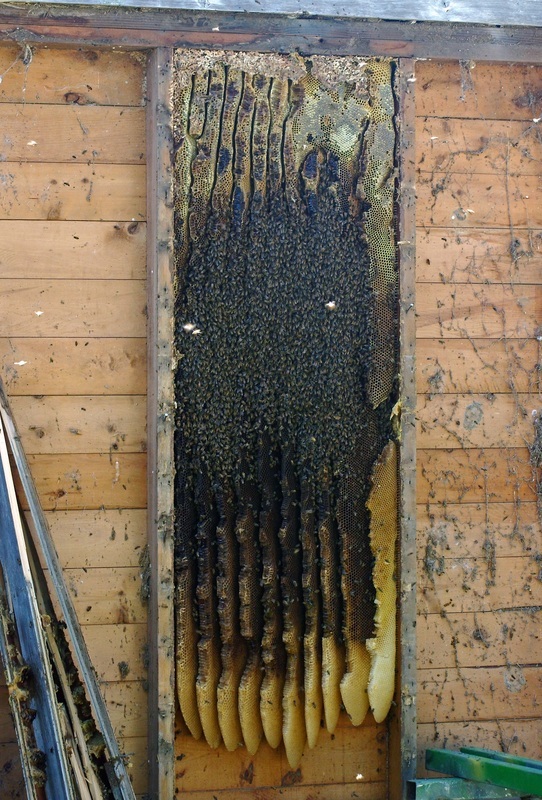 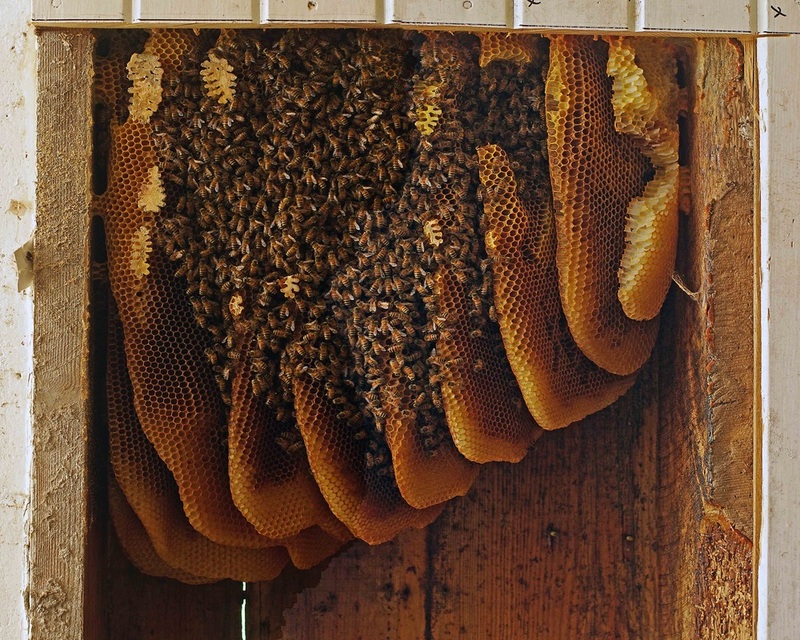 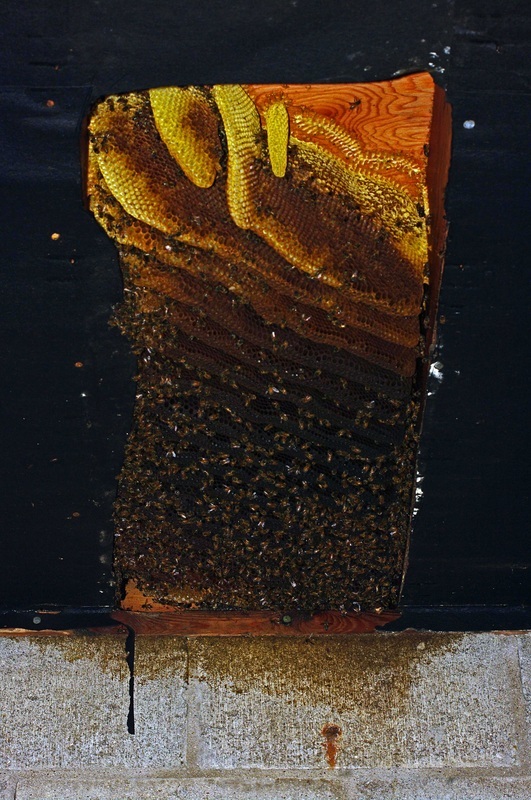 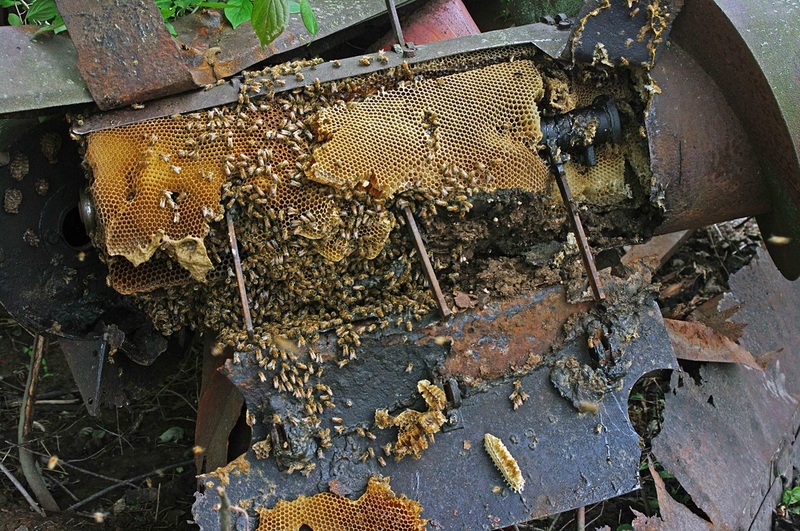 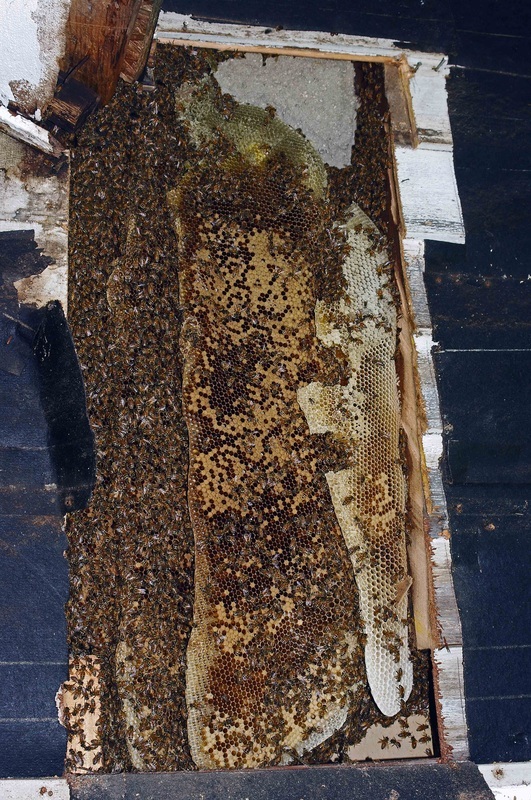 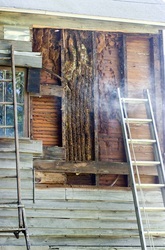 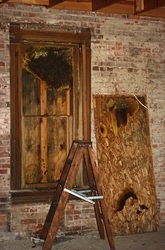 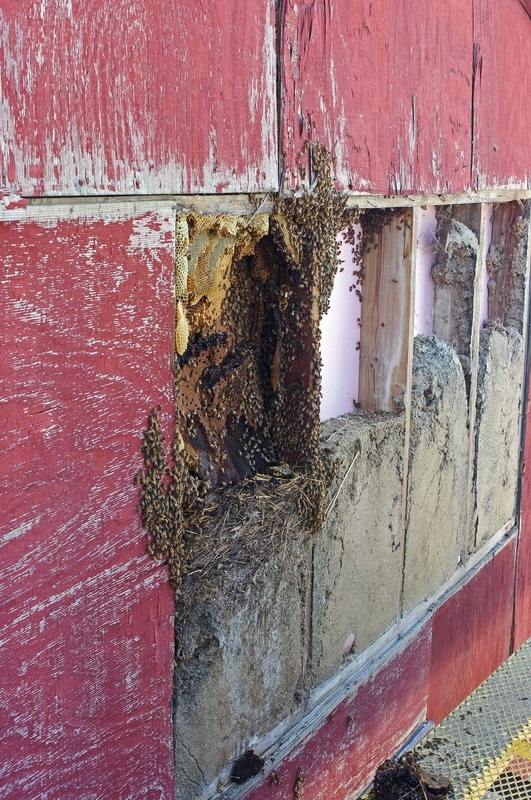 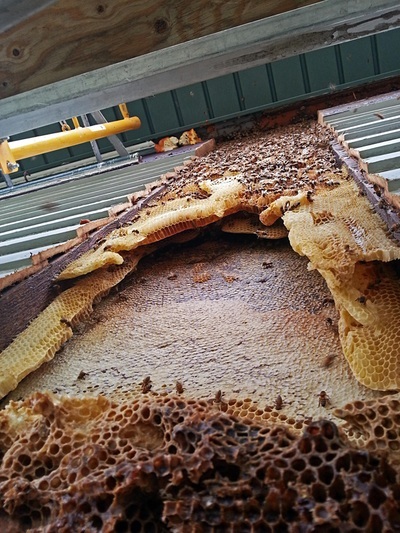 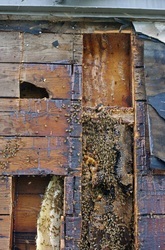 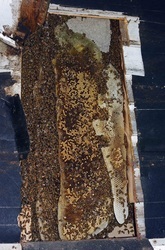 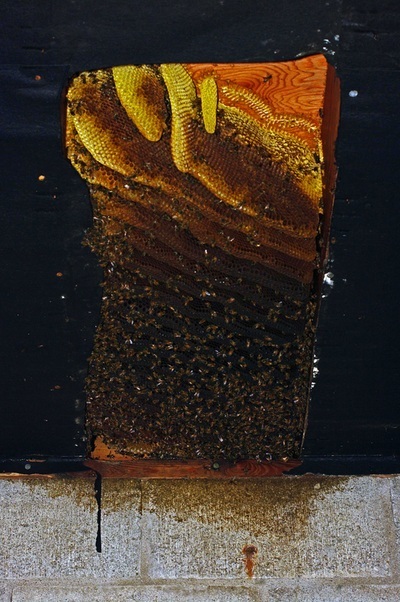 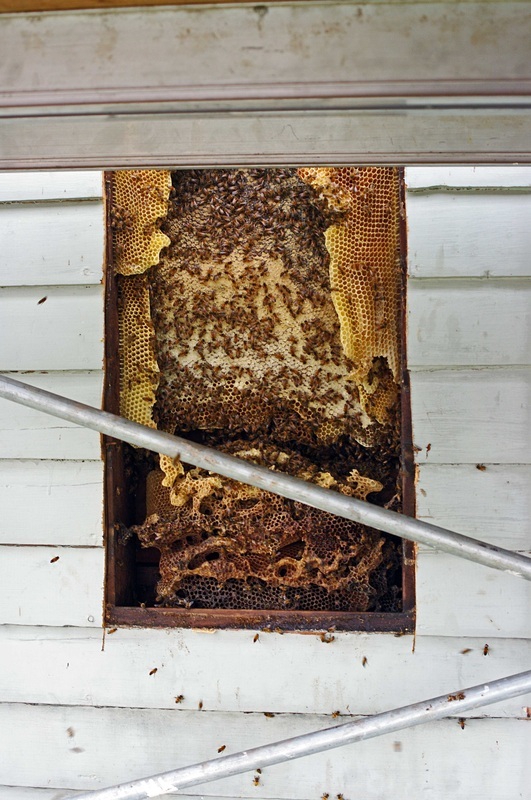 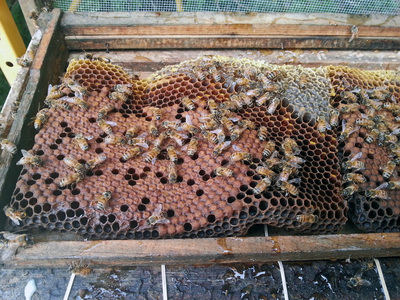 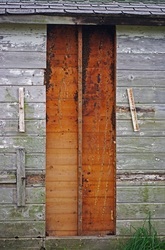 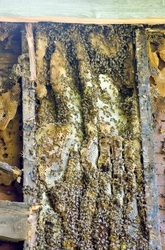 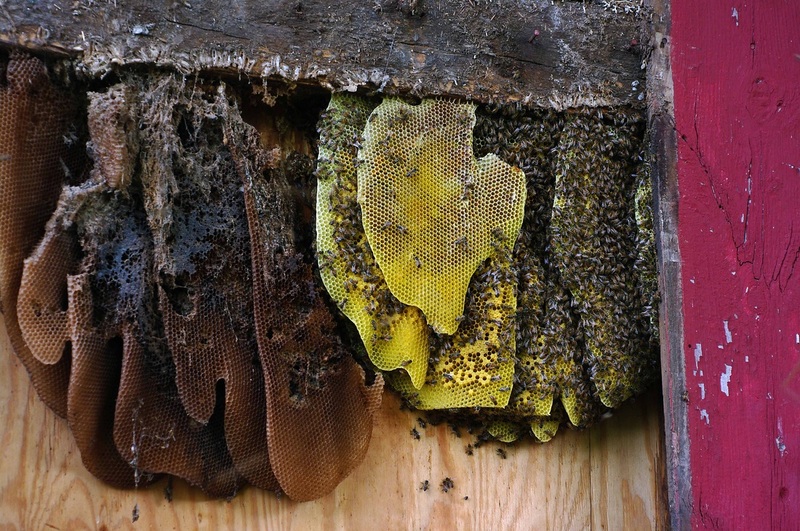 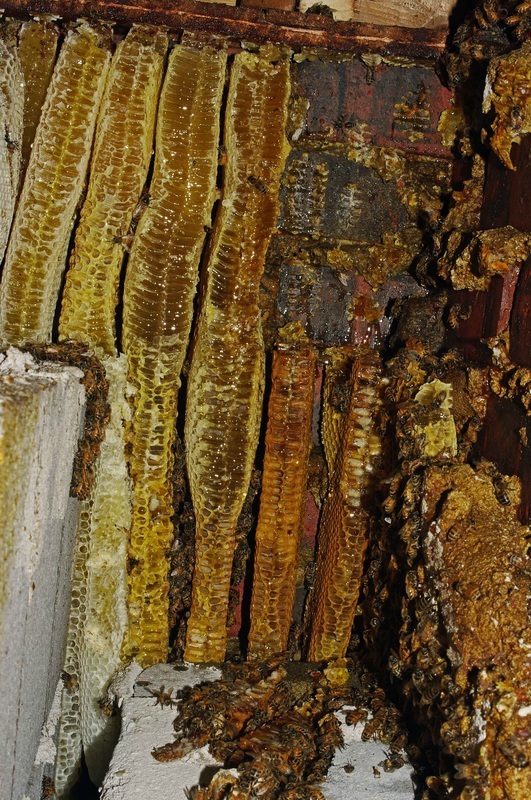 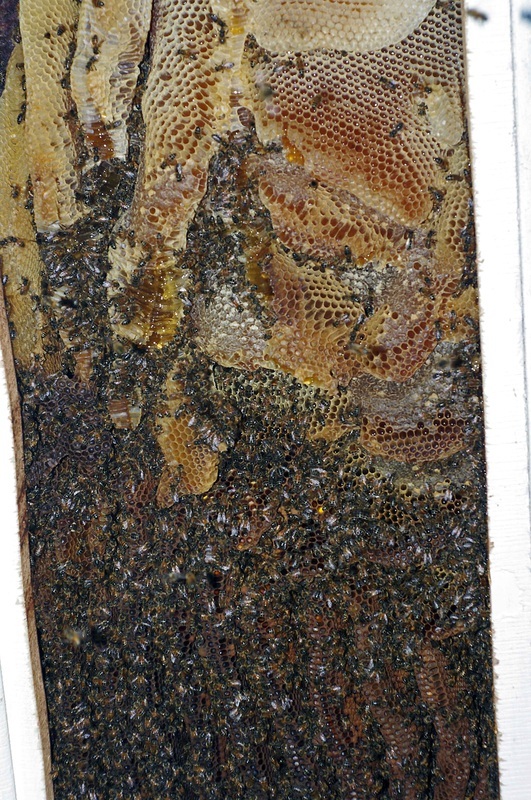 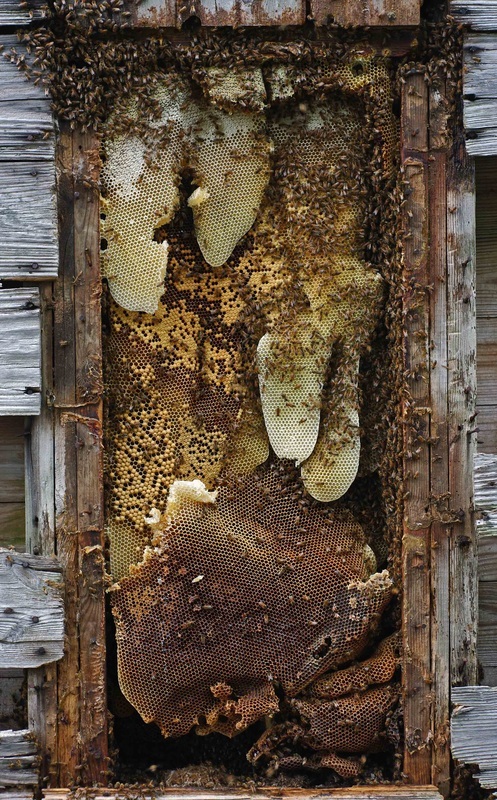 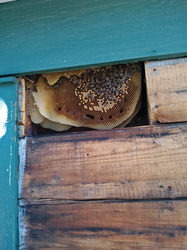 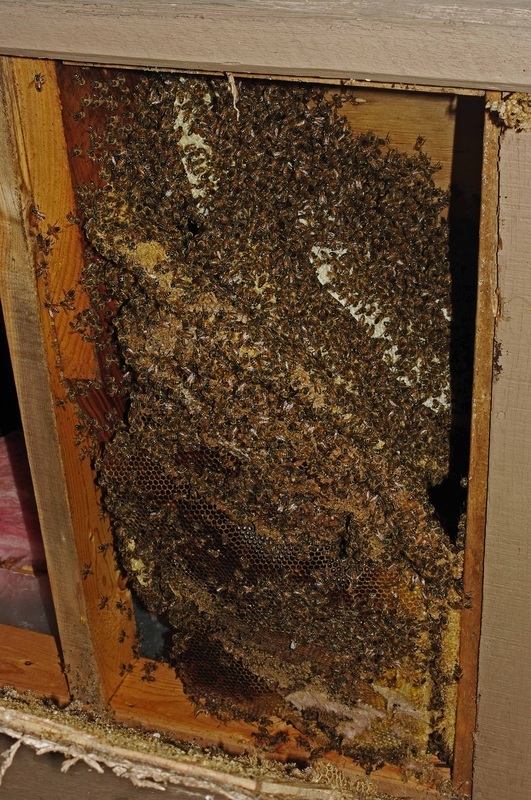 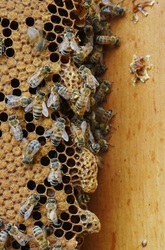 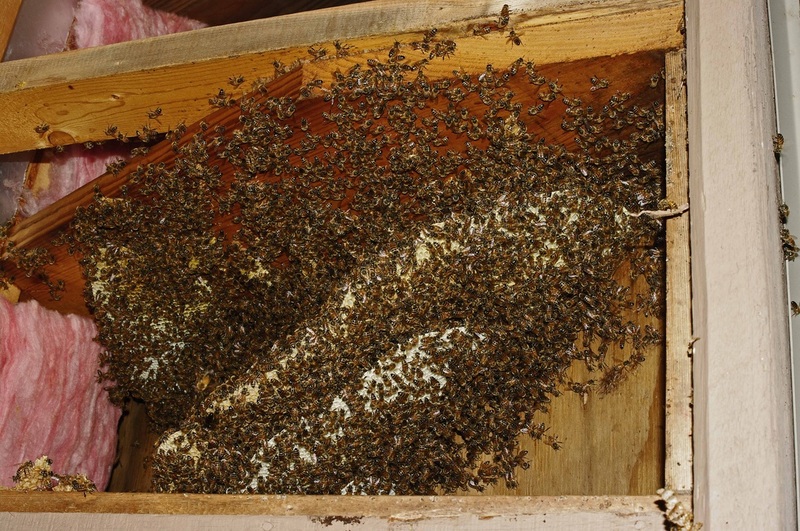 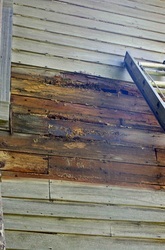 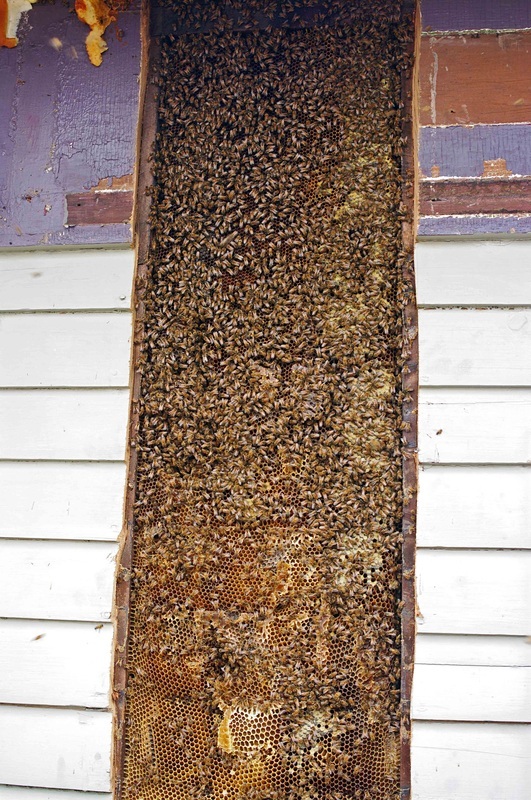 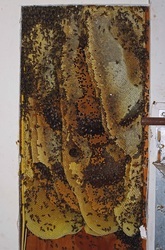 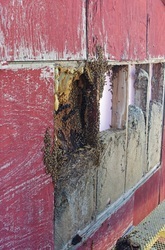 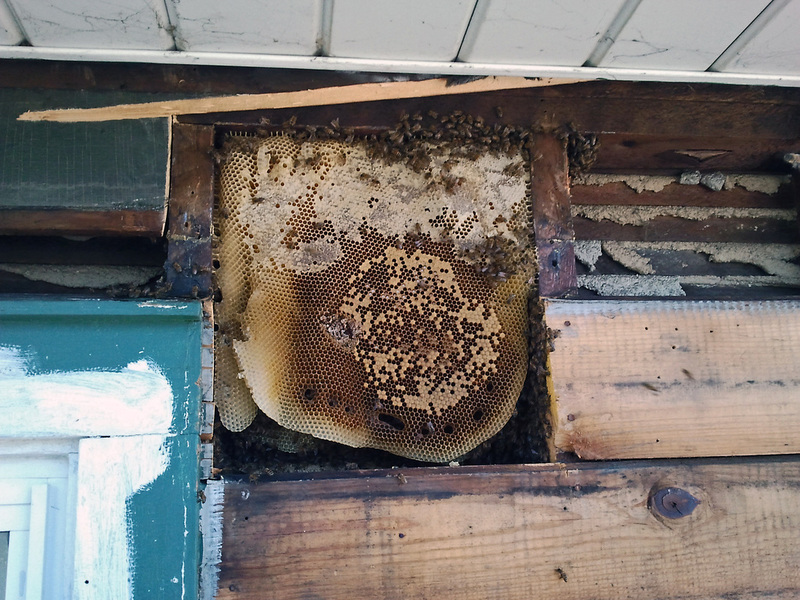 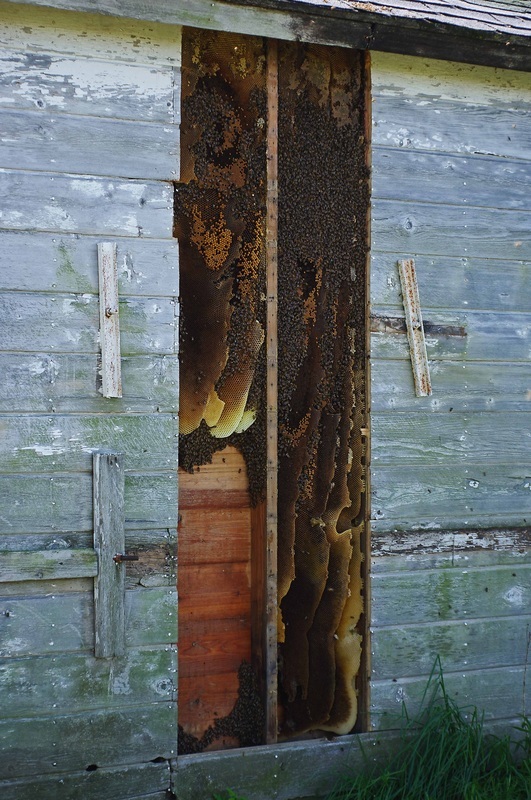 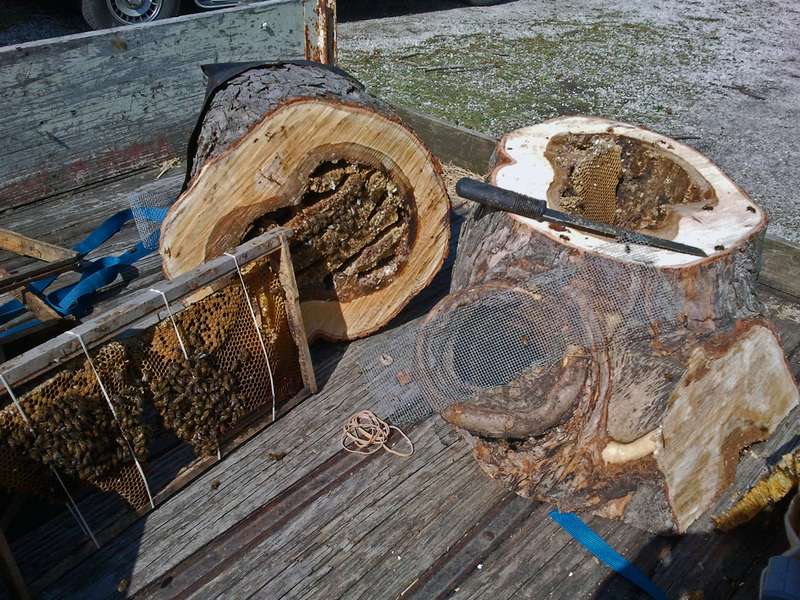 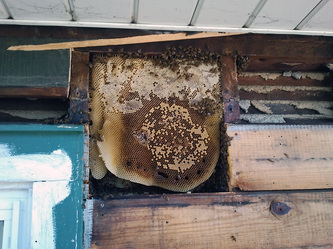 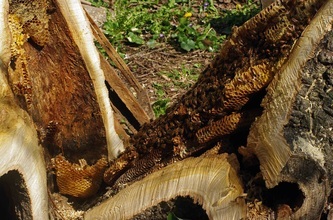 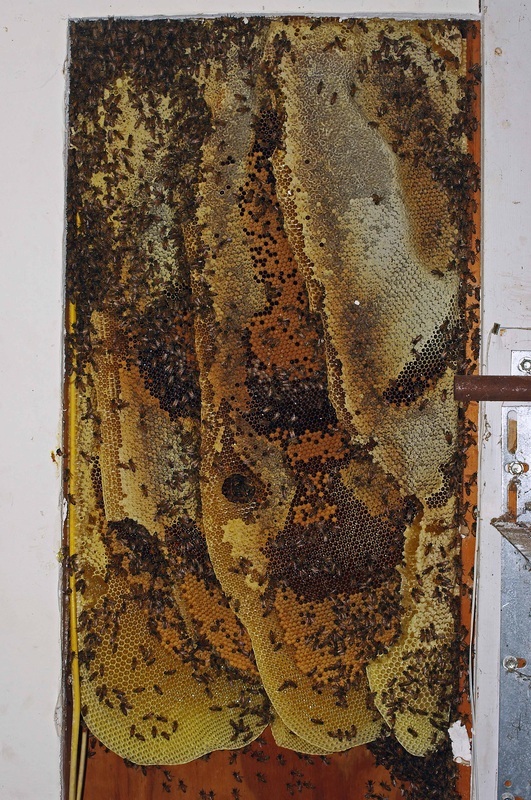 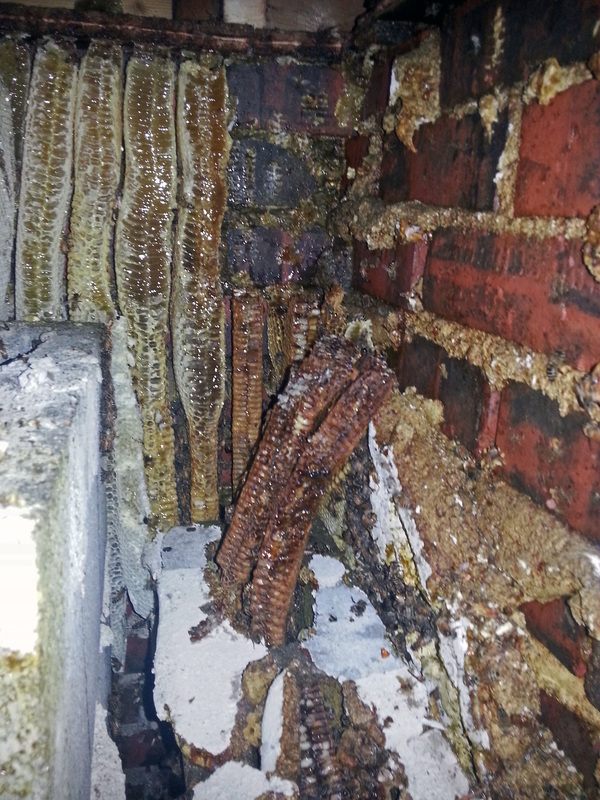 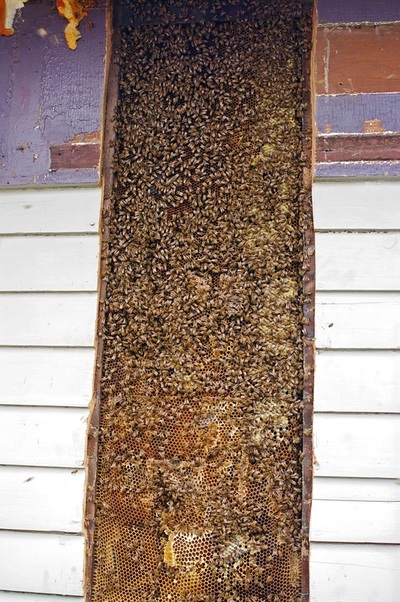 On the plus side the bees are removed with their comb, containing their food stores, eggs, and brood. 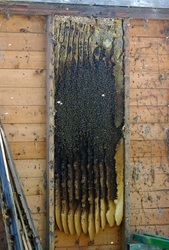 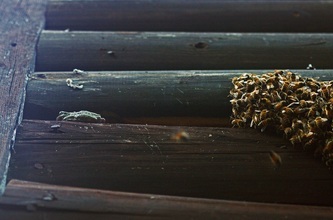 It is a matter of rearranging and relocating the hive. 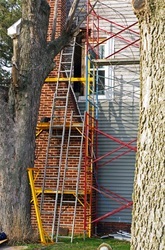 But, there is a downside to cut outs. 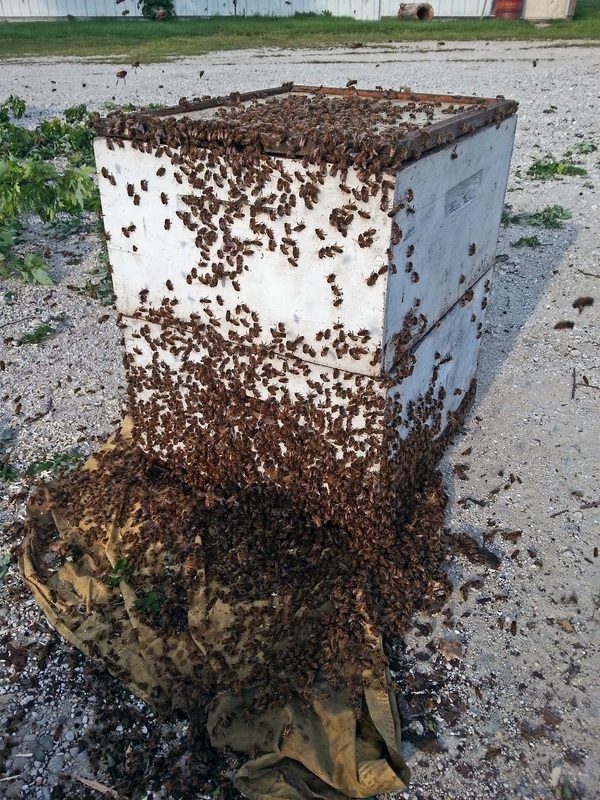 It's hard work (often not in the most accessible location to say the least), it can be really (and I mean really) messy and sticky (especially later in the season when the colony has had an opportunity to put up a lot of honey), you sometimes end up with a sizable amount of really angry bees (even though you are at work trying to save them, they just don't understand), and some of the bees in the hive will be killed. 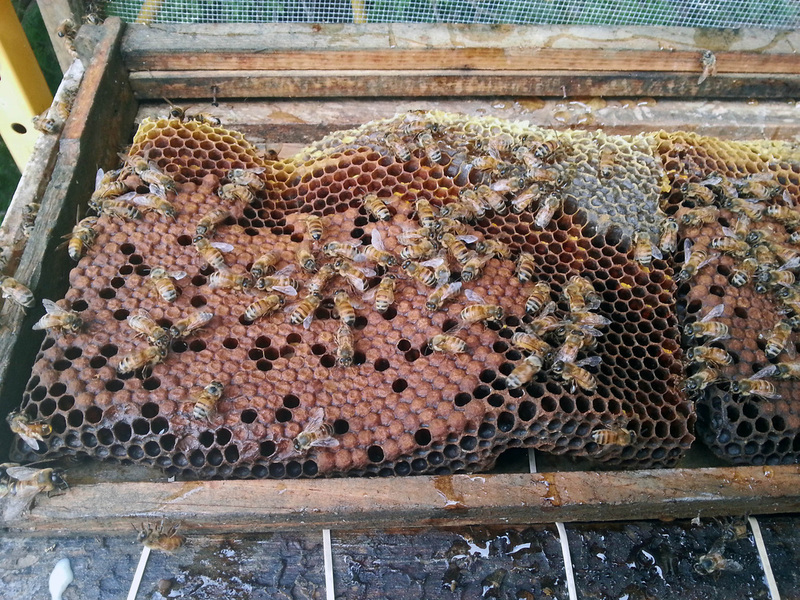 On rare occasions the queen doesn't survive. 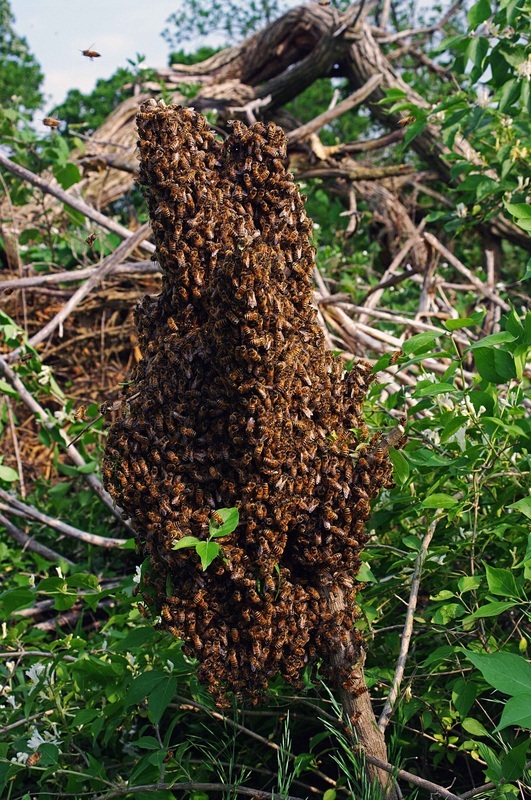 Certainly not the best thing for the colony, but it beats the entire colony being killed and destroyed. 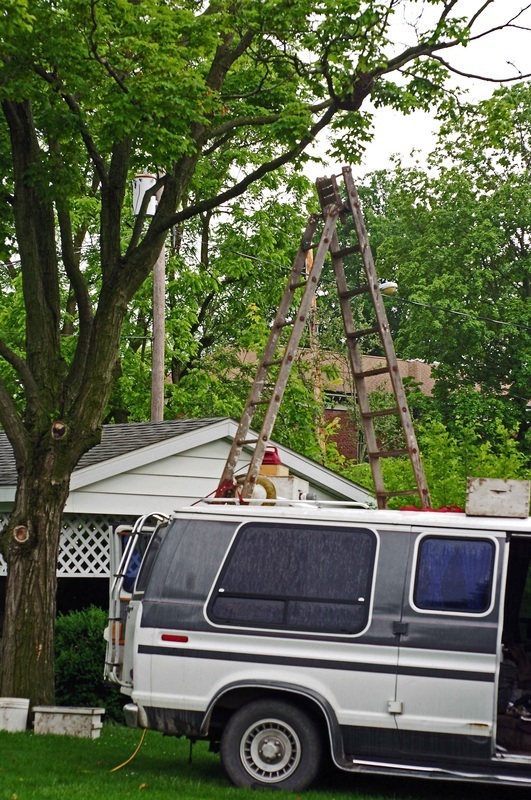 Some go much smoother than others, mostly depending on the location. There are too many variables to be able to predict exactly how they'll react. 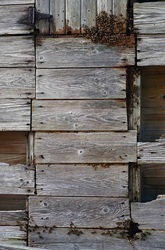 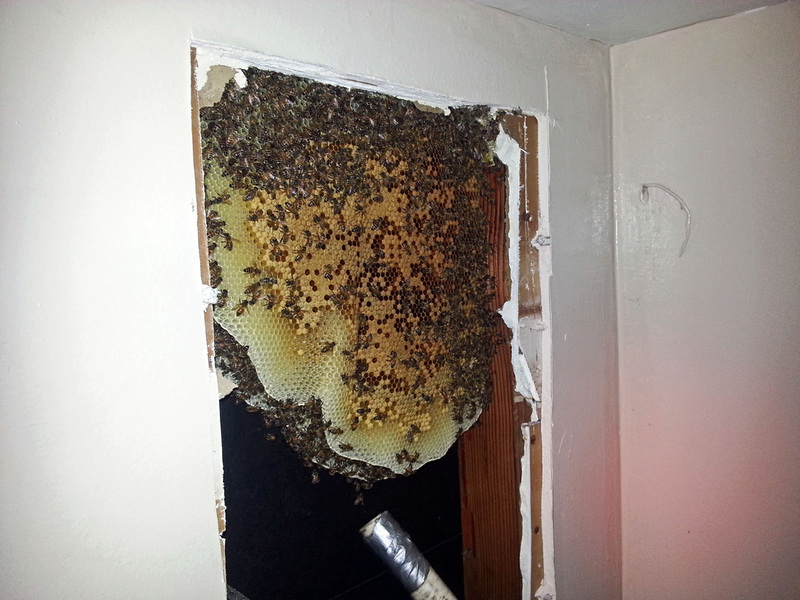 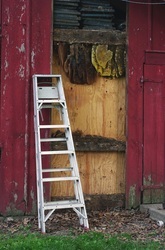 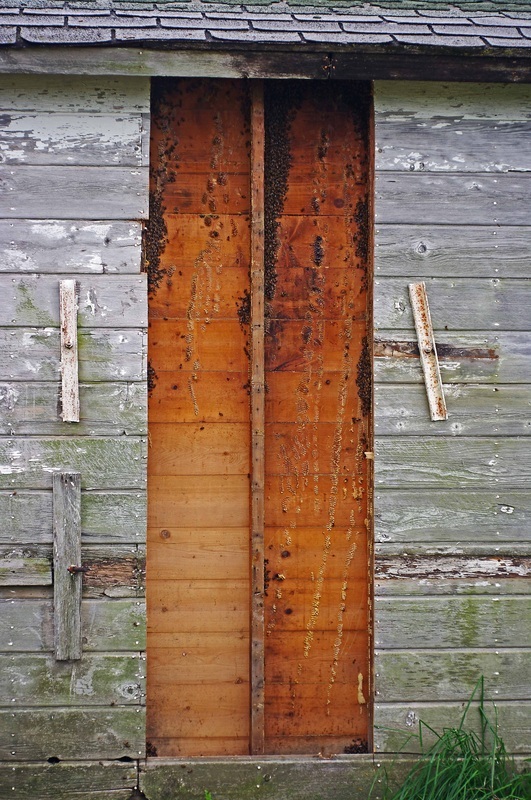 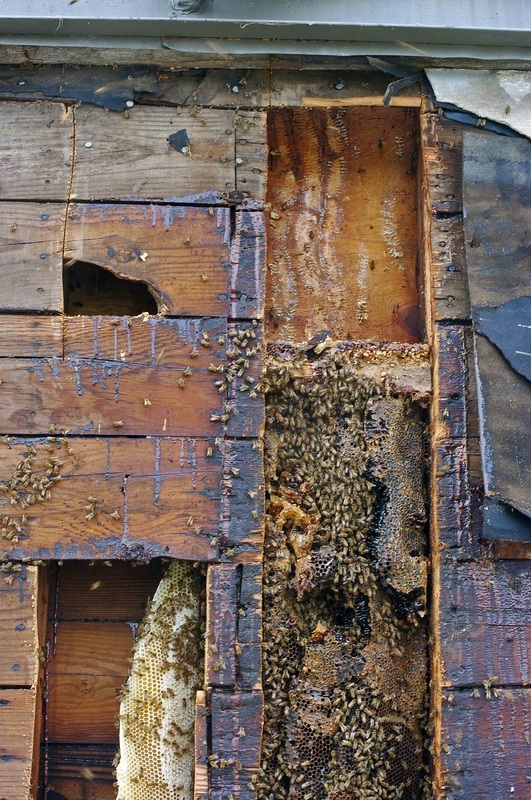 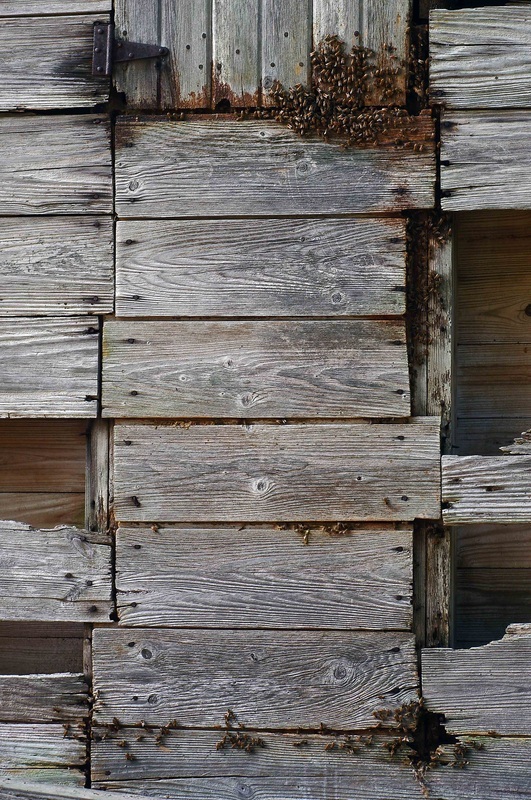 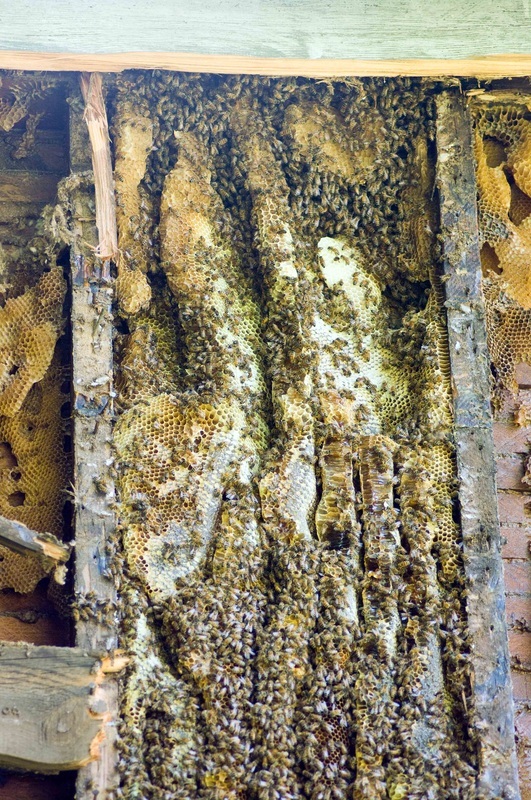 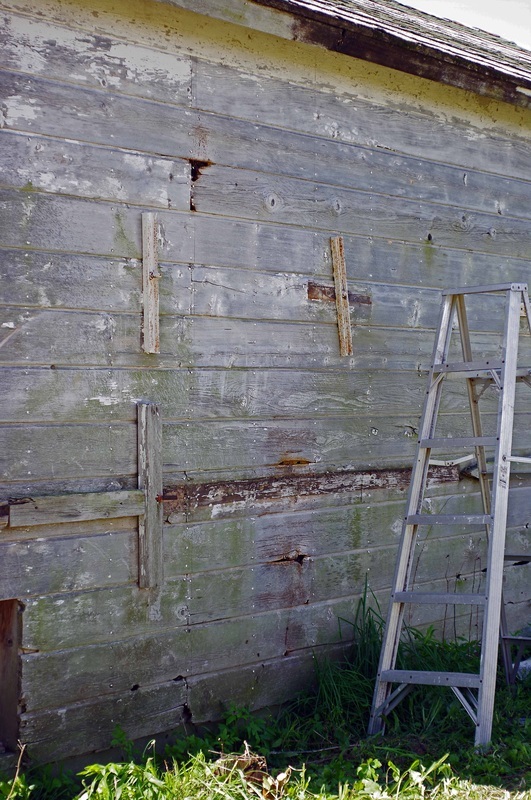 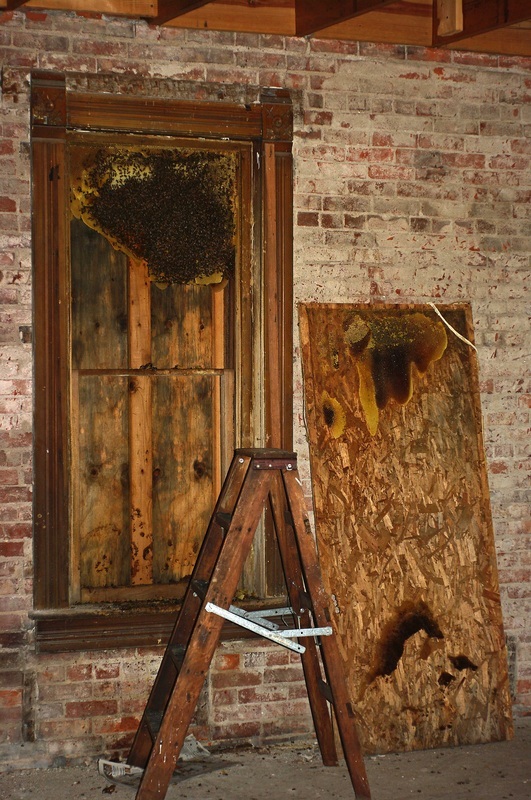 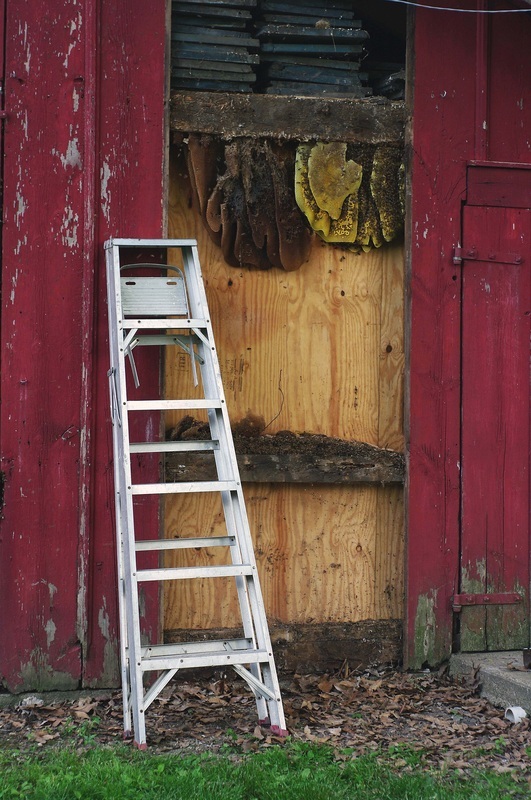 In my experience bees in walls get much more upset by the time you use a saws-all, crowbar, and hammer to get into them than bees in a tree being cut out with a chainsaw. 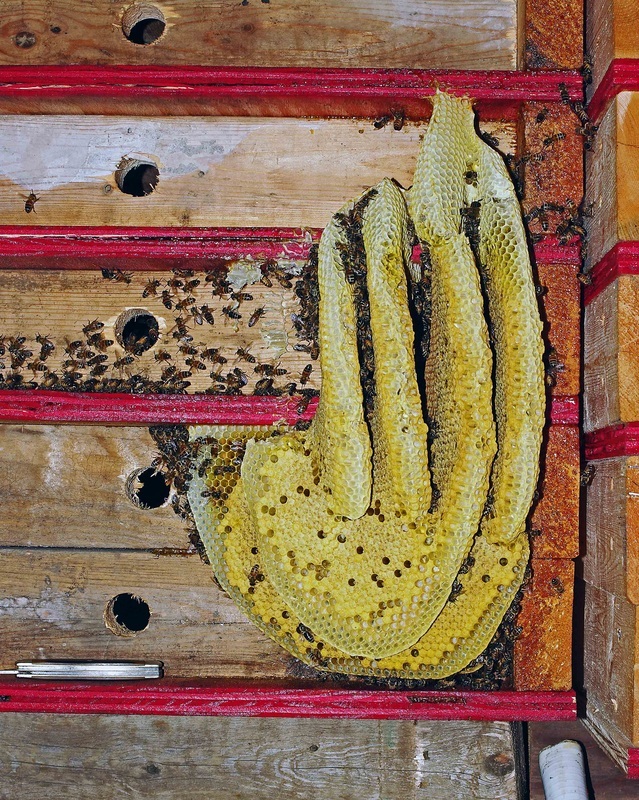 I've taken some out of walls, from between floors, or in ceilings where a veil and a heavy long sleeve shirt are barely enough, and I have to tape my hands with just my fingers exposed (I don't like to wear gloves, I have my reasons) to help limit the amount of stings to my hands. 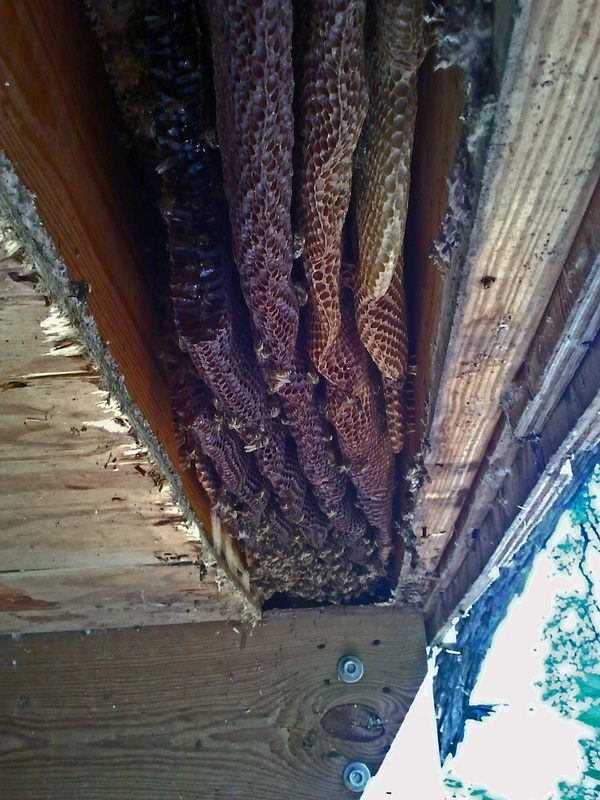 The worst I've been stung up to this point has been removing a colony from a ceiling. After cutting through dry wall, plaster, and lathes, removing comb and vacuuming bees for a several hours I was stung at least 70 times. 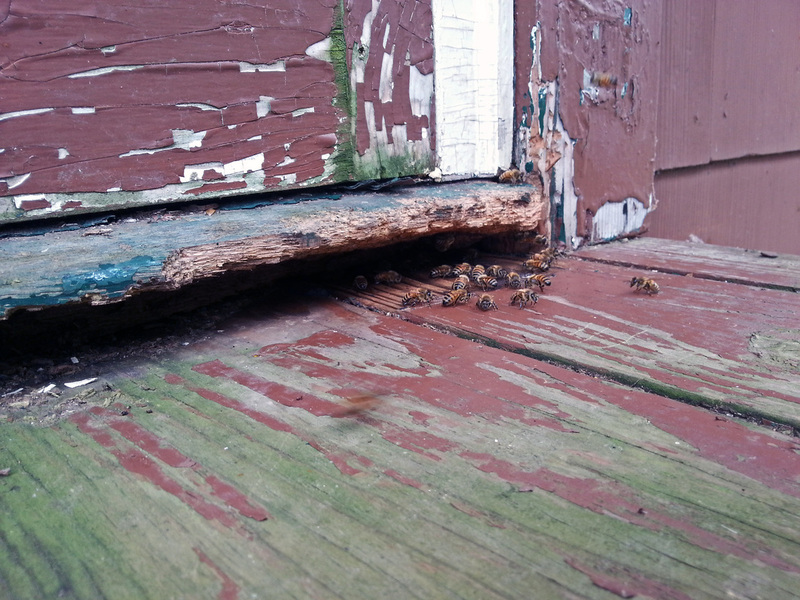 Those little gals were upset! 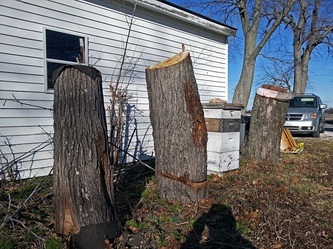 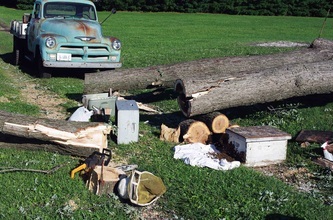 But, I've cut a tree down, cut the stump up into chunks with a chainsaw, and removed the colony while wearing a T-shirt. 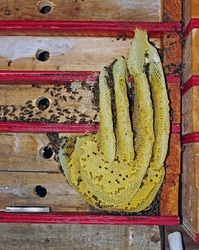 The only time getting stung then was when I would happen to pinch one with my fingers when handling the comb. 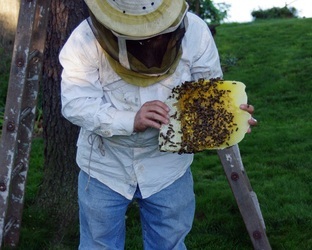 Either way, cut outs are the best initiation into being around and handling honeybees. 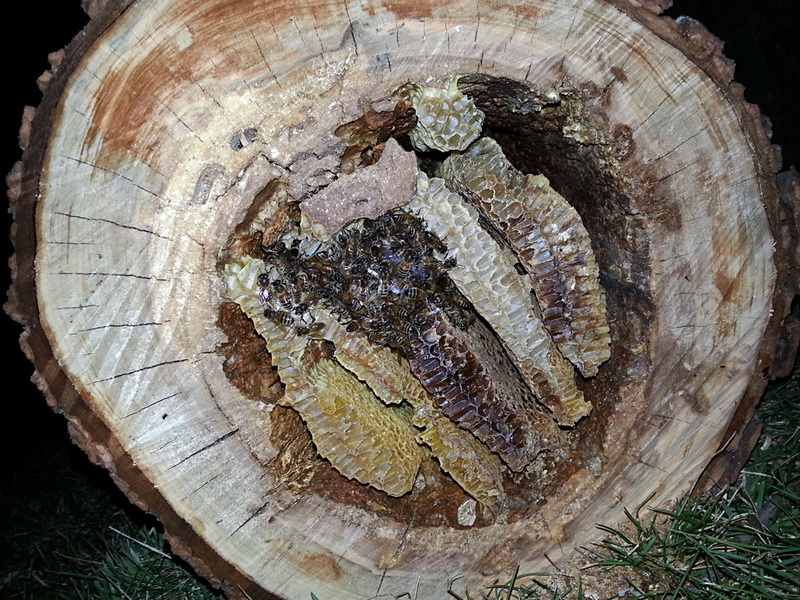 First part of a 2 part video of a new colony that I was called to cut out of a fallen tree. 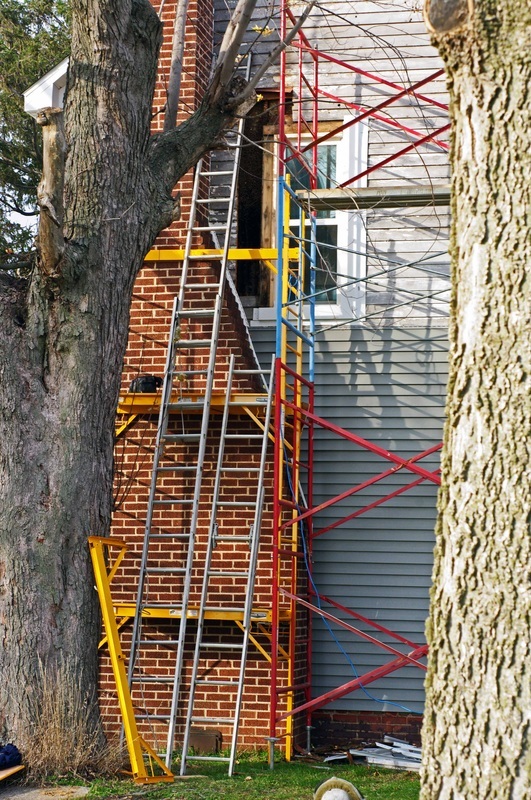 Sorry, but too much going on not to have to make it in 2 parts. 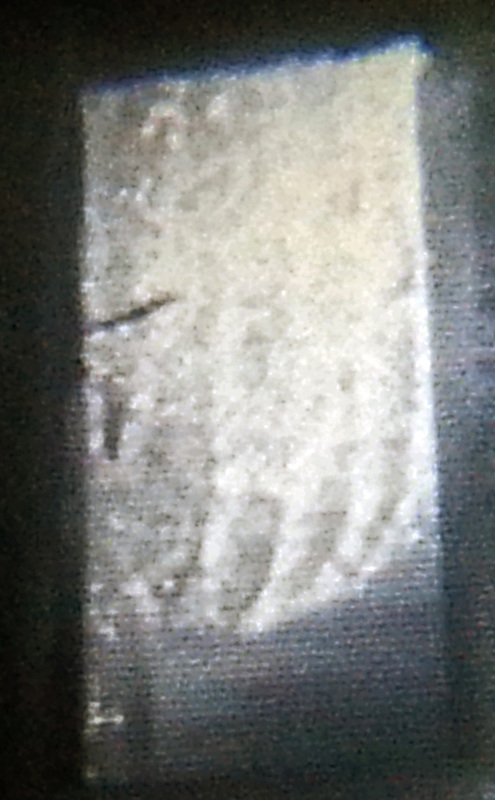 Most of the video is explained in the narration. 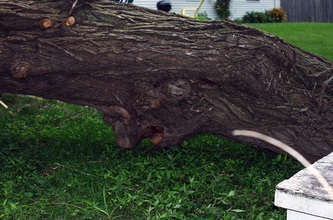 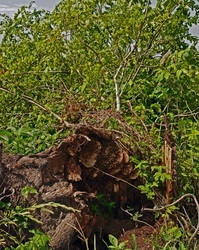 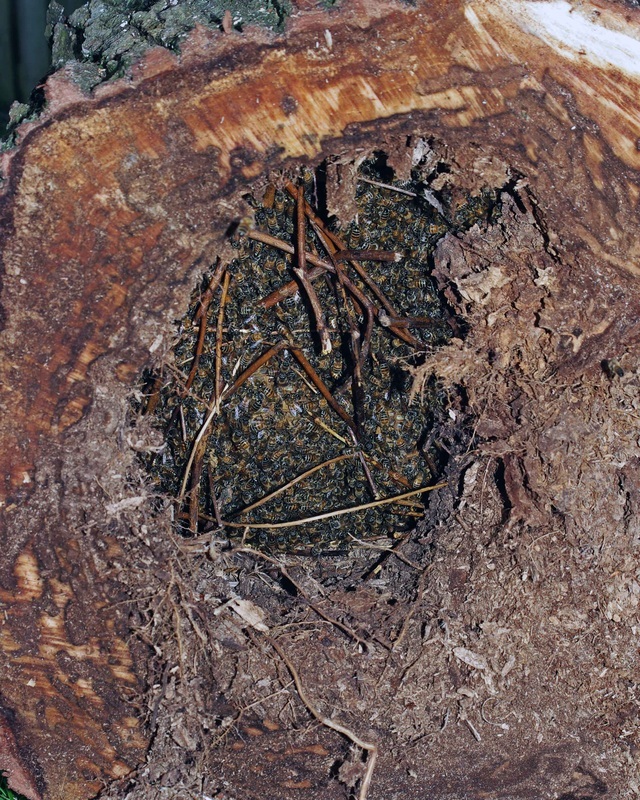 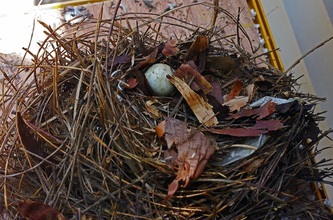 Second part of a video showing removal of a colony from a fallen tree. 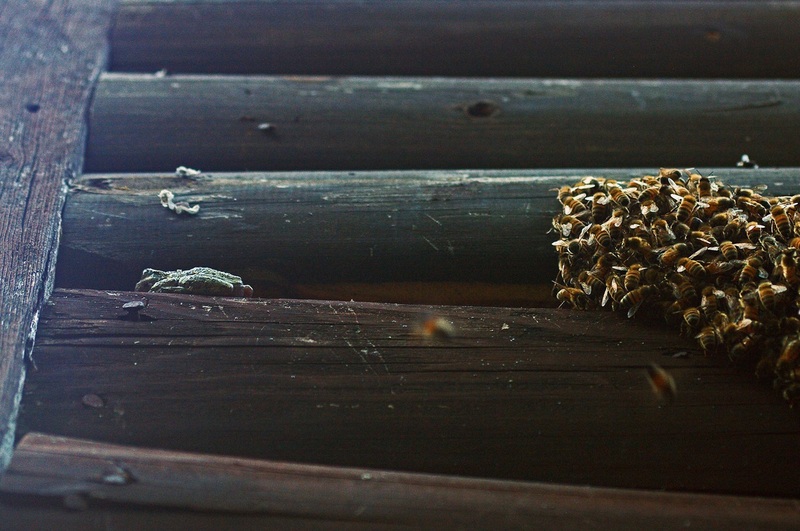 Had lots of minutes of just bees crawling, so edited out quite a bit for posting. At the end the bees standing with their butts in the air are exposing the nasanov gland, a scent gland, and fanning this pheromone out to the other bees still flying around just to let them know where home is now. 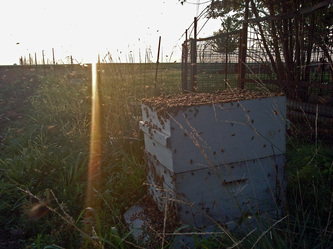 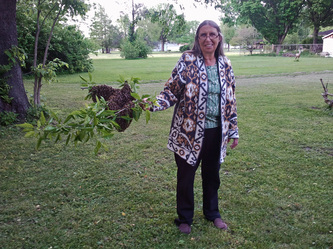 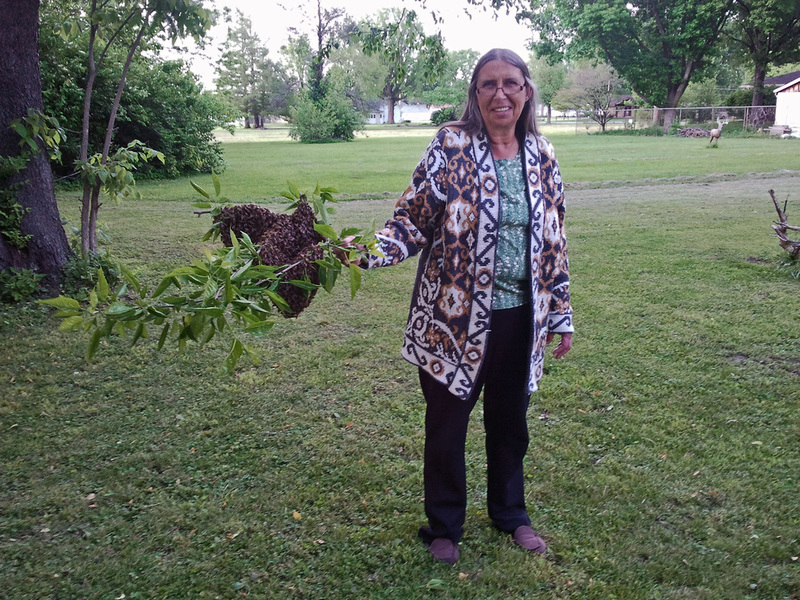 Went back that evening about dark, closed the hive up with all the bees inside, and took them home. 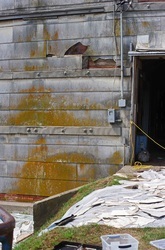 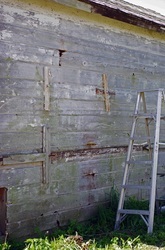 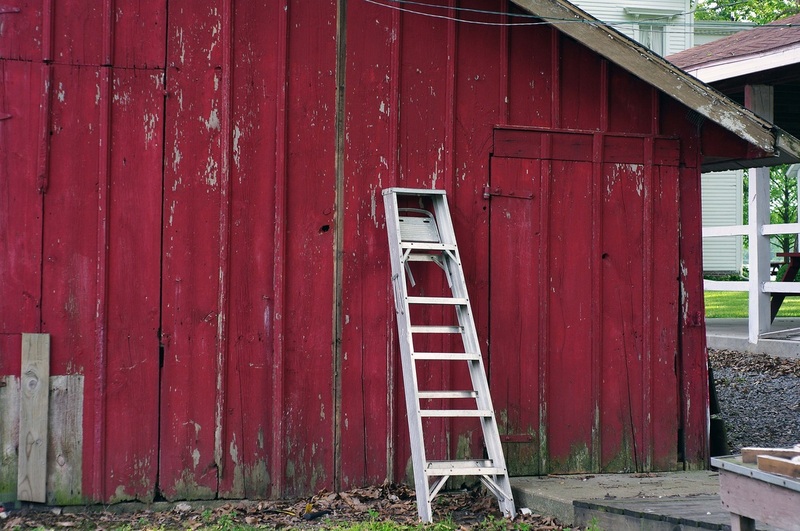 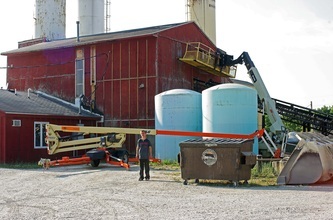 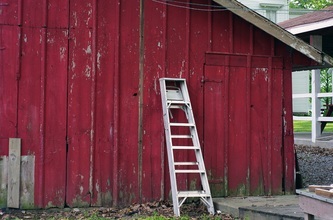 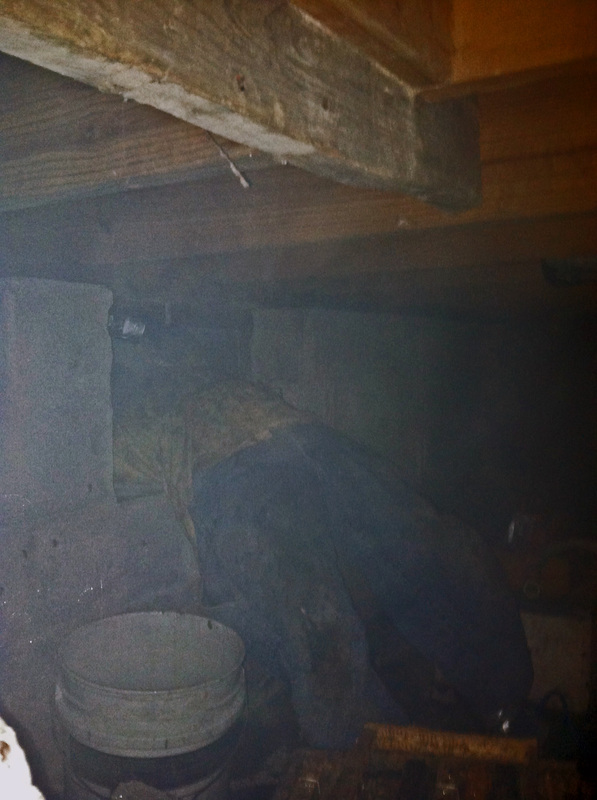 Spur of the moment shot of a cutout I was doing in an old corn crib. 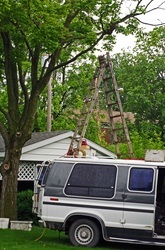 Hadn't planned on taking any video because of rain, but had to stop to get repairs for generator. 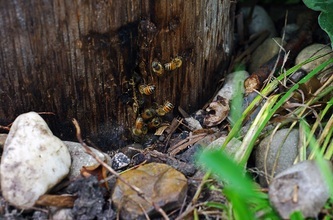 While they were gone I got out the camera and shot a little bit between showers. 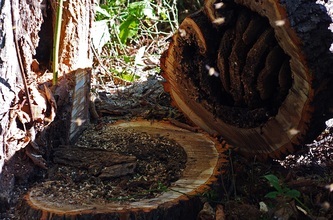 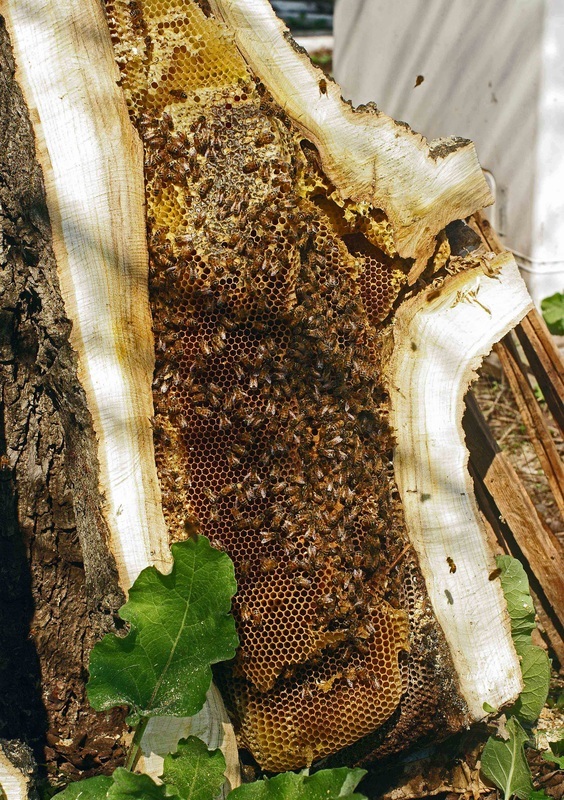 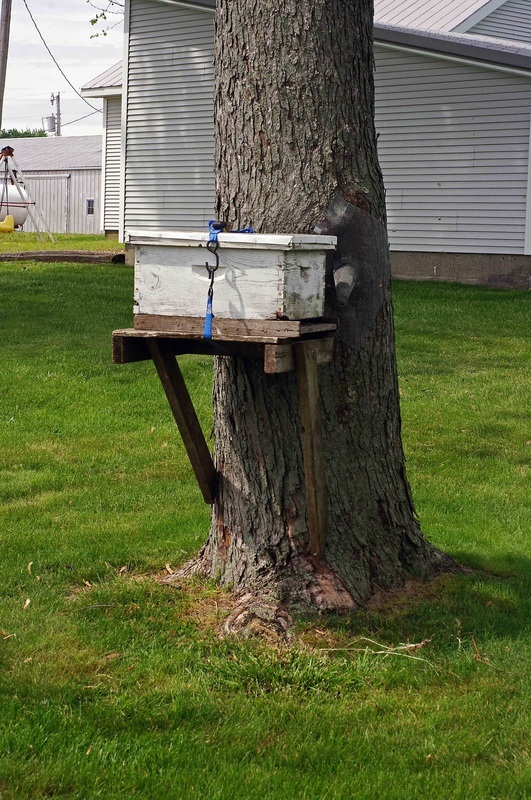 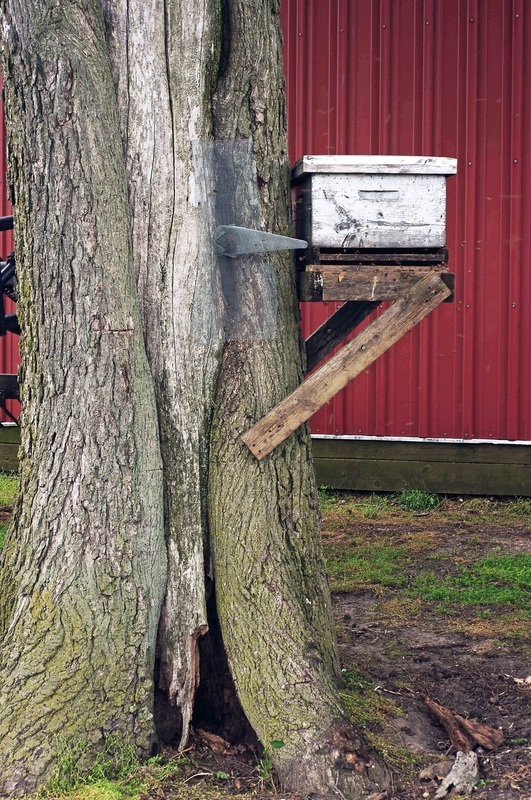 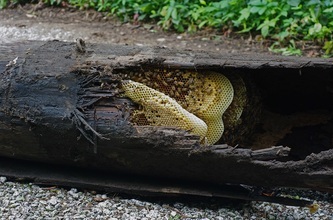 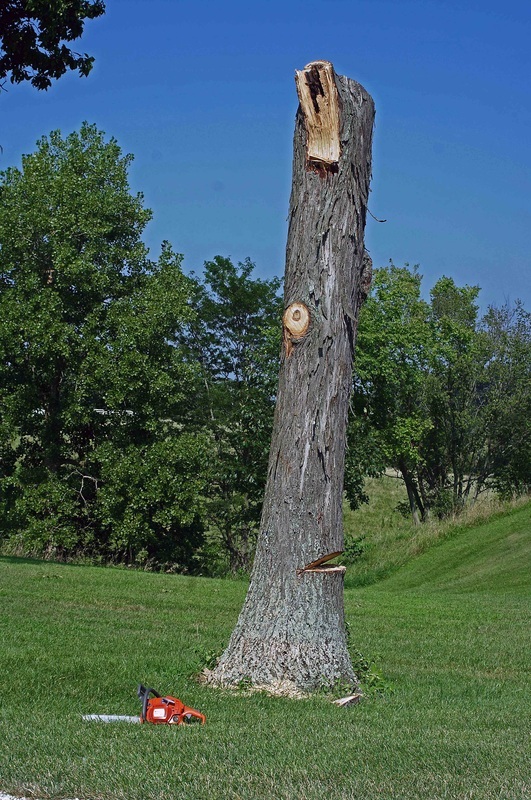 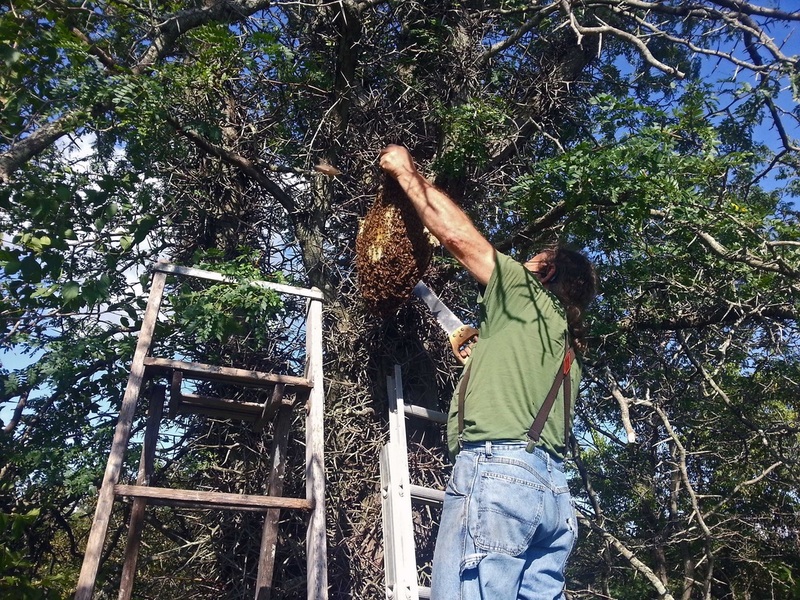 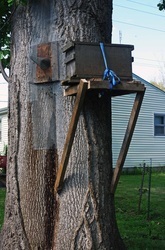 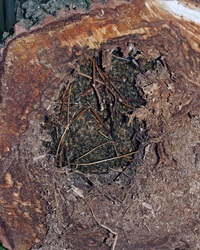 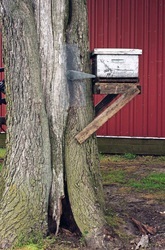 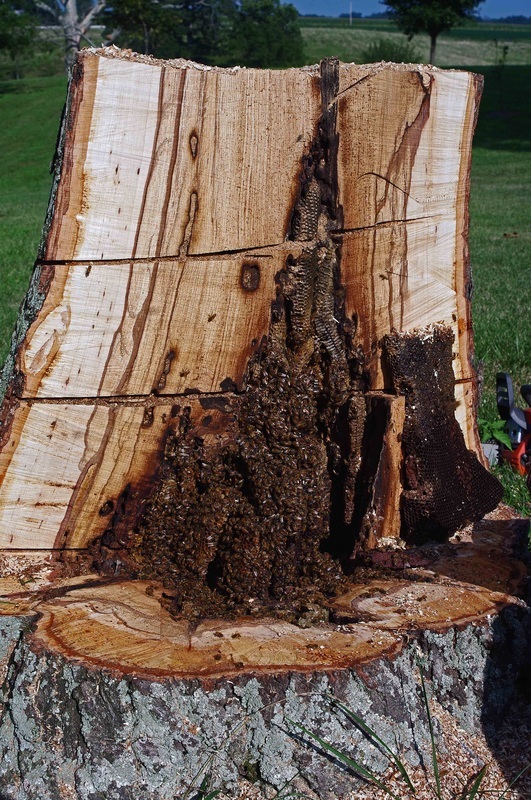 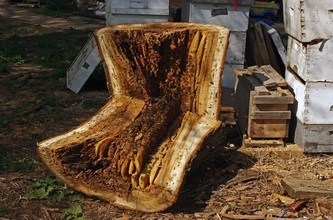 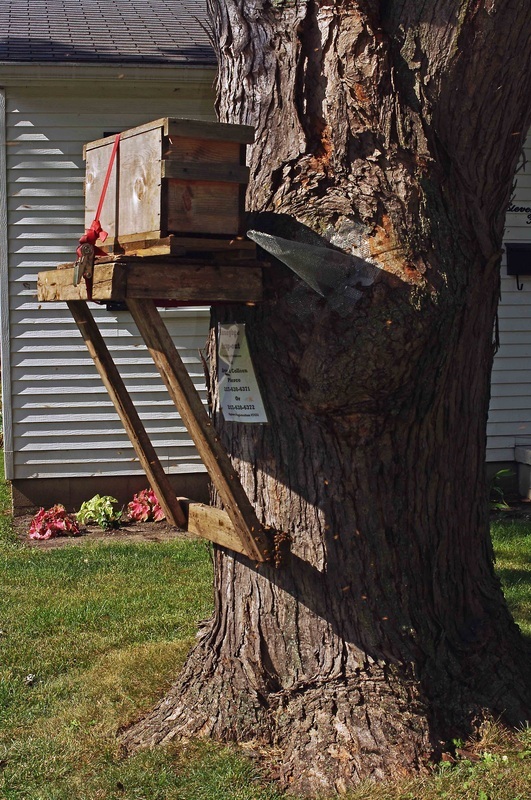 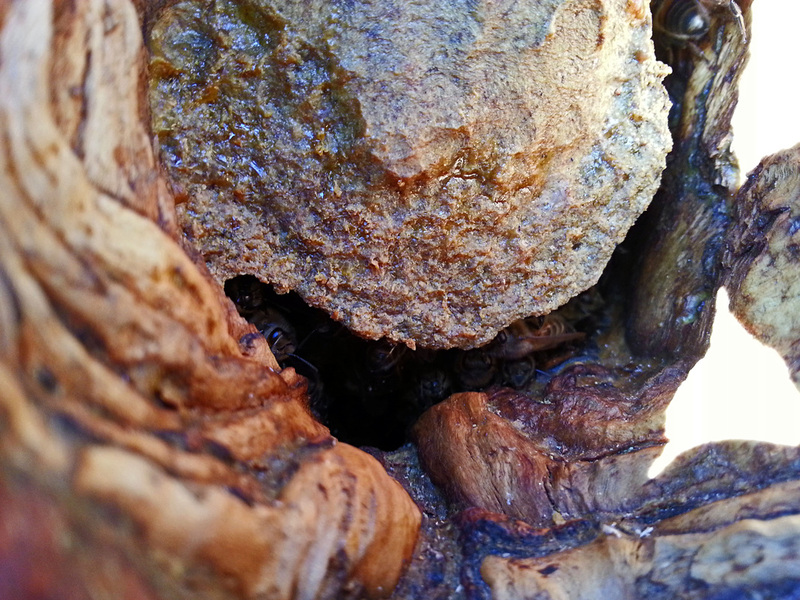 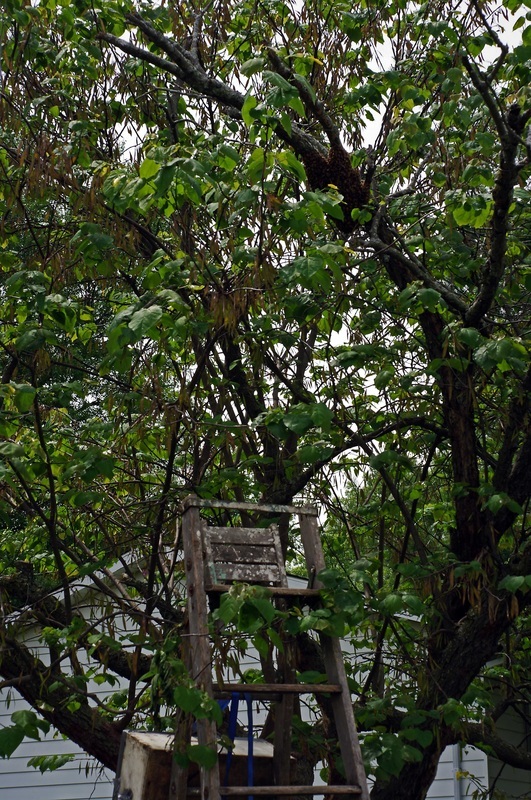 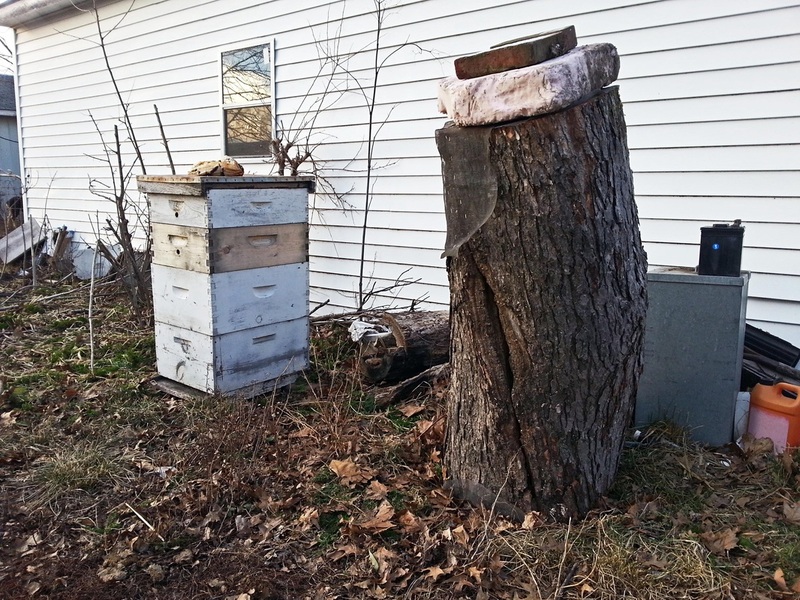 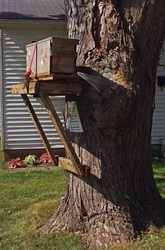 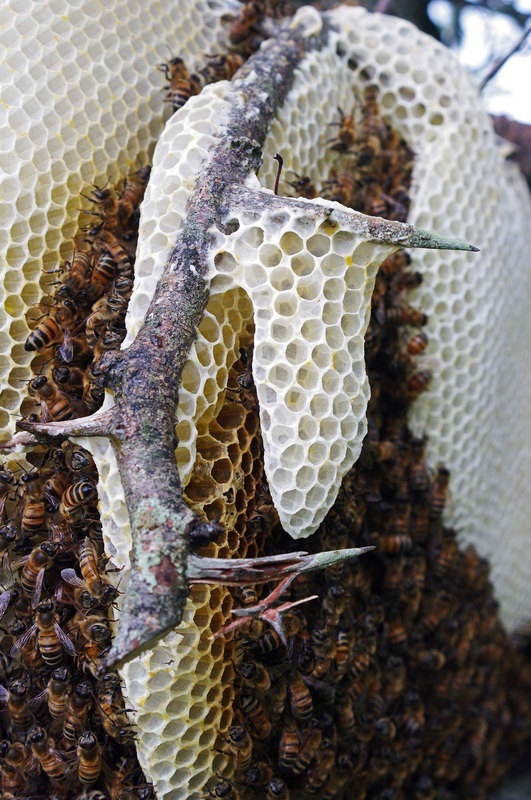 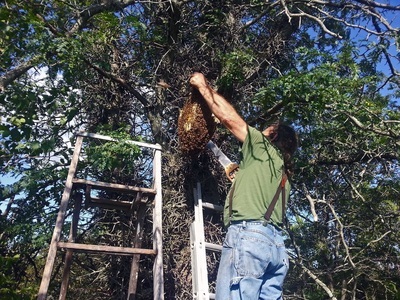 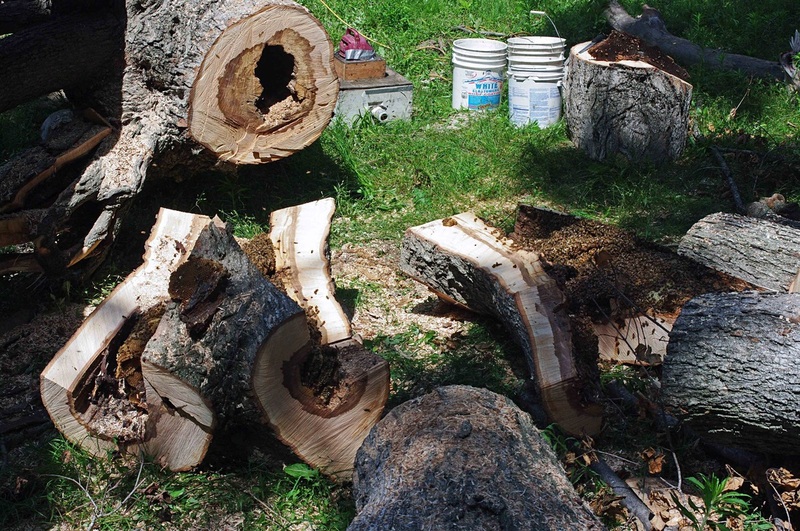 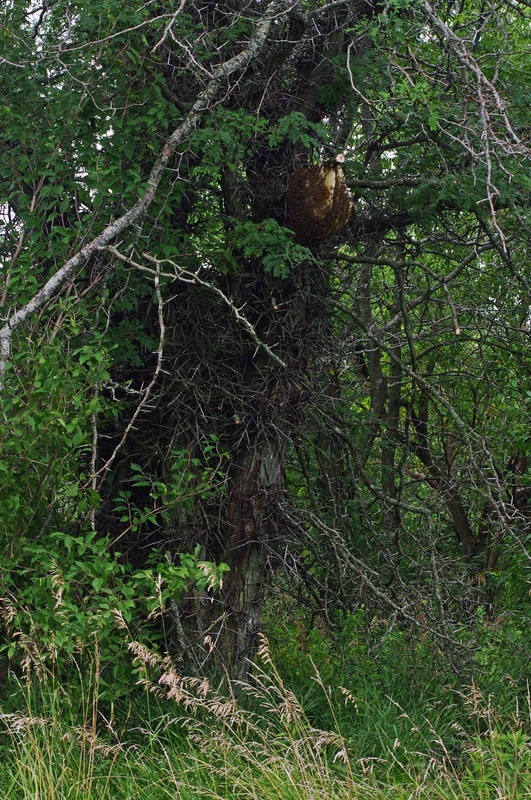 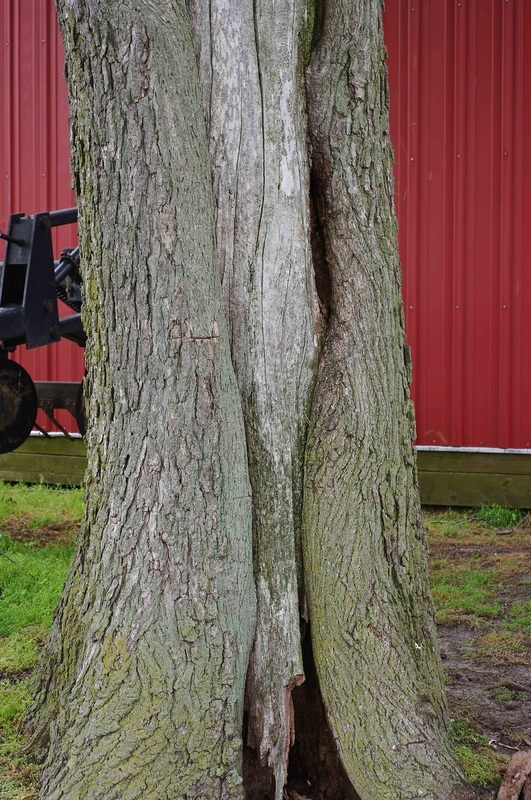 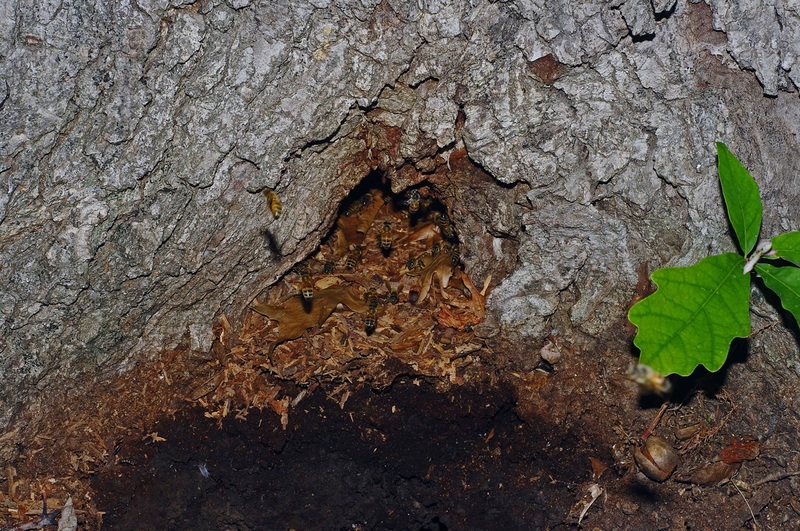 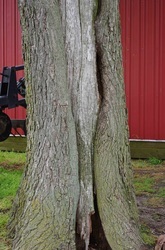 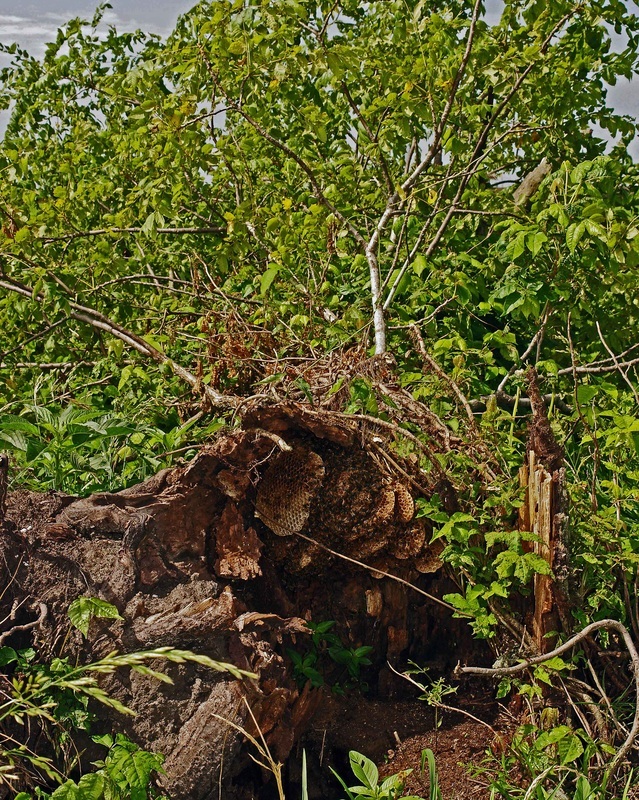 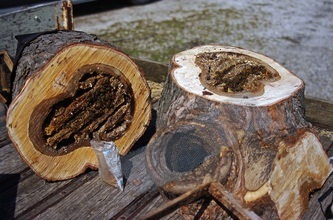 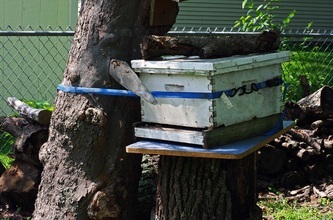 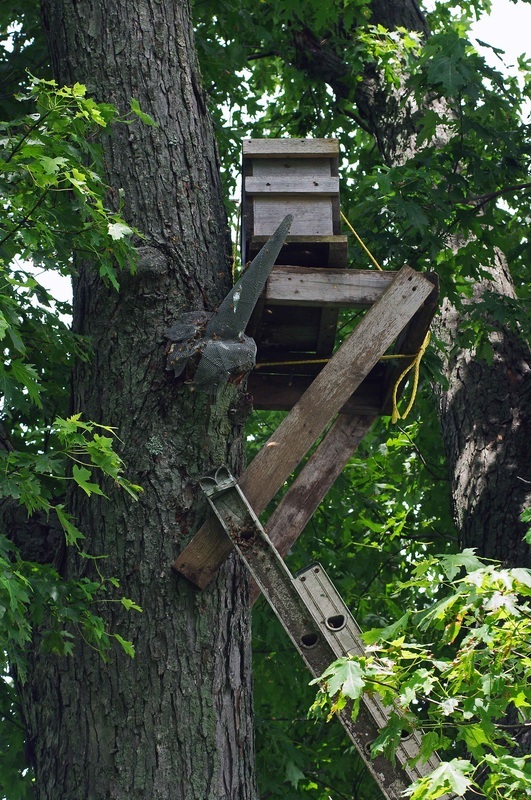 If a colony needs to be removed and has established itself in a spot where the hive itself cannot be accessed, such as a tree that can't be cut down or a building that can't be torn into, they need to be trapped out. 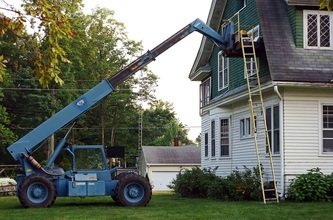 It's really the last option of removal. 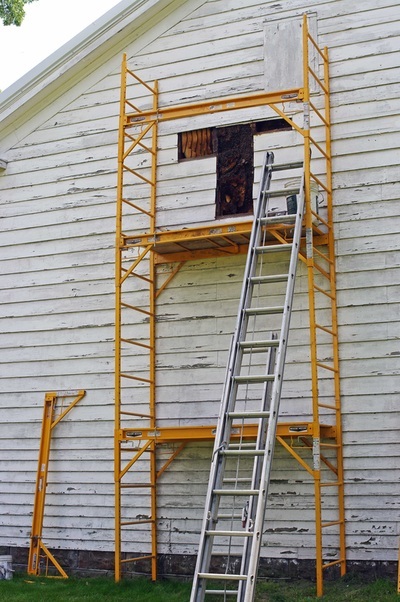 There are a few drawbacks to this method, though. 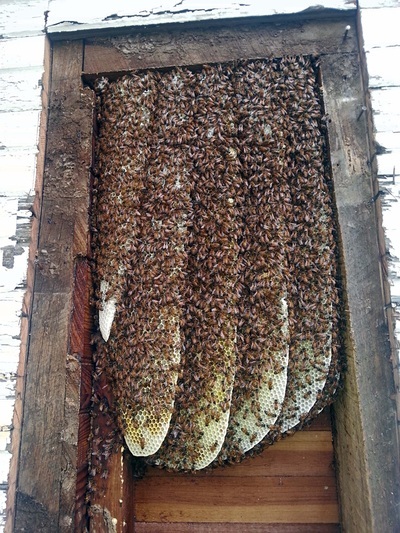 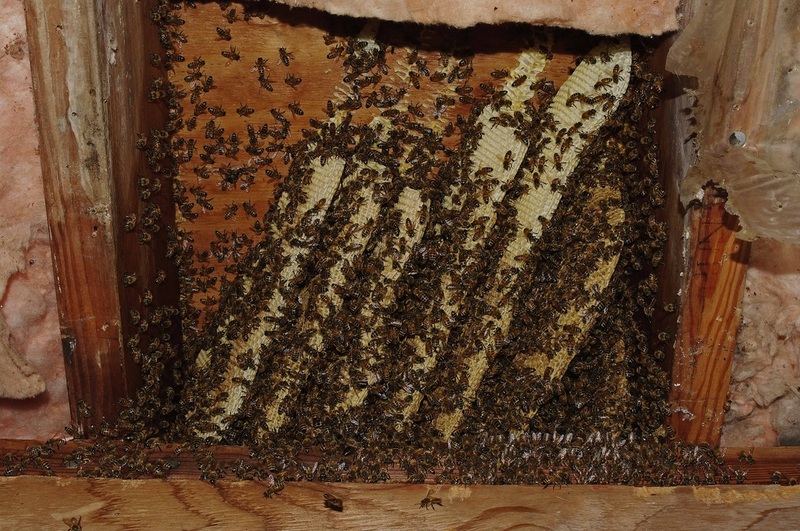 It can take up to 2 months, a box of bees must brought in (which at first doesn't make sense if the plan is to be getting rid of bees), and you lose the queen of the colony in the process. 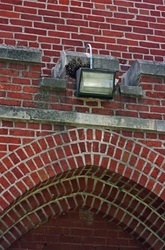 All but one of the entrances must be closed and the remaining entrance needs to be covered with a wire cone, sort of like a fish trap. 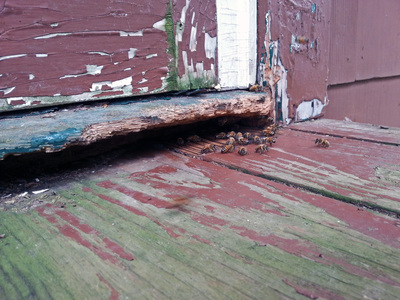 The bees crawl out, but can't find their way back in. 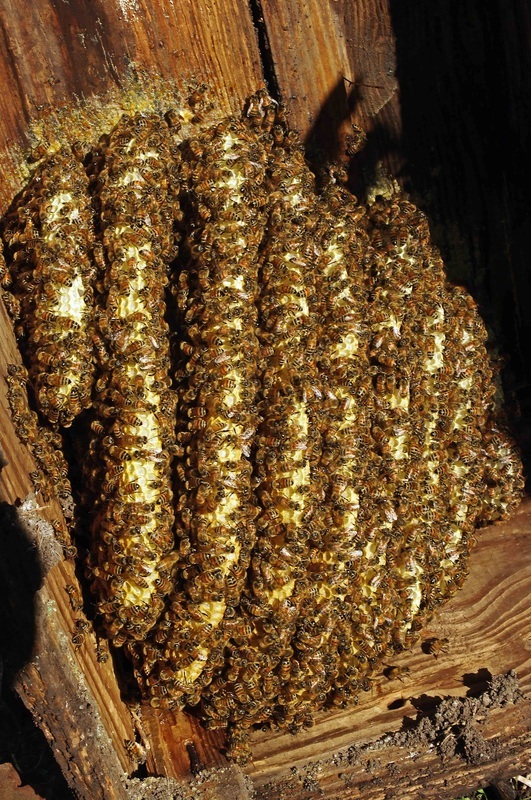 Due to the life cycle of the bees, 3 weeks from the time the eggs are laid until they hatch, then the first 3 weeks of the bees life is spent inside the hive, it will take a minimum of 6 weeks from the time the eggs are laid to the time the bees leave the hive. 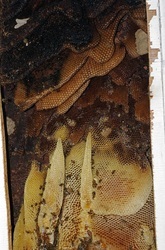 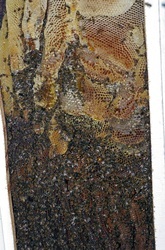 The queen can take a week or more to stop laying eggs after the entrance is reduced depending on the amount of stores in the hive. 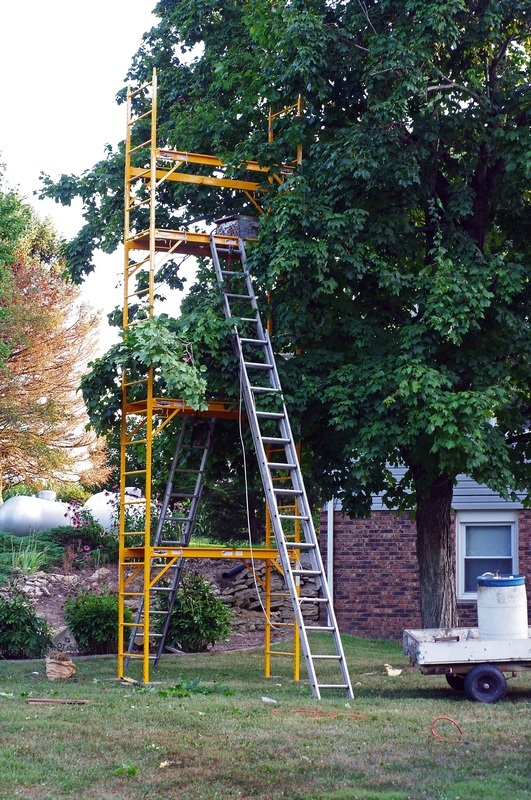 It's best to figure 1 1/2 - 2 months. 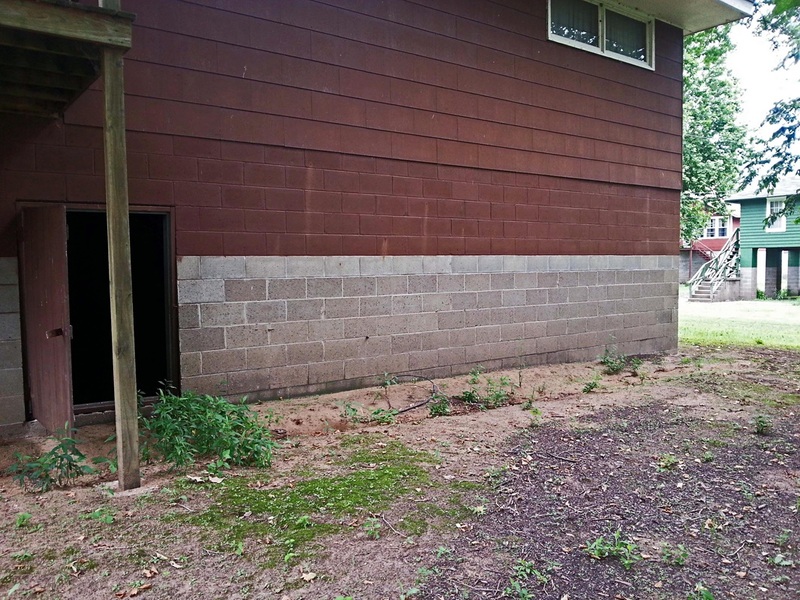 If you missed closing an entrance or they find or make a new one at any time during the trap out, then everything starts over at day one. 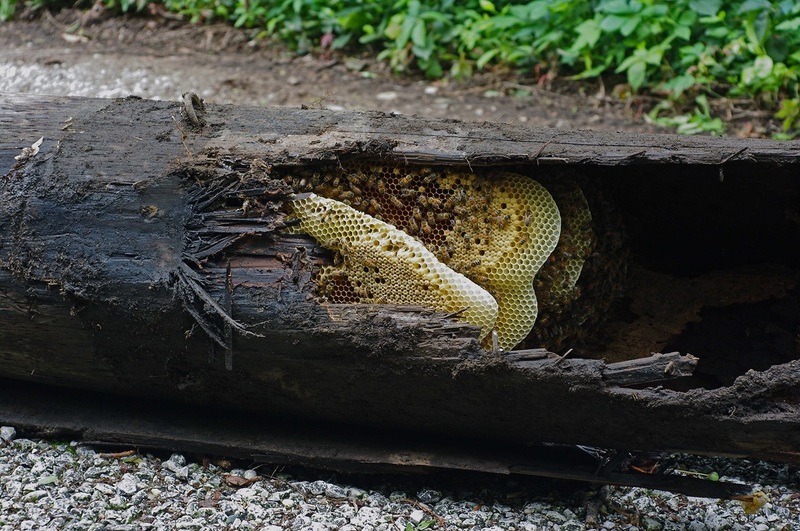 It's best to check the hive regularly, at least at first. The colony queen will sometimes leave with a small bunch of the remaining bees or she will die in the hive. 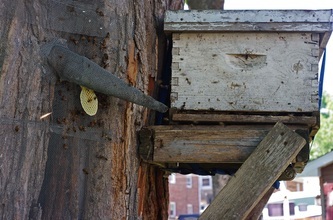 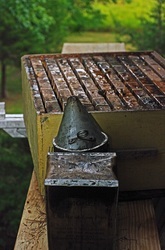 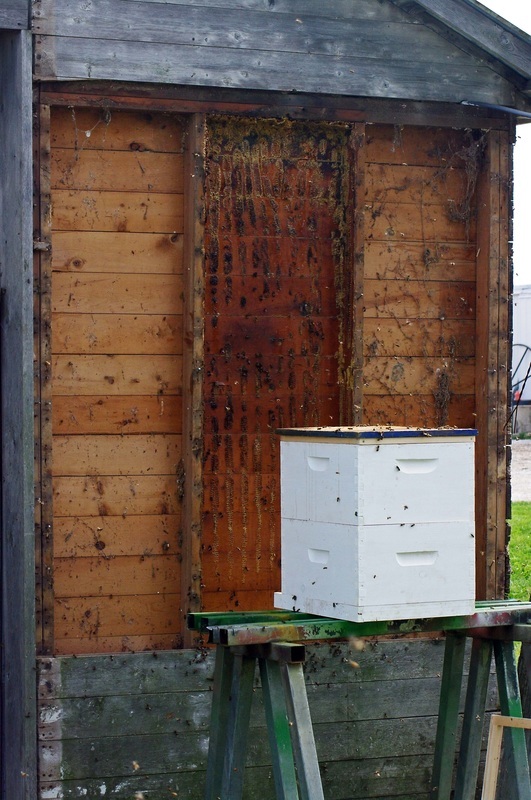 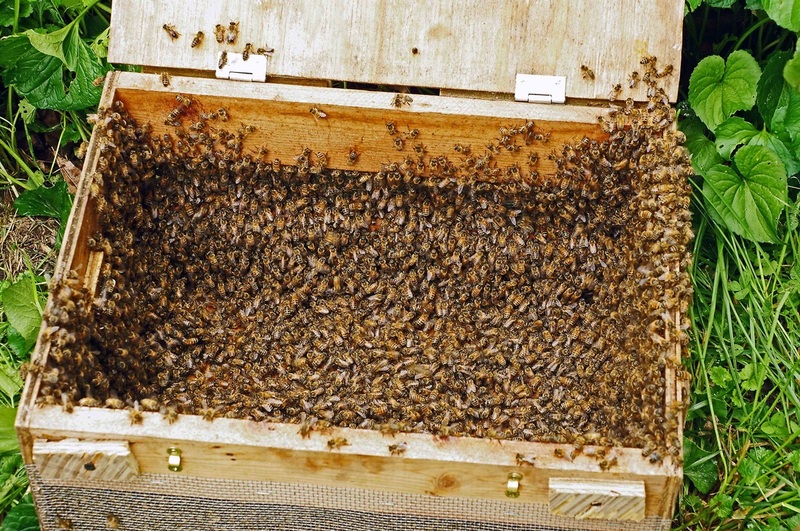 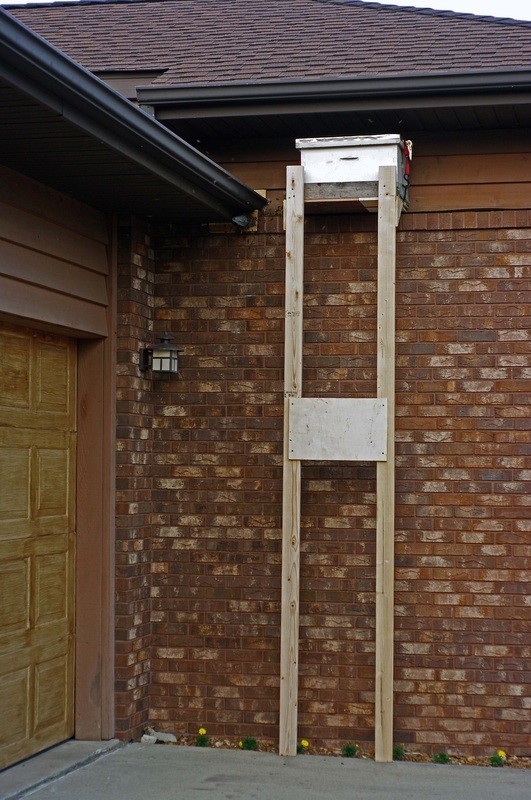 The box with empty frames or comb and a couple of frames of bees, brood, and eggs will become the colony's new home. 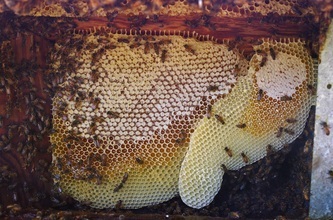 Eggs are needed for them to raise a new queen. If a queen is brought in with the box, the bees going into the box from the colony will likely kill her as a strange queen.